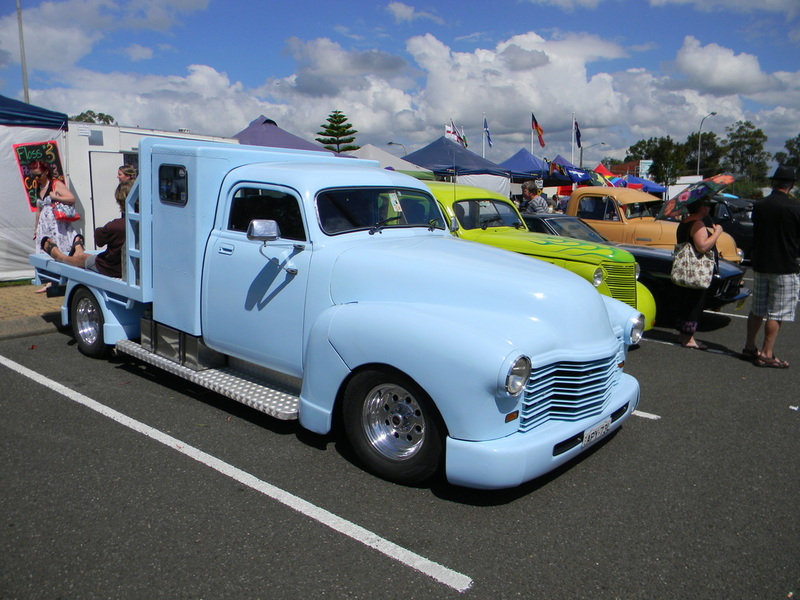 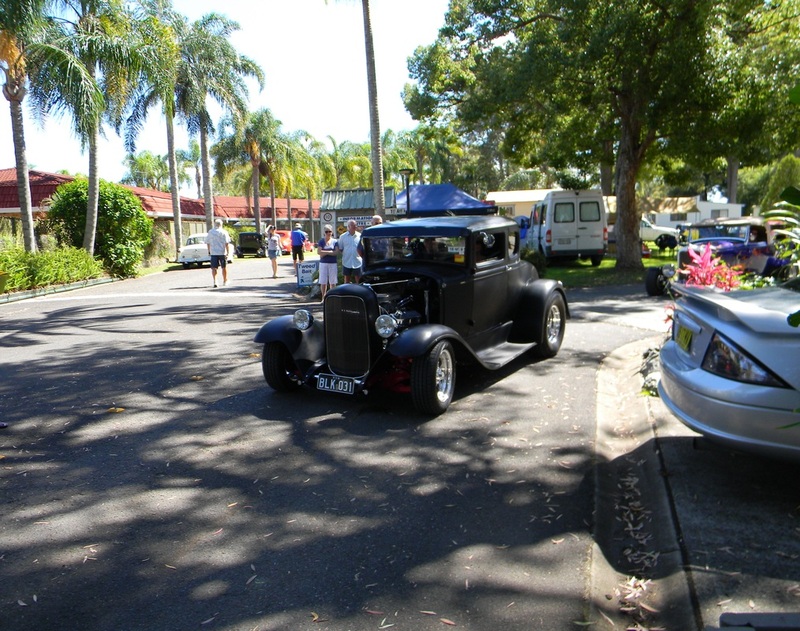 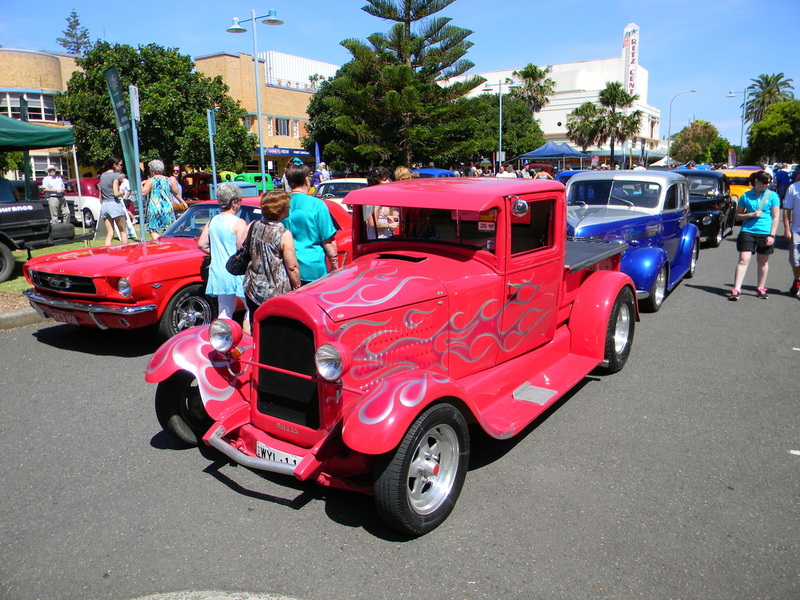 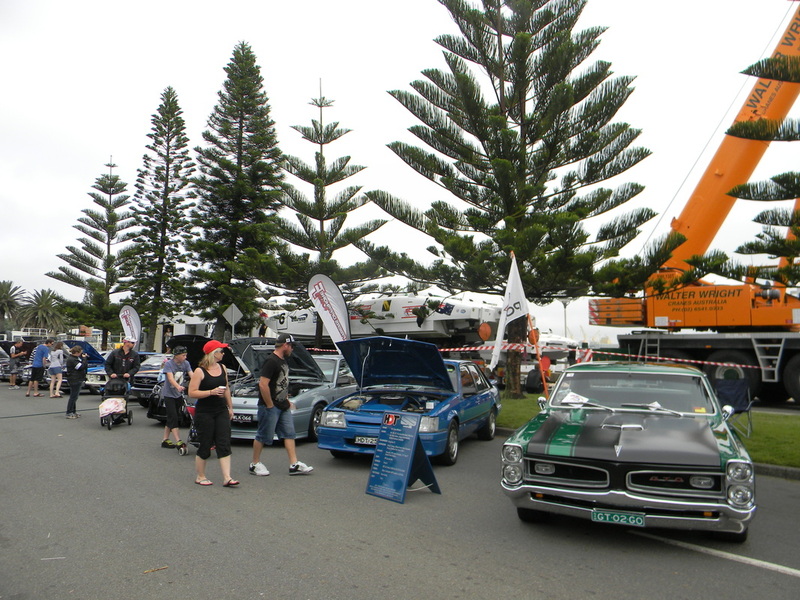 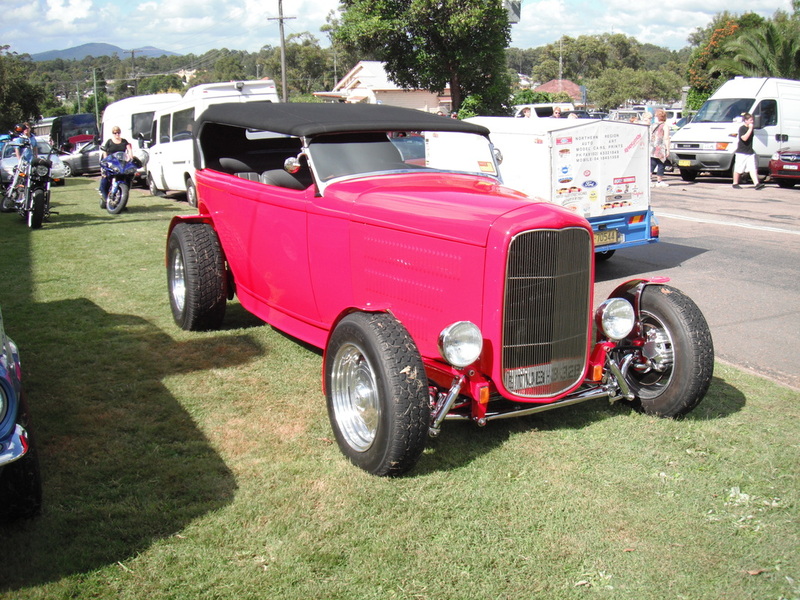 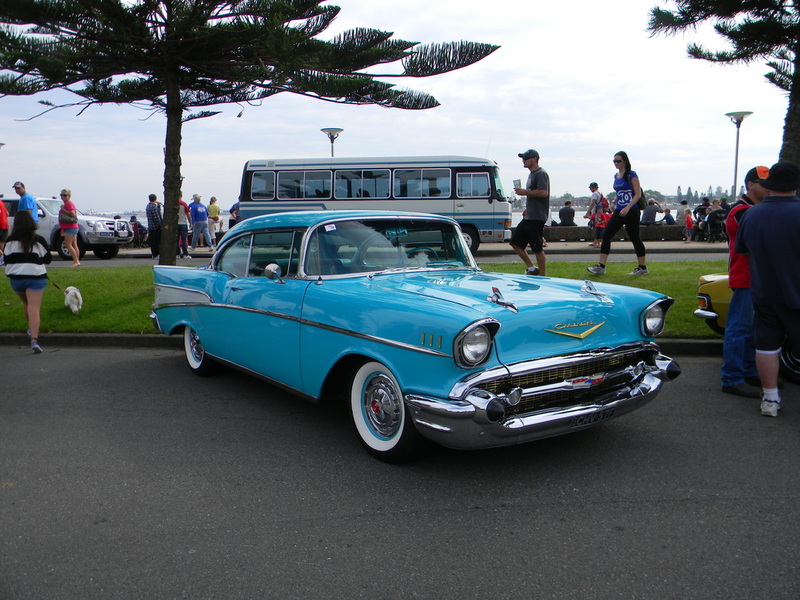 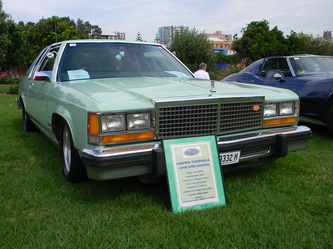 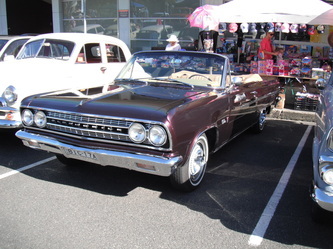 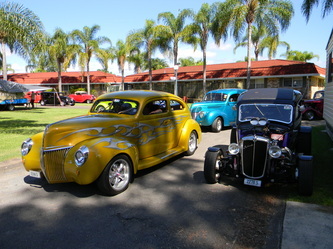 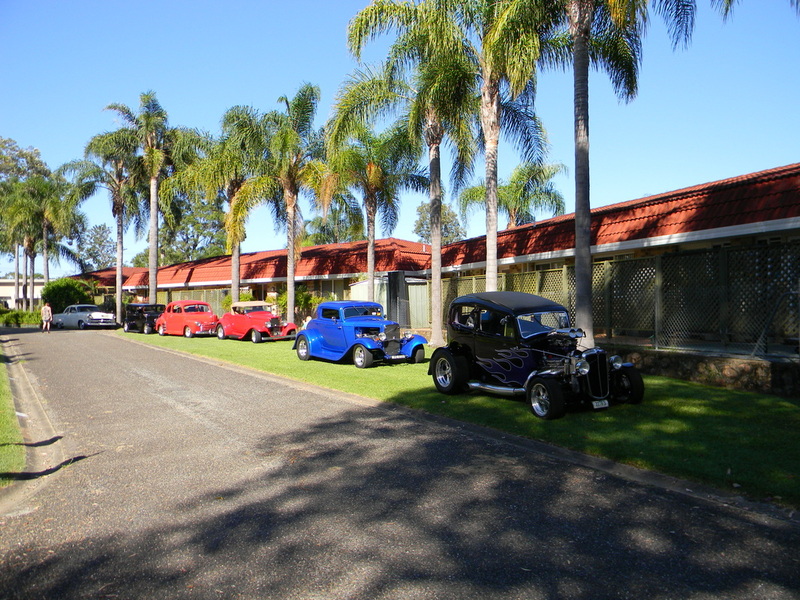 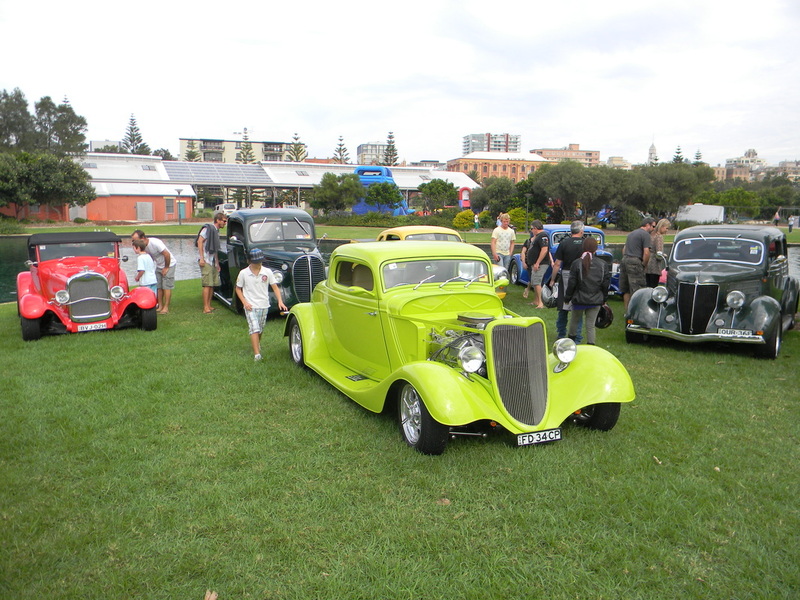 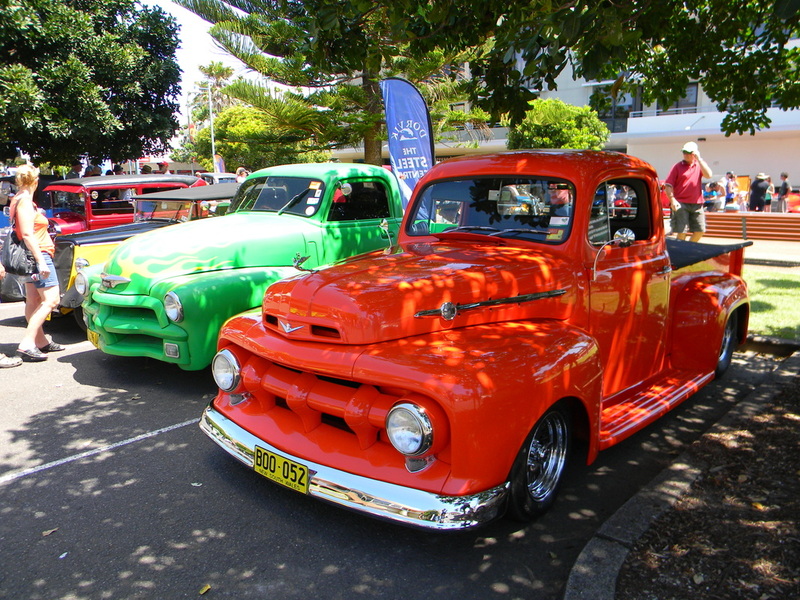 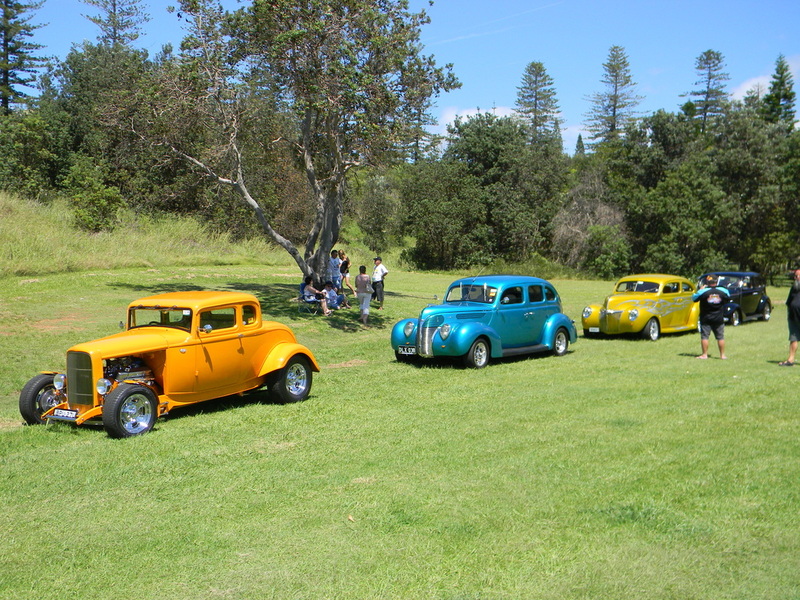 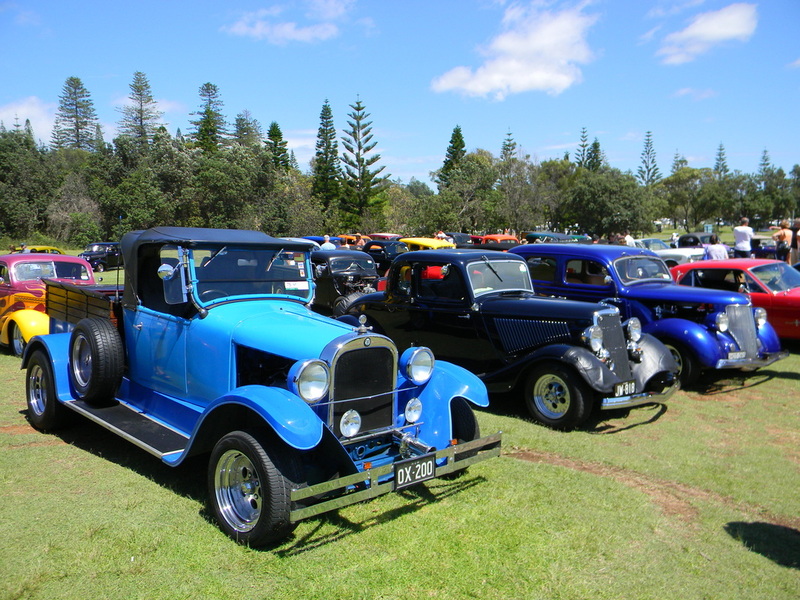 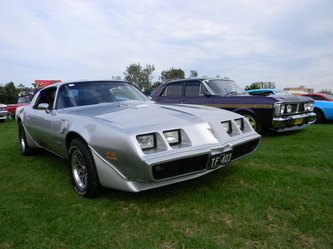 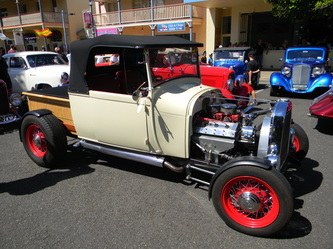 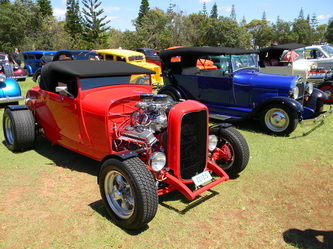 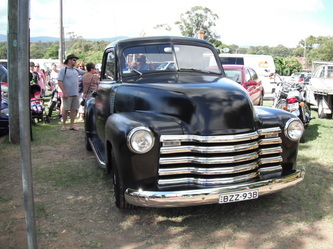 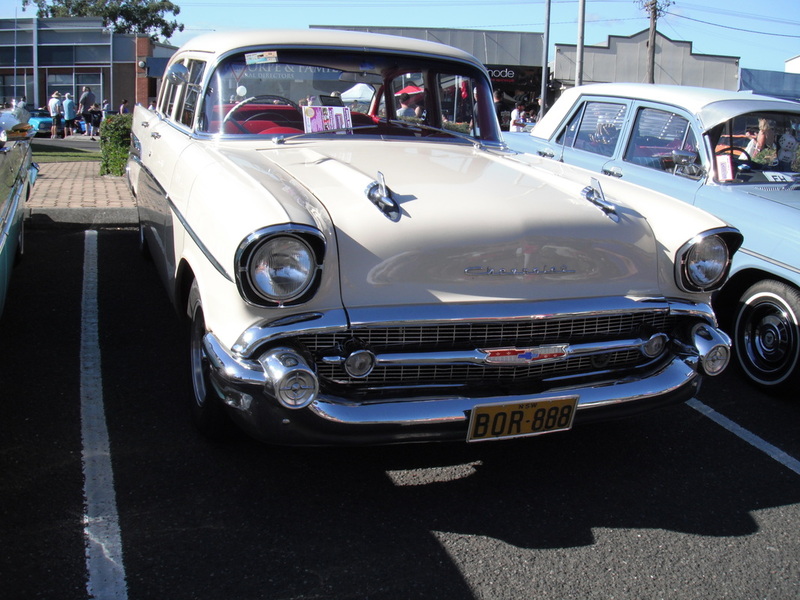 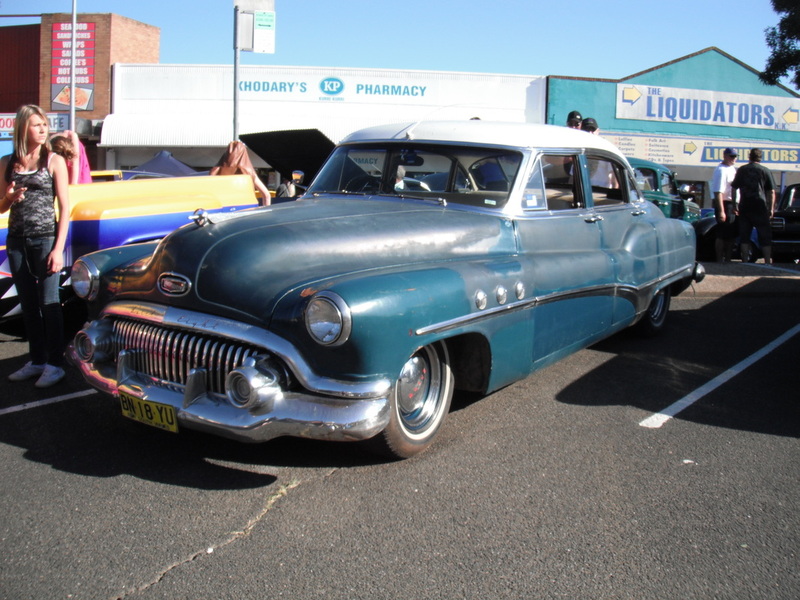 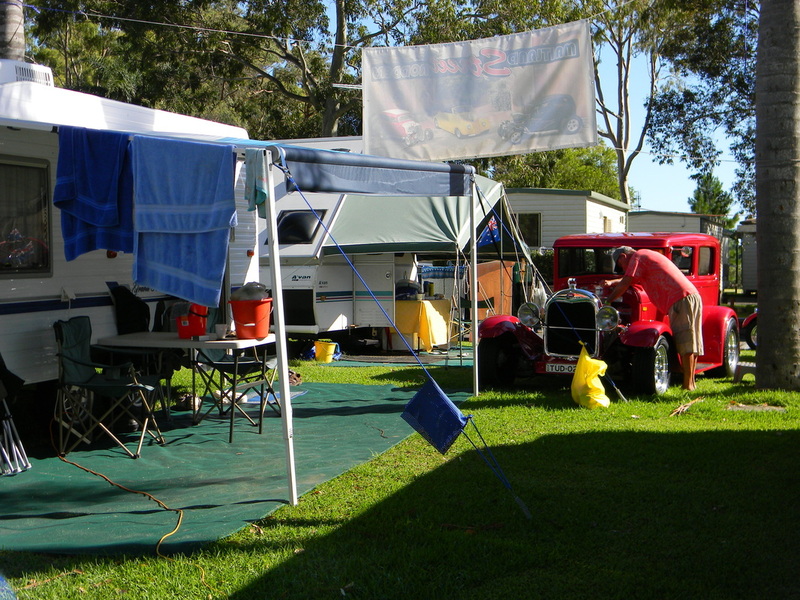 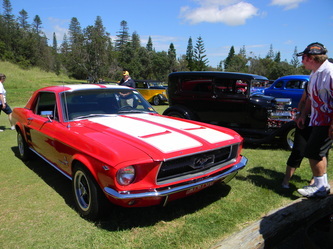 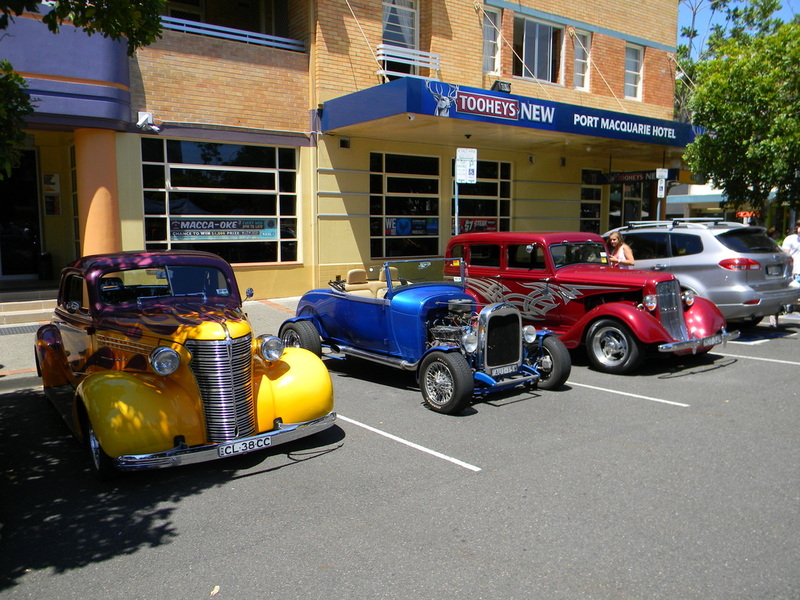 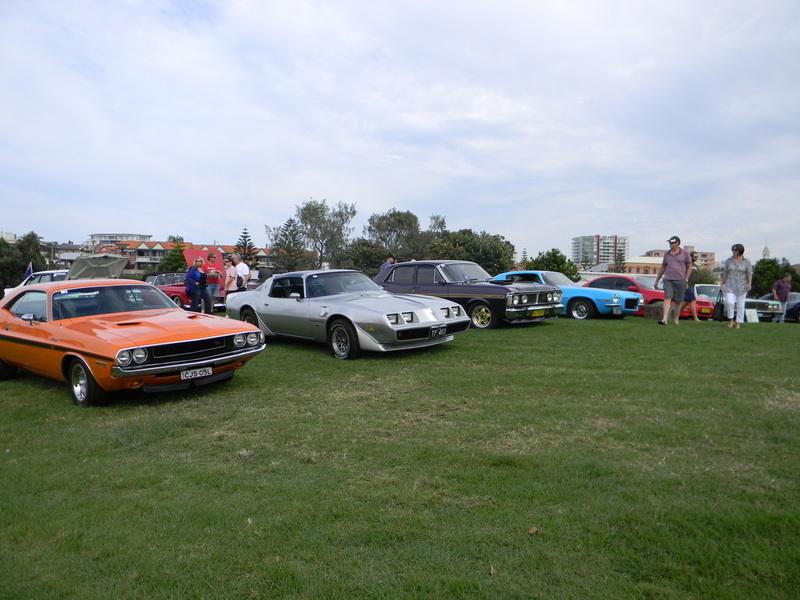 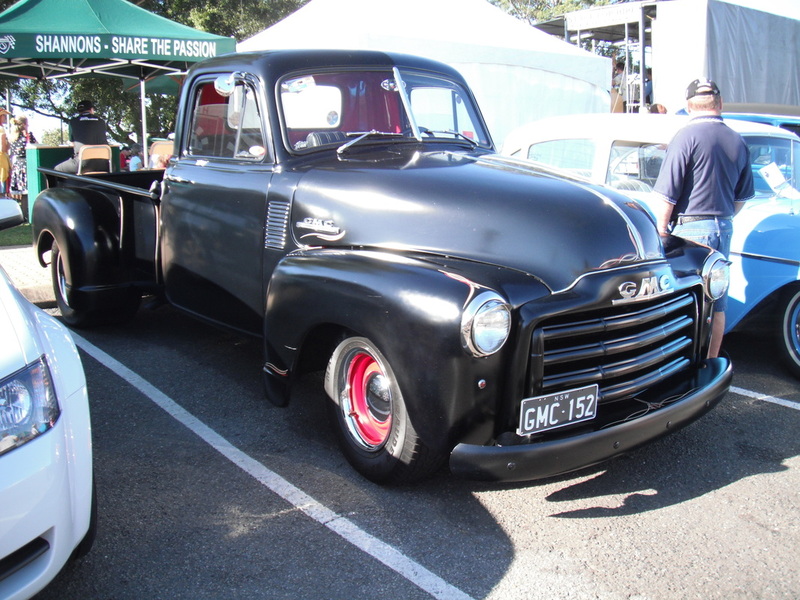 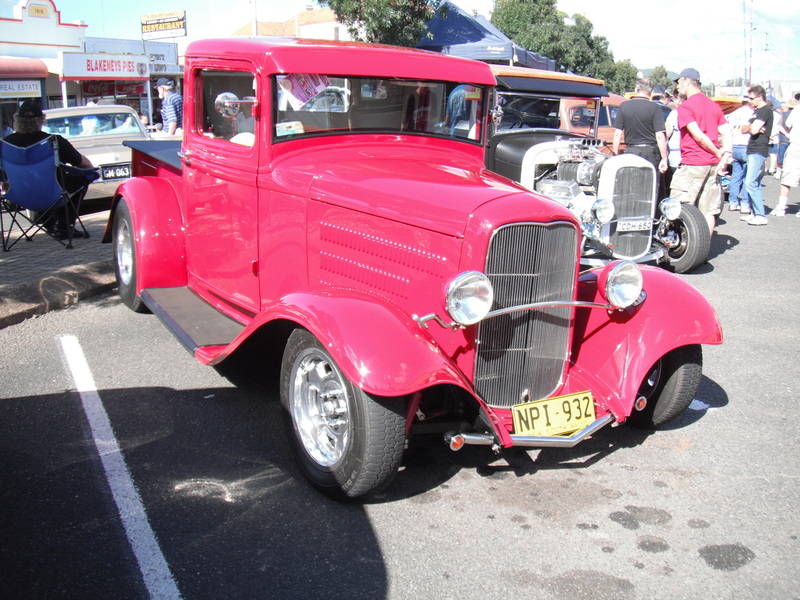 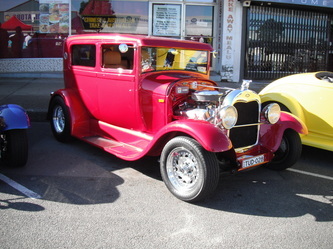 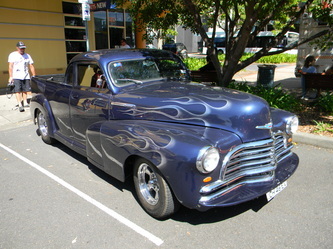 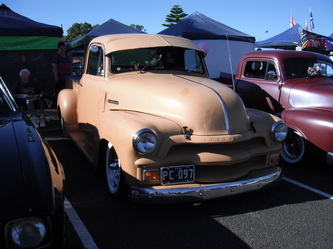 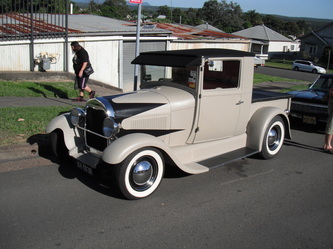 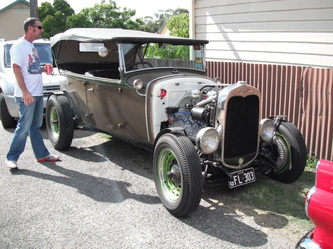 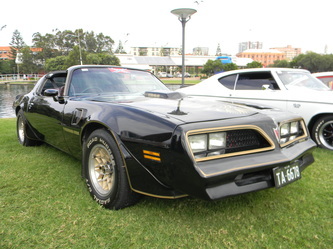 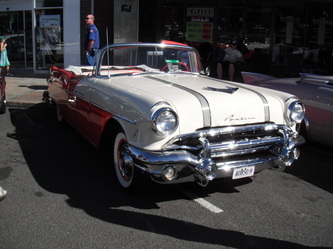 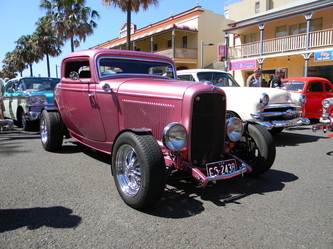 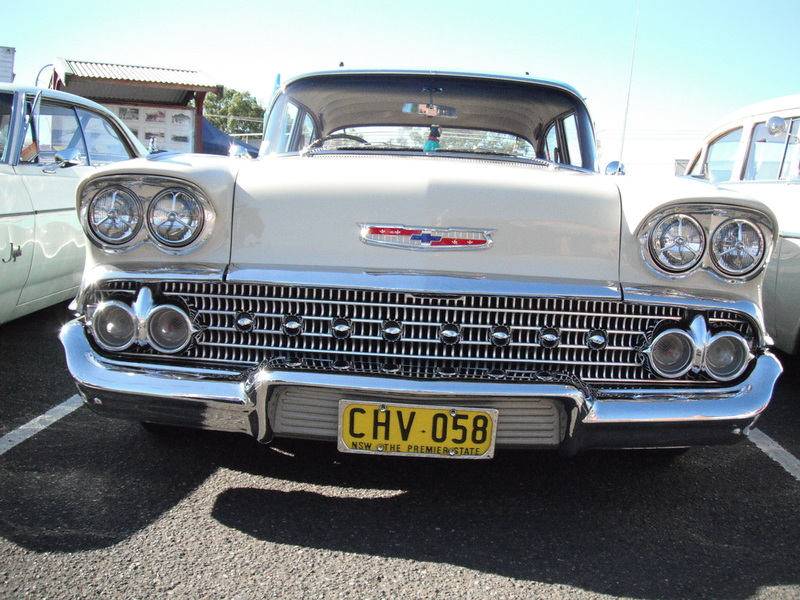 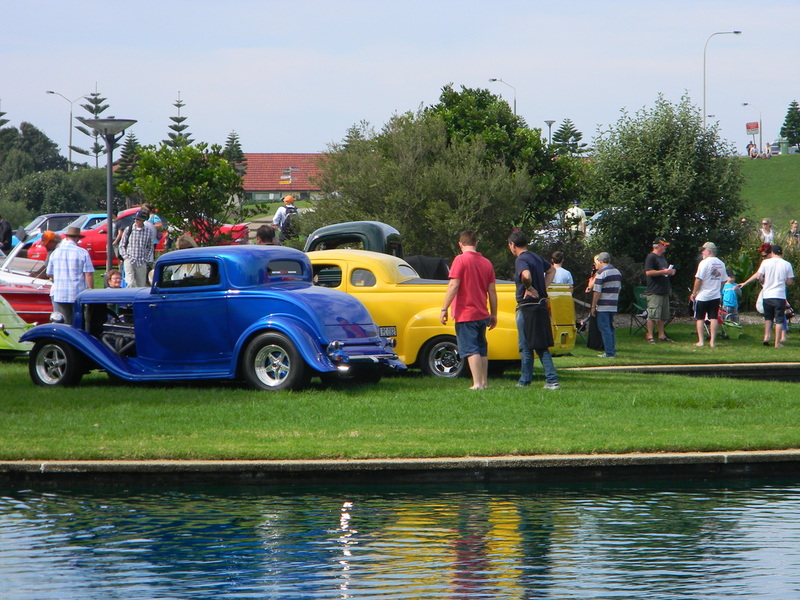 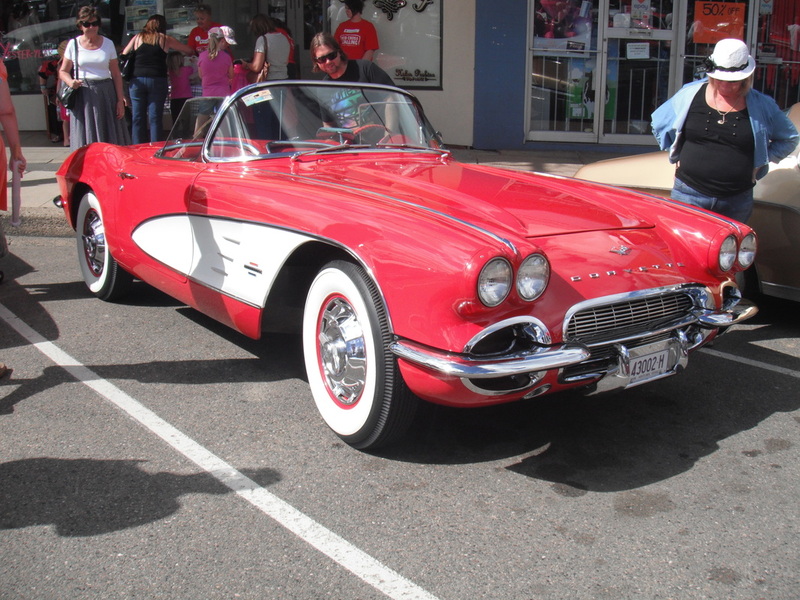 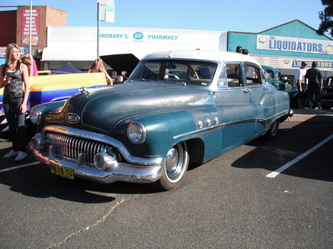 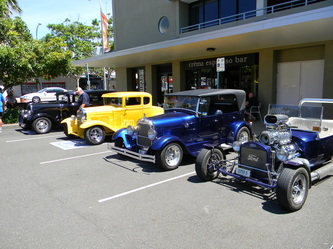 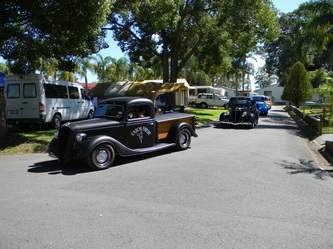 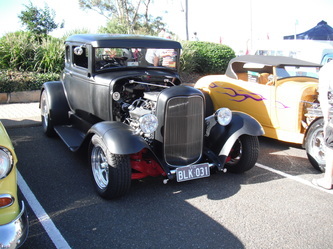 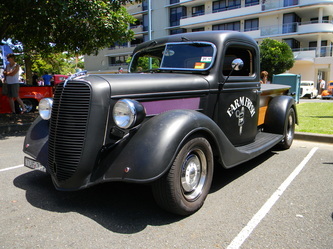 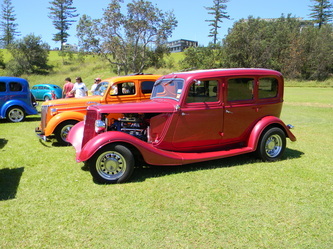 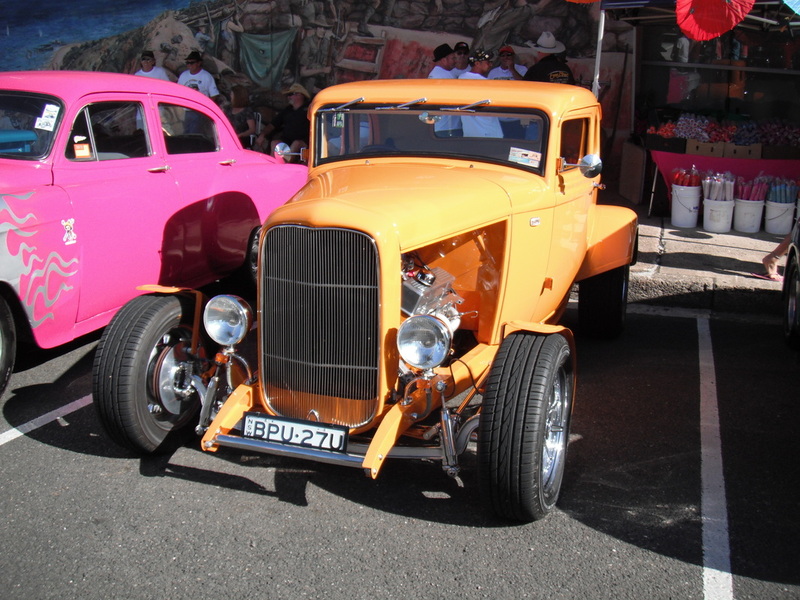 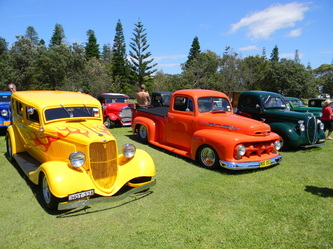 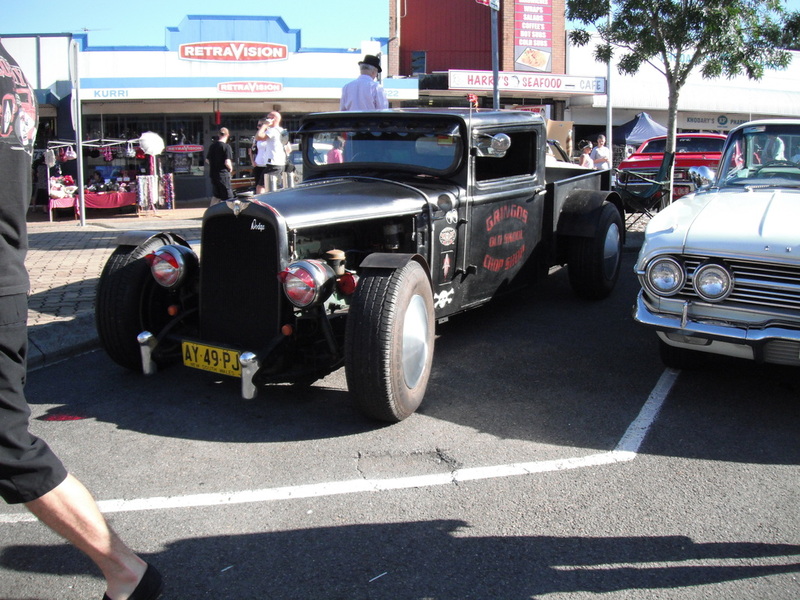 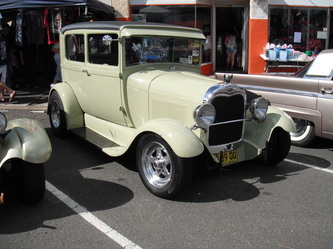 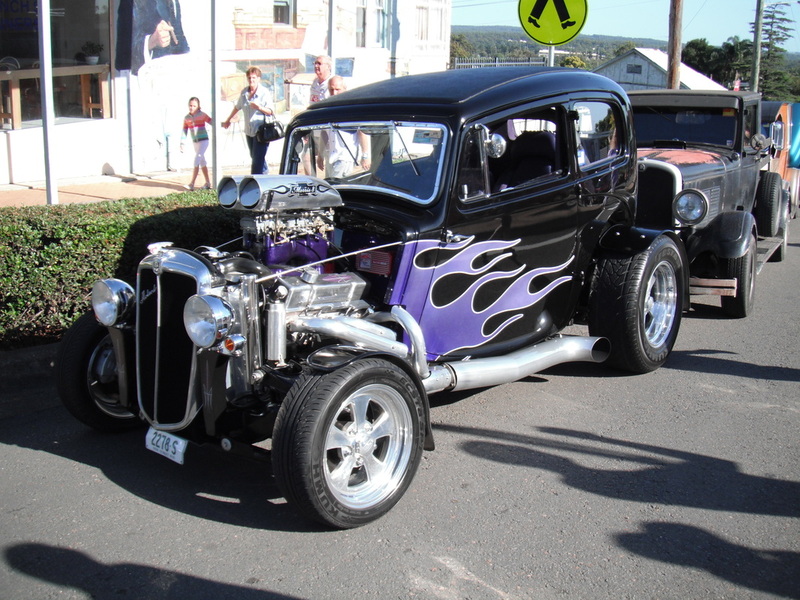 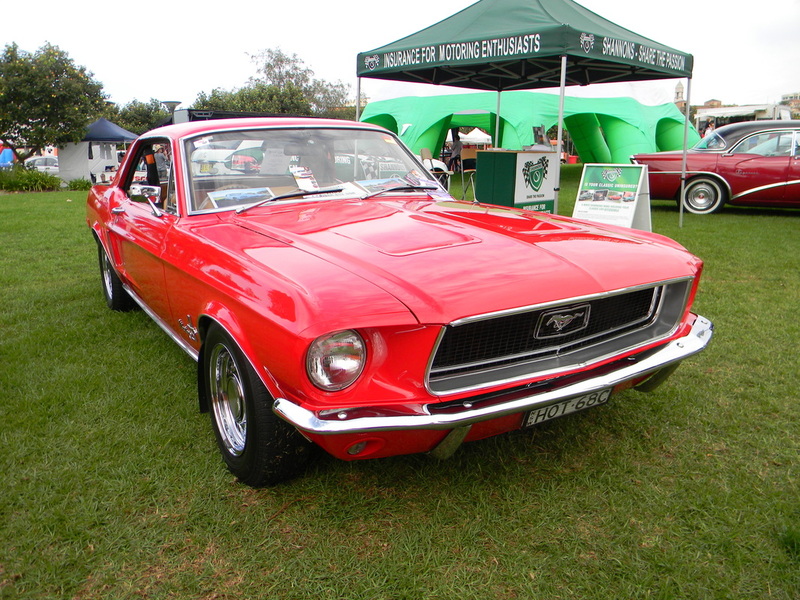 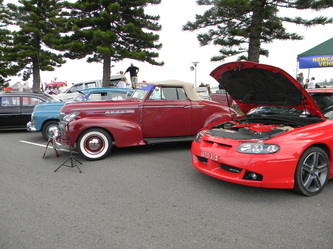 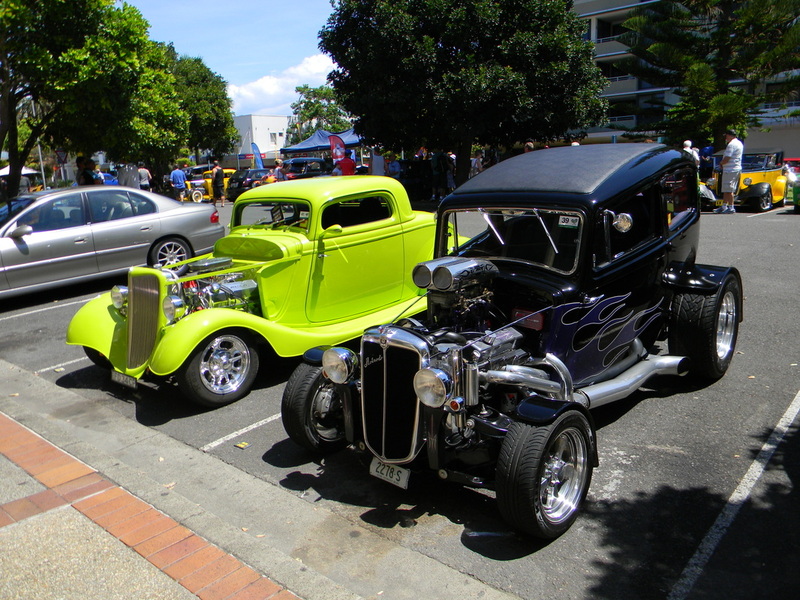 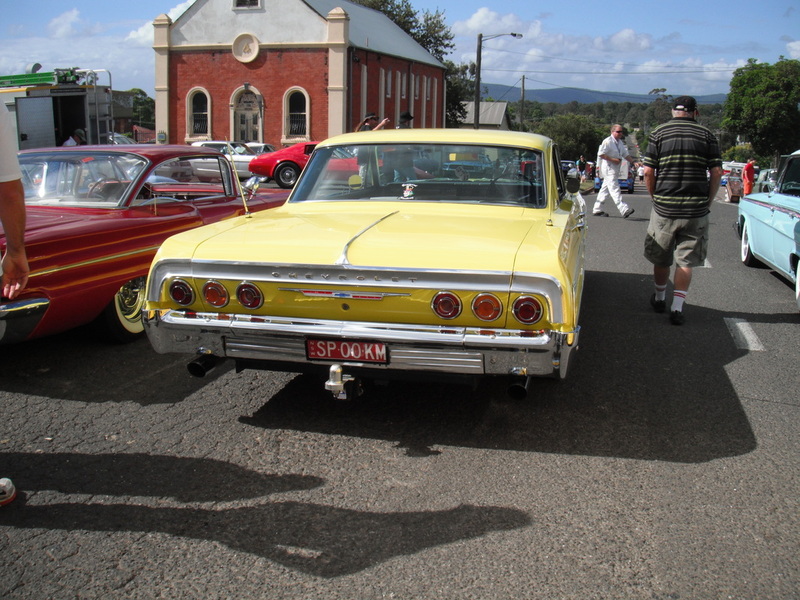 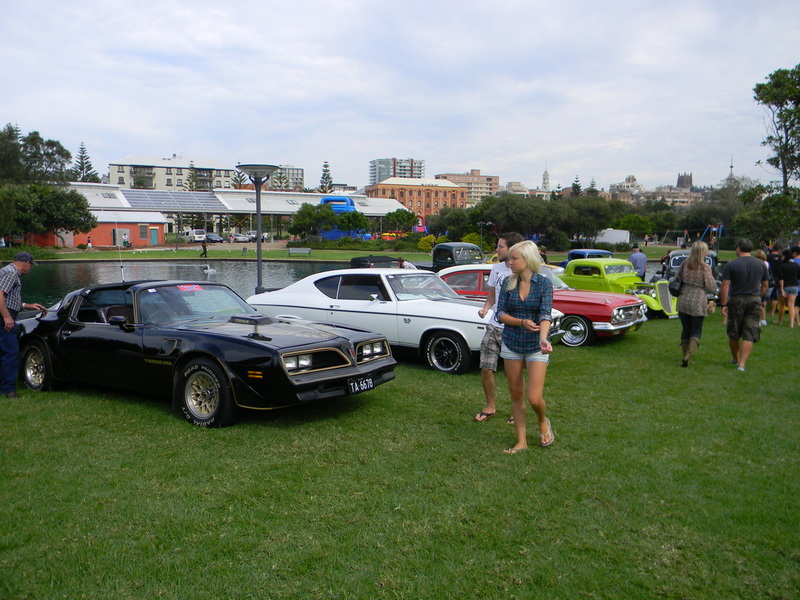 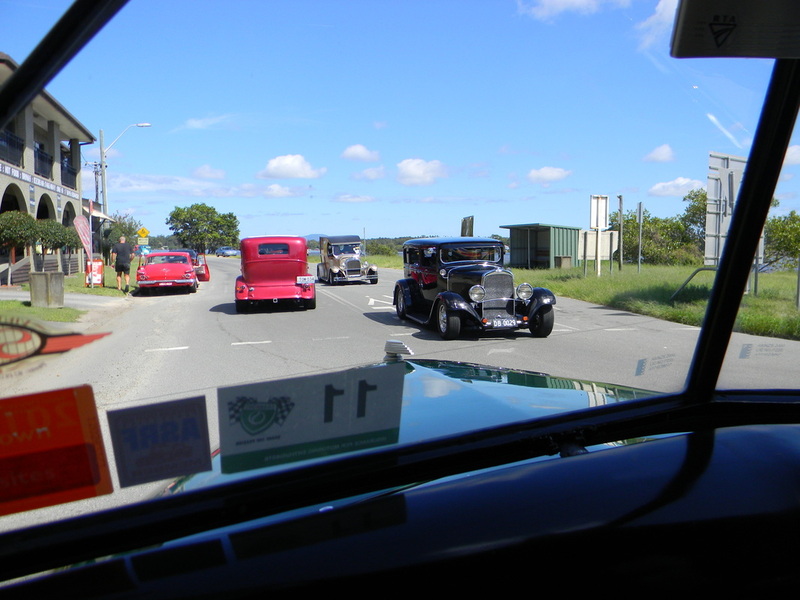 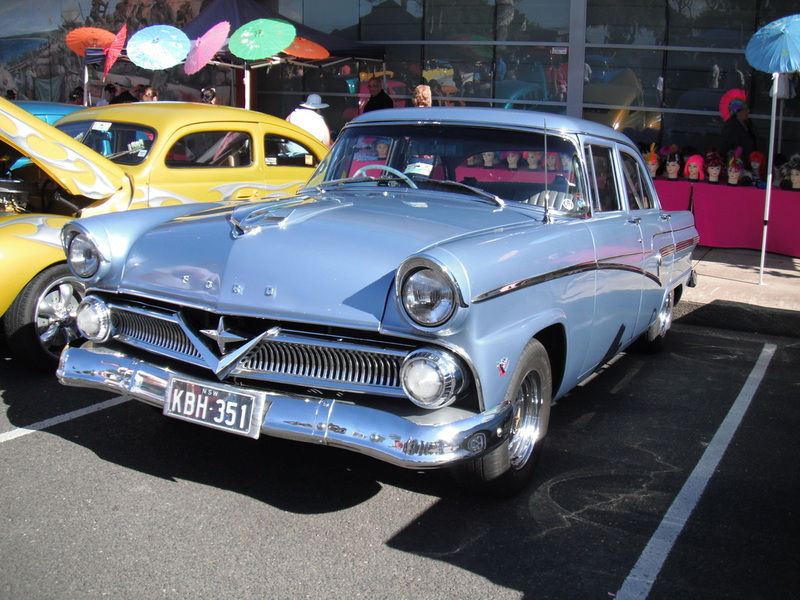 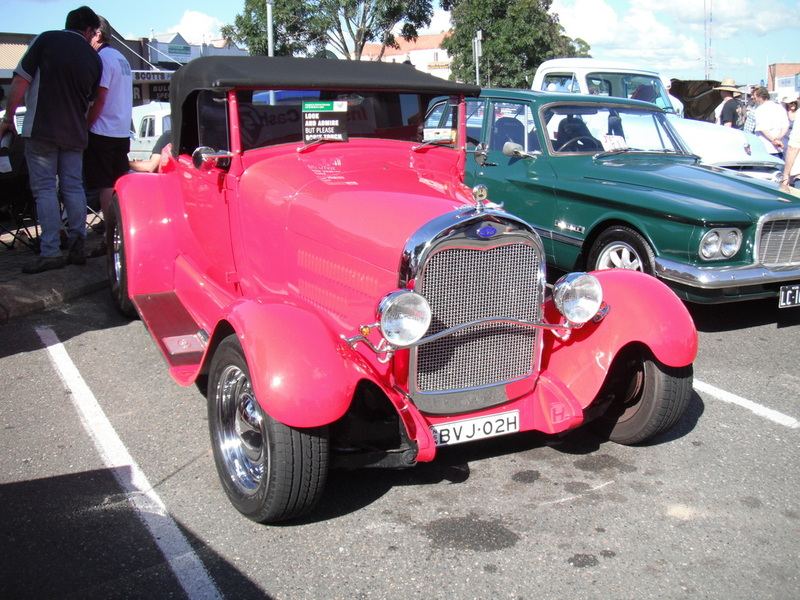 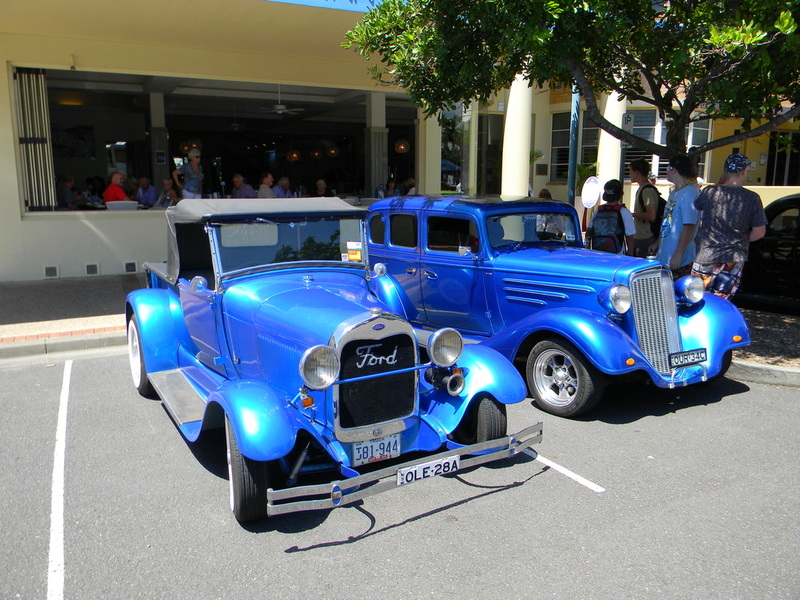 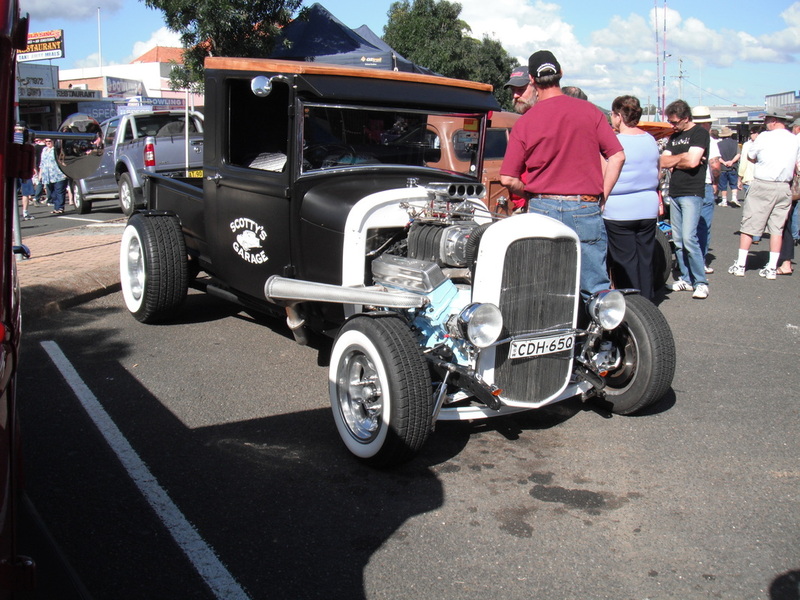 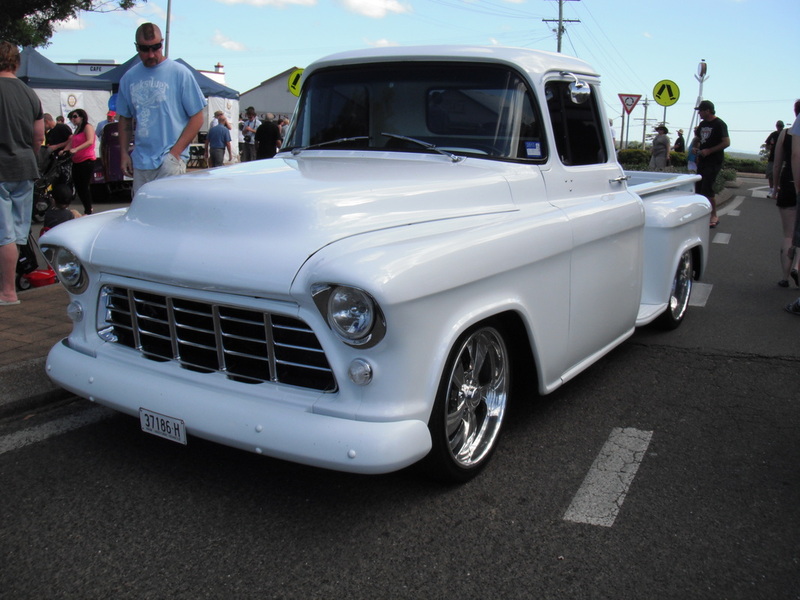 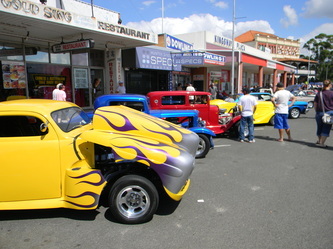 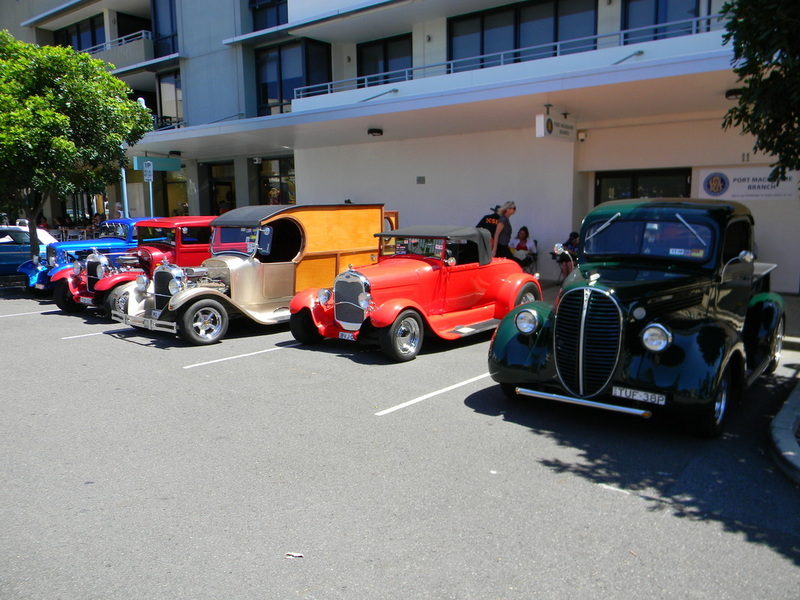 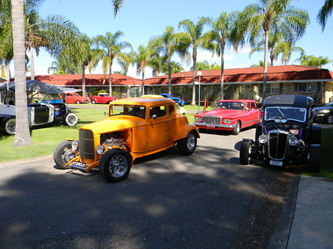 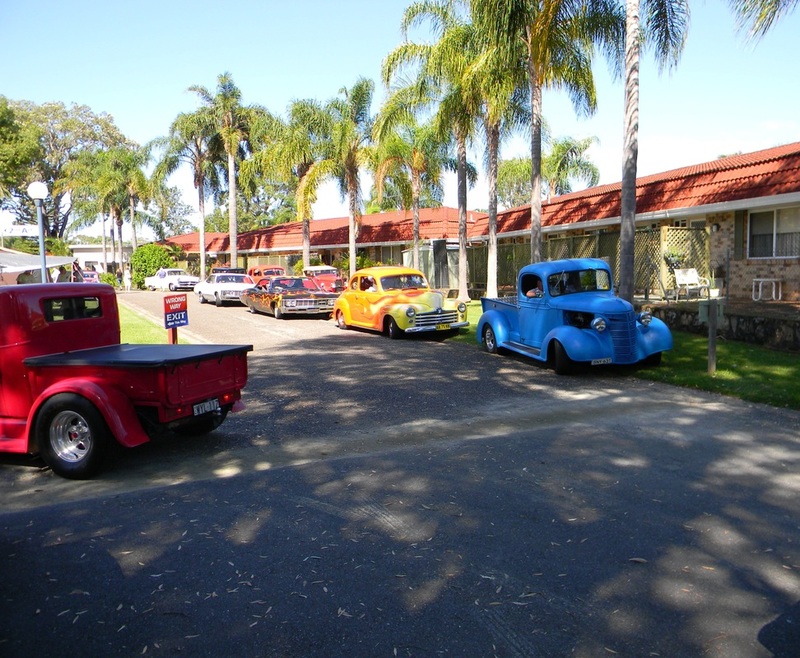 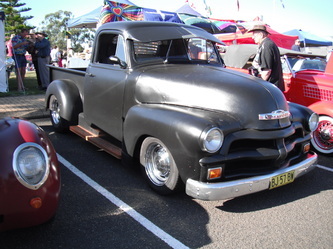 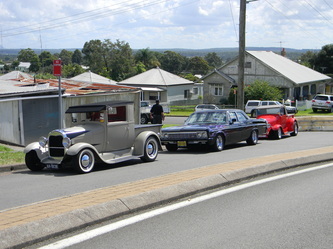 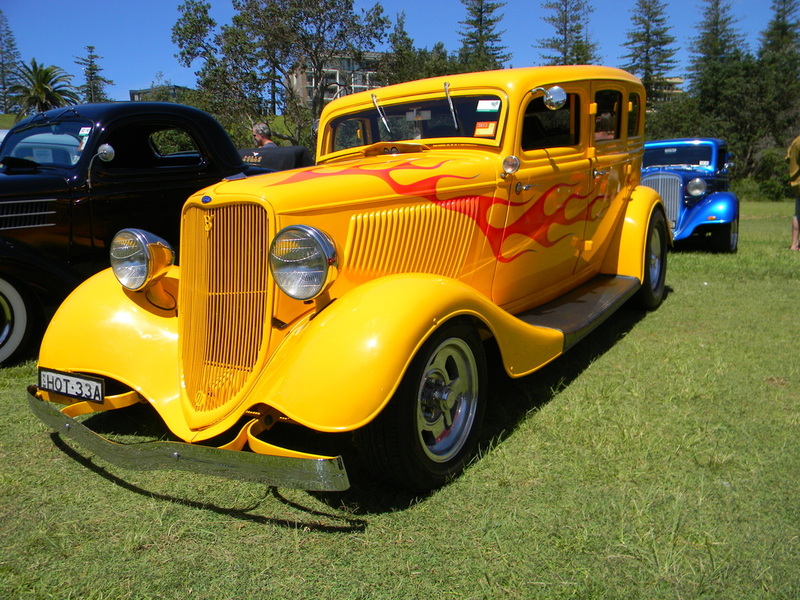 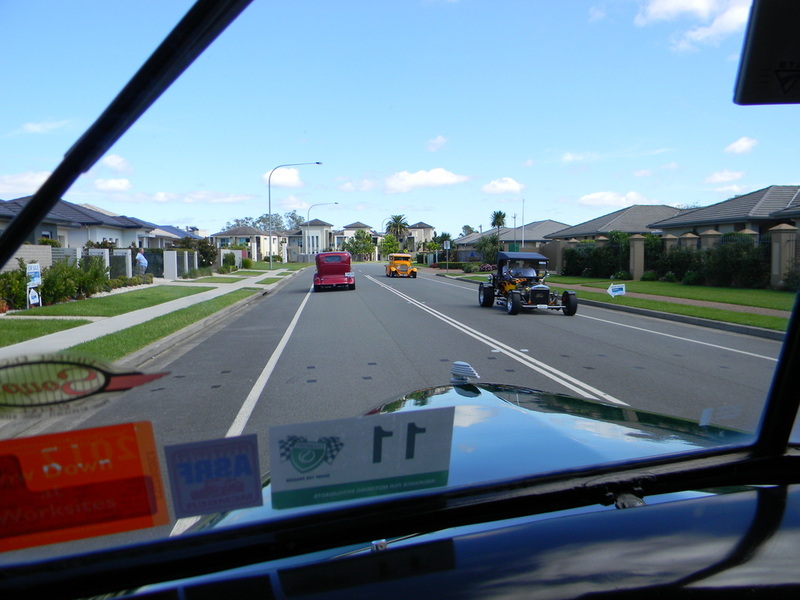 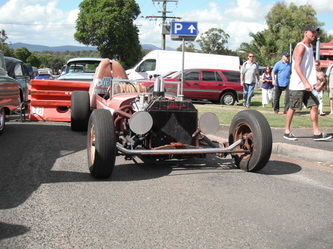 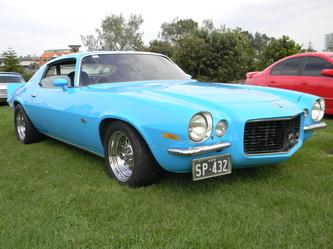 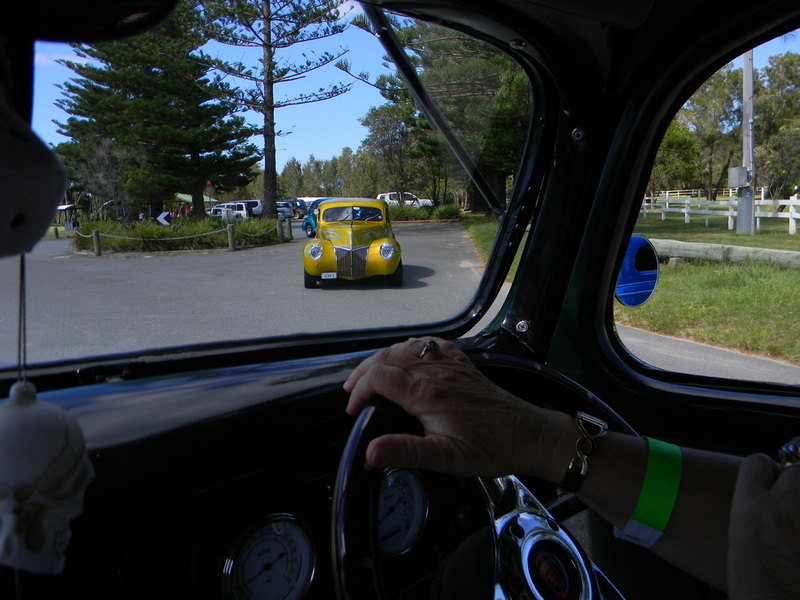 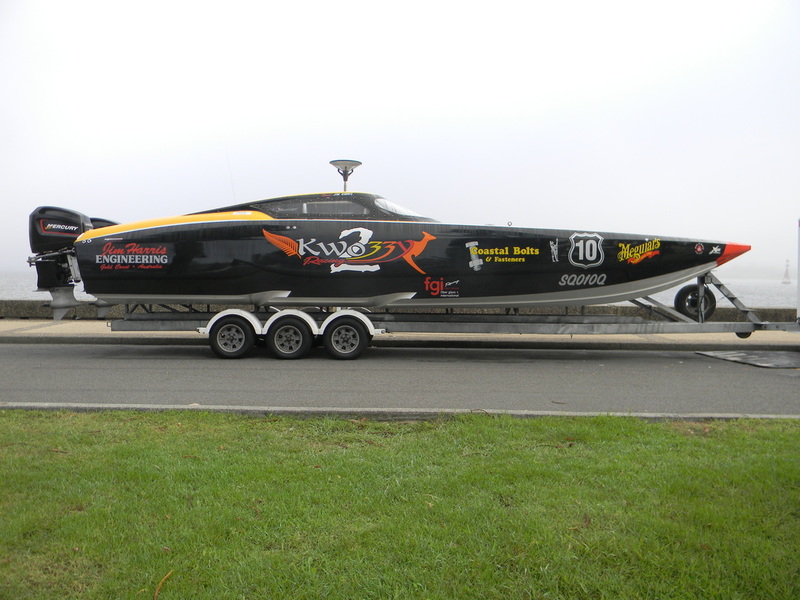 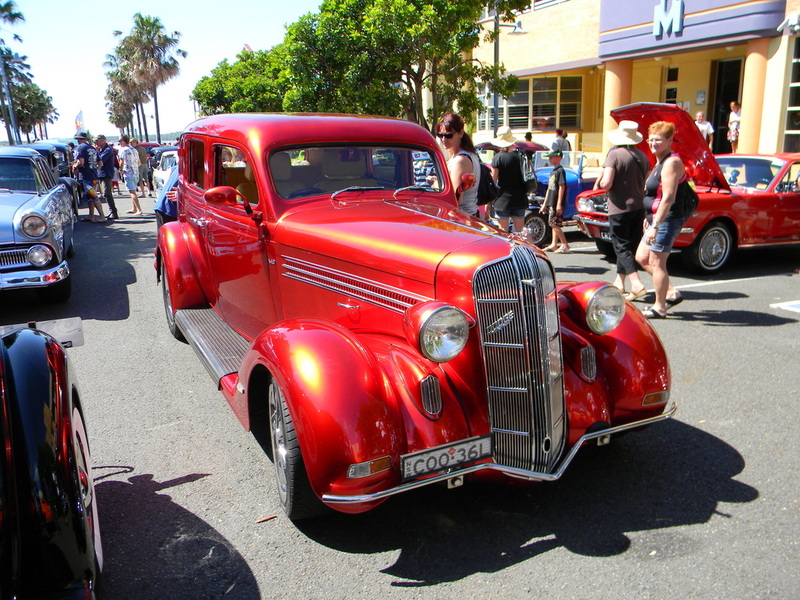 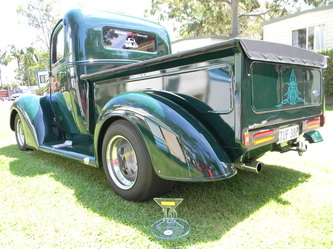 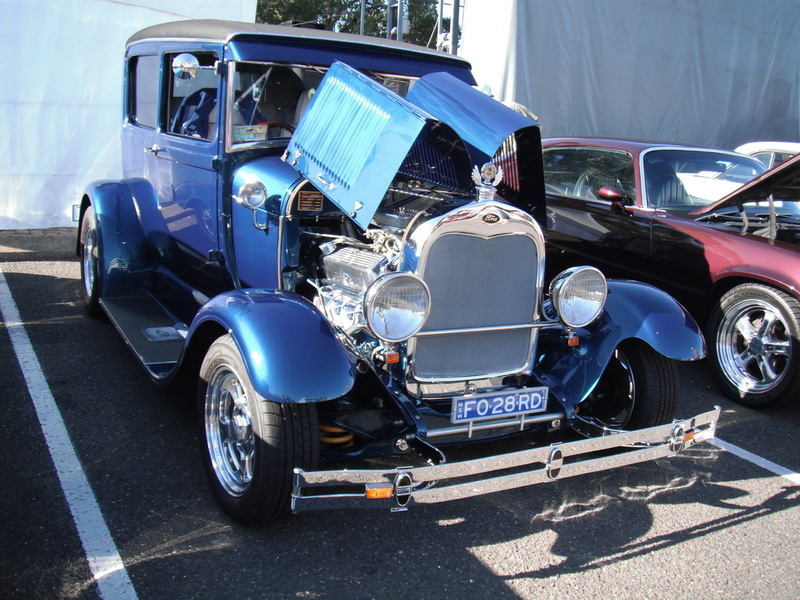 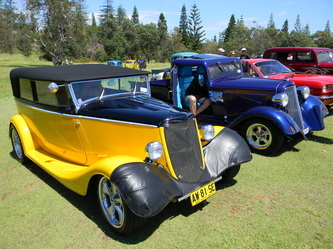 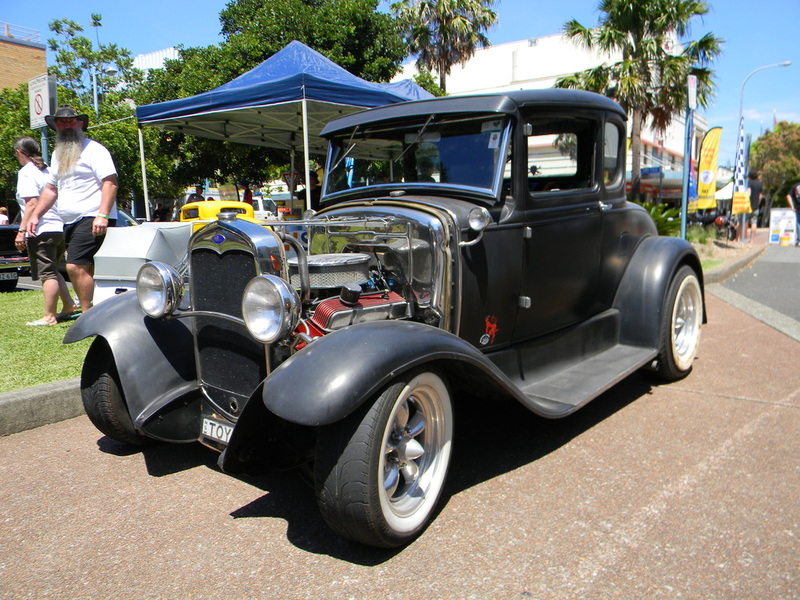 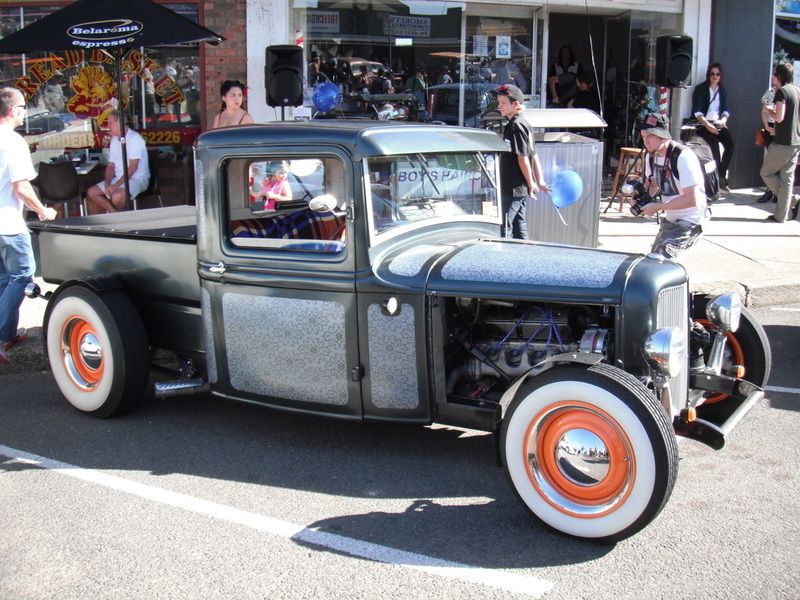 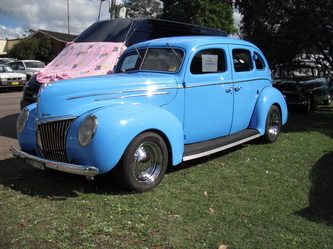 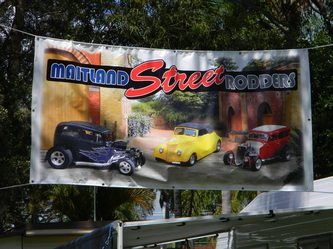 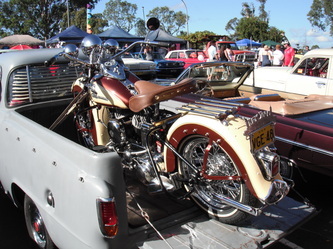 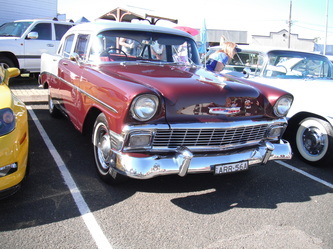 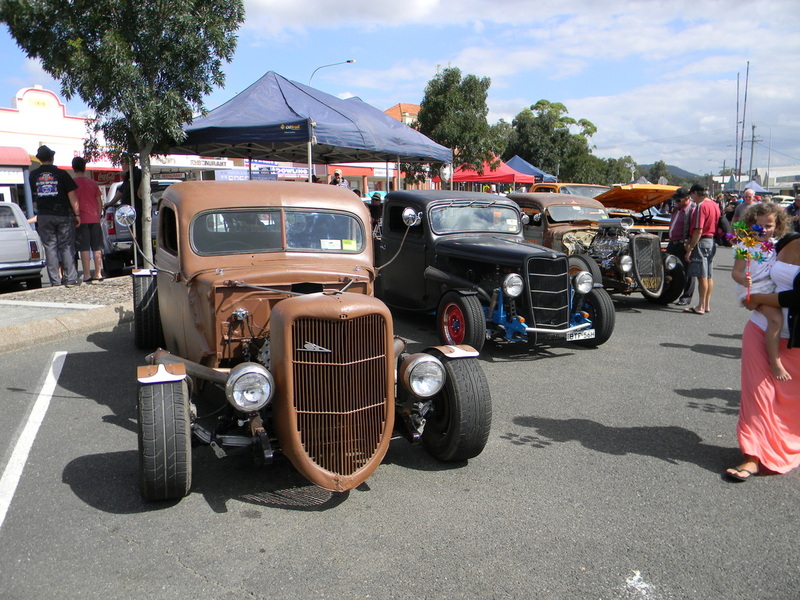 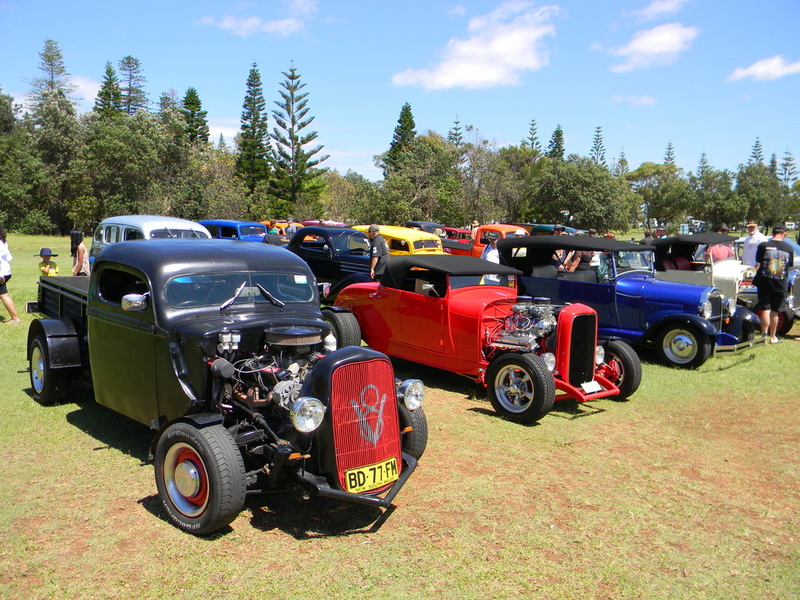 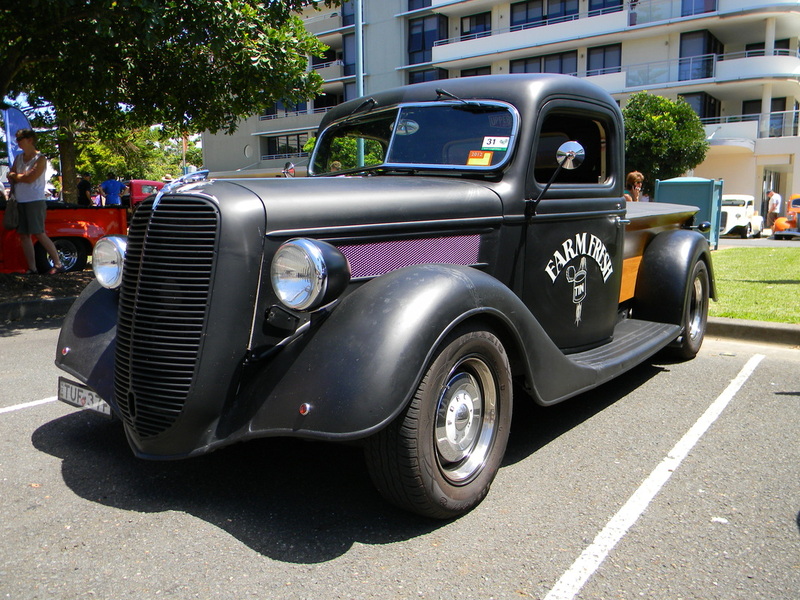 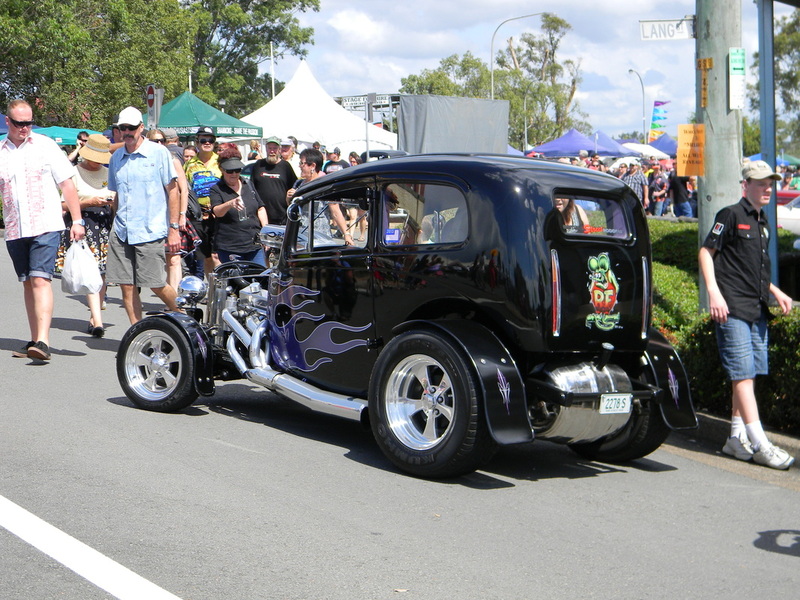 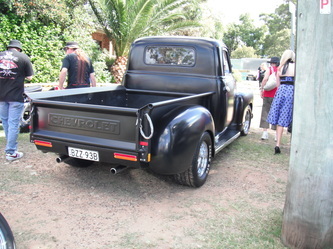 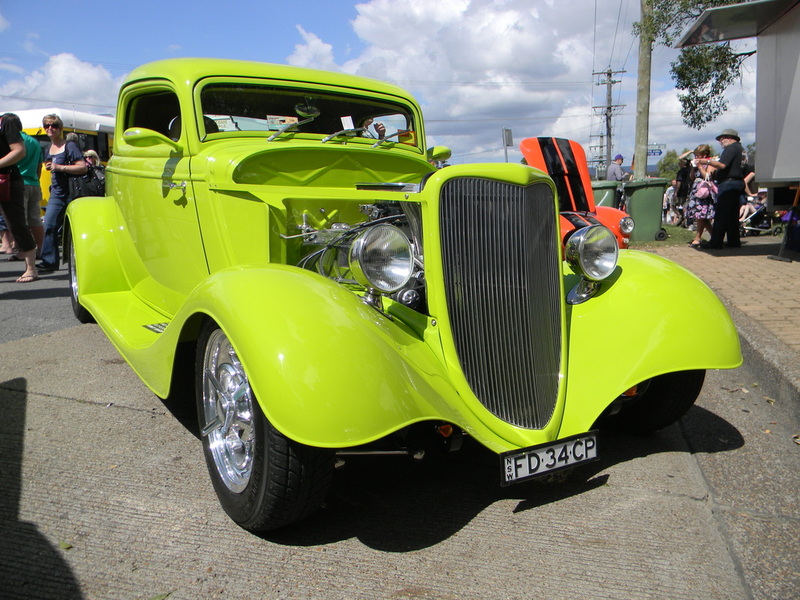 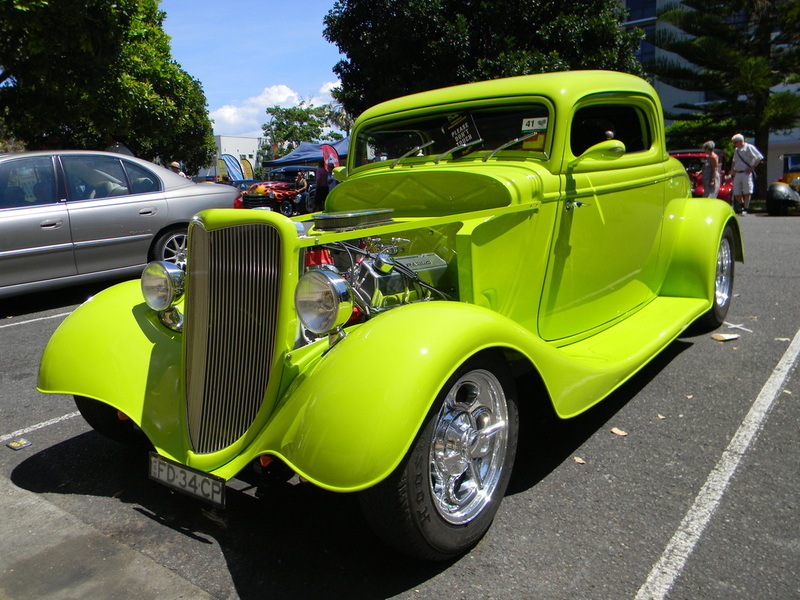 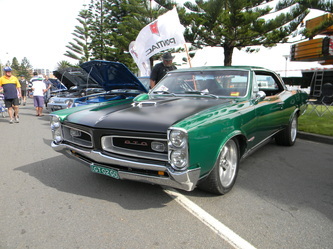 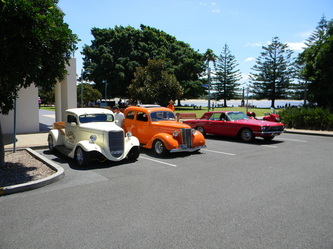 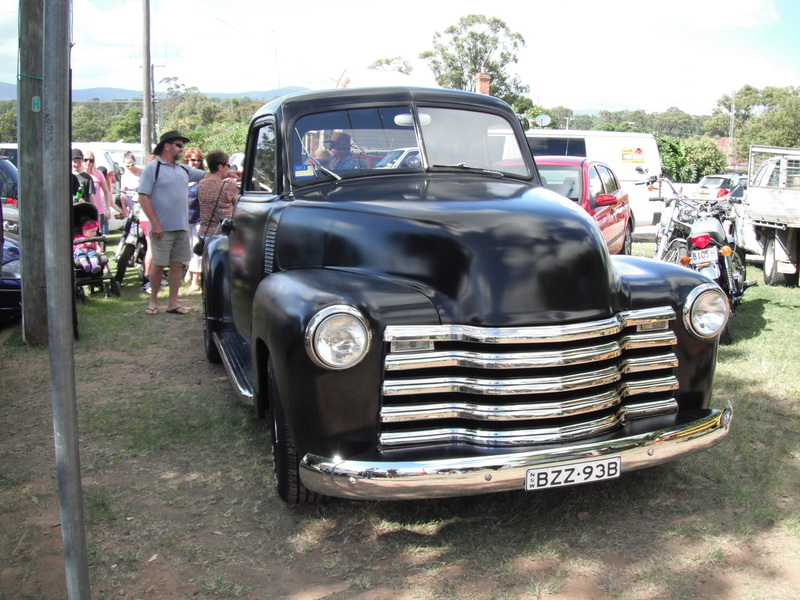 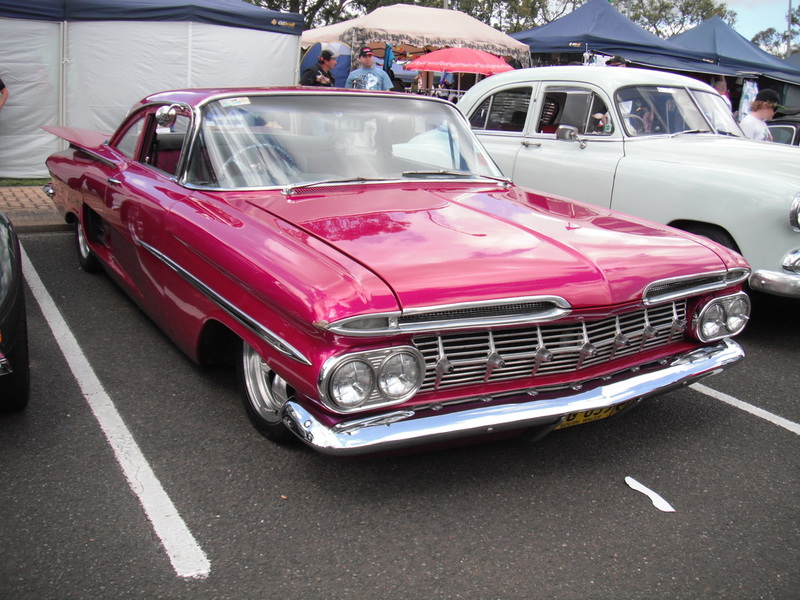 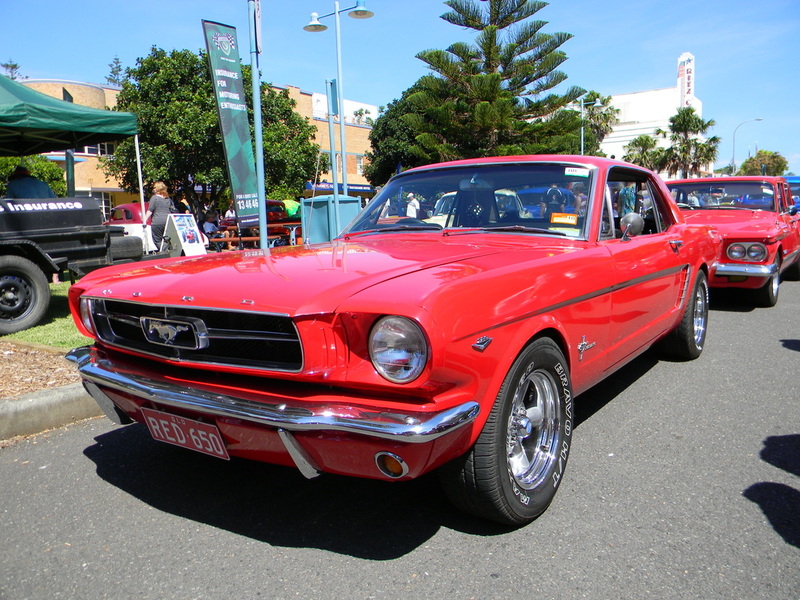 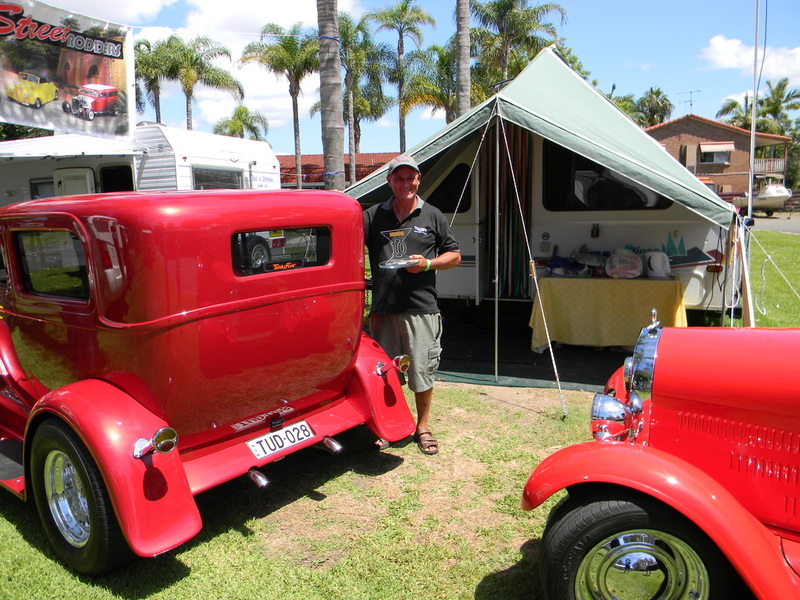 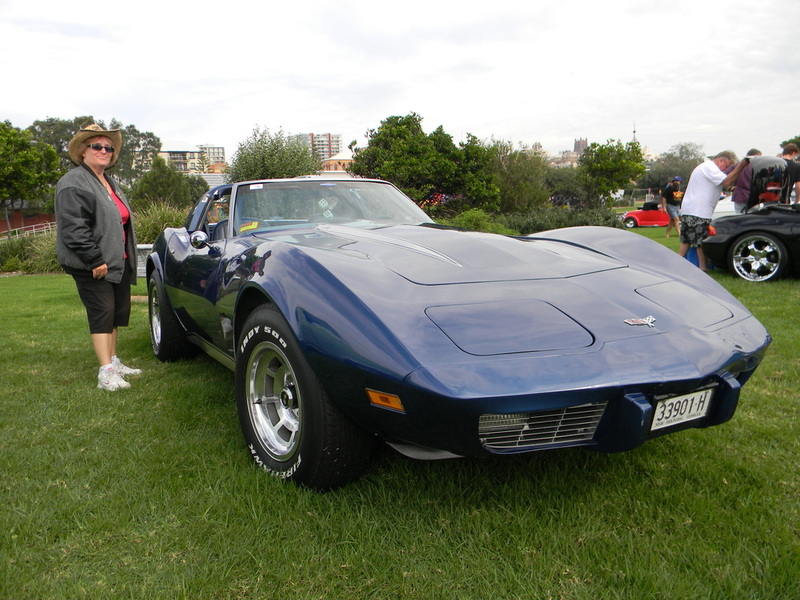 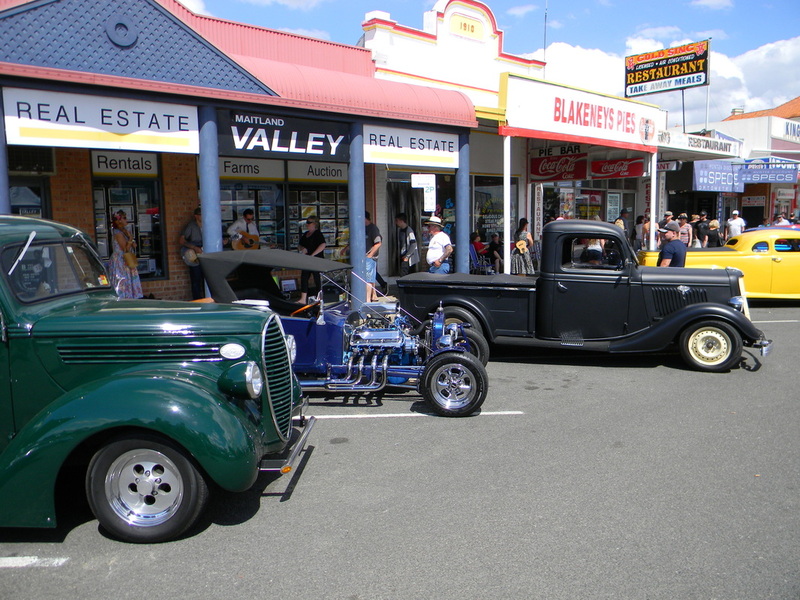 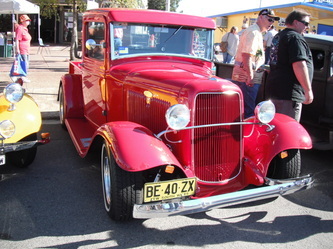 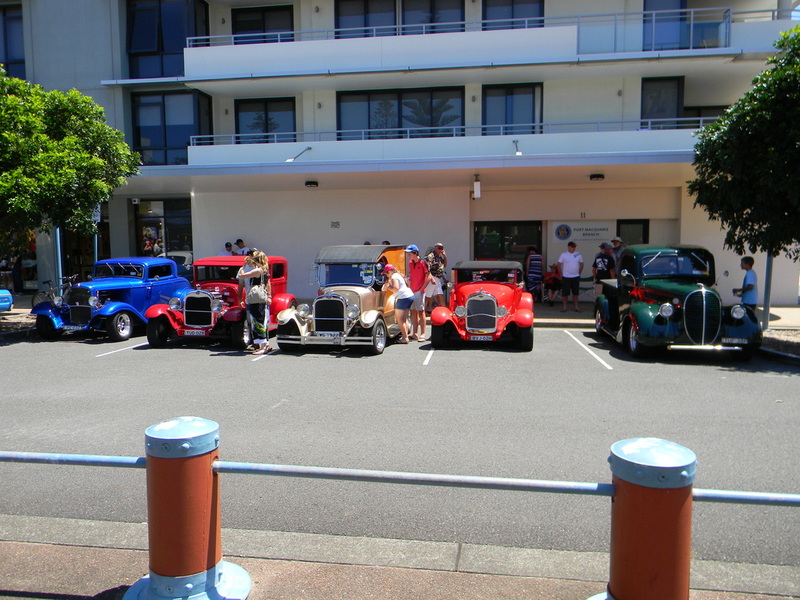 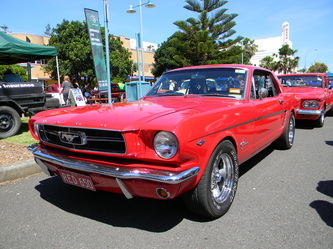 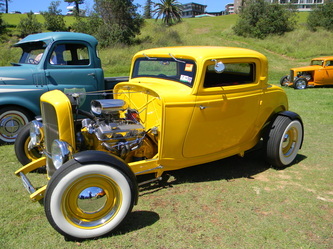 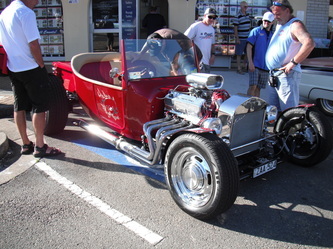 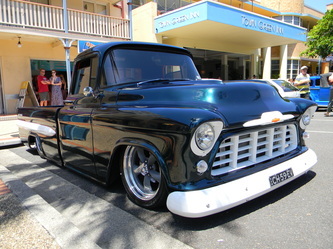 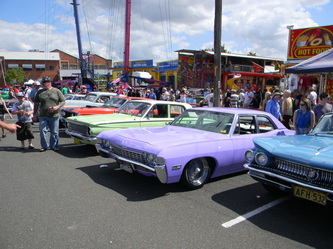 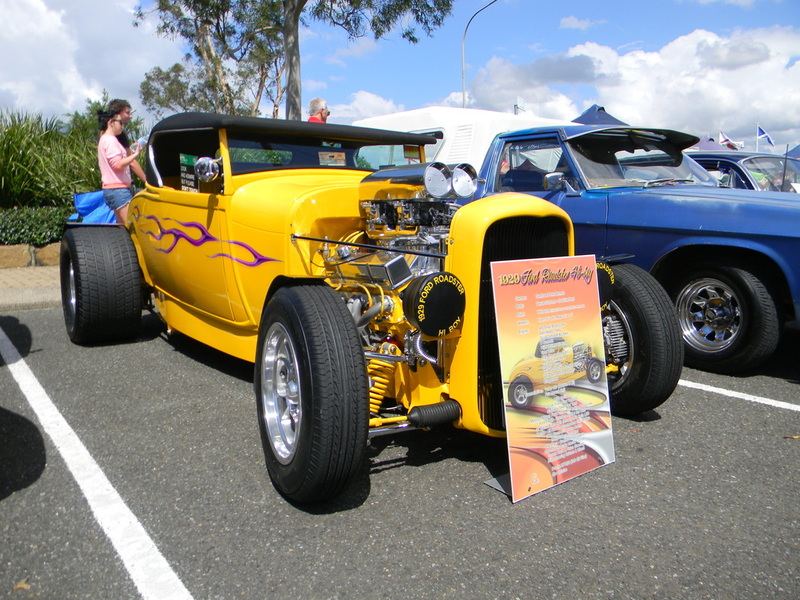 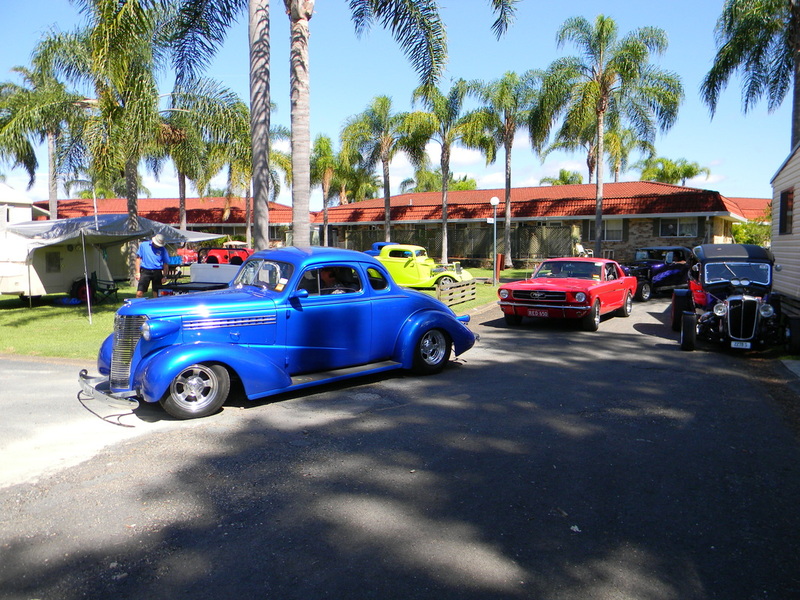 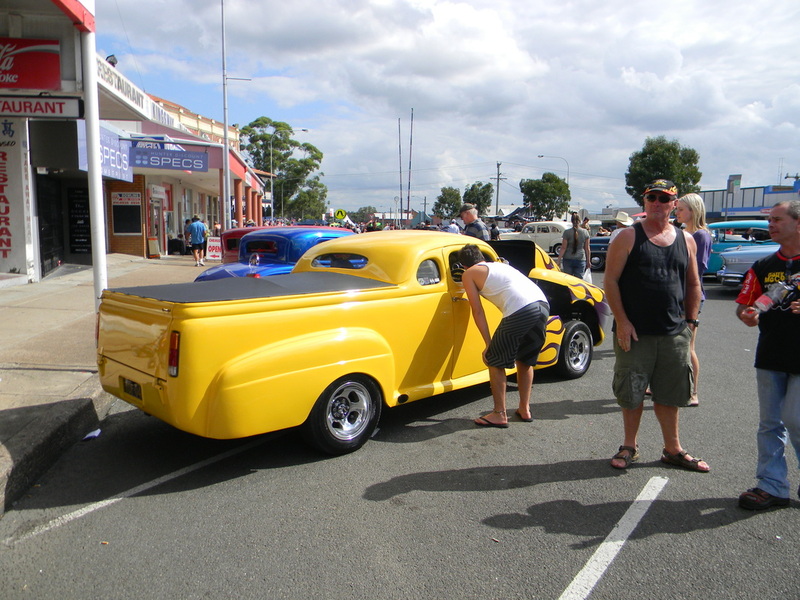 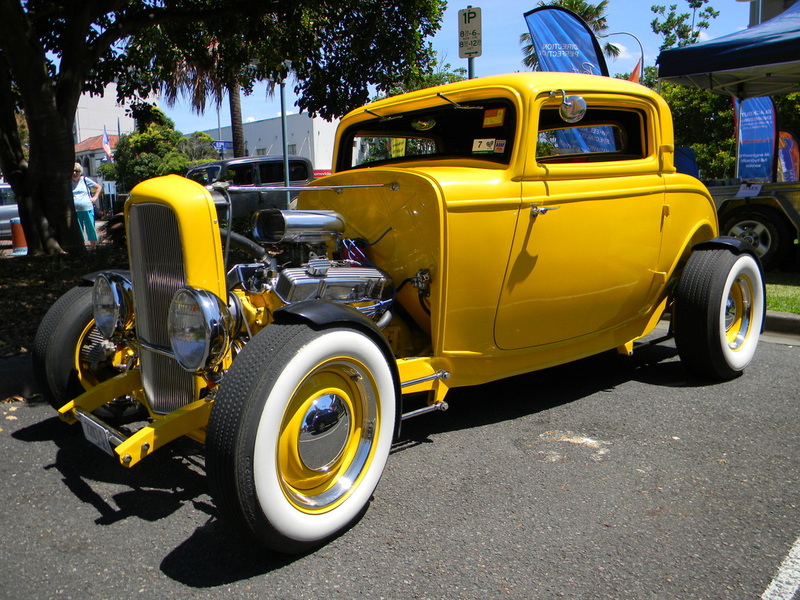 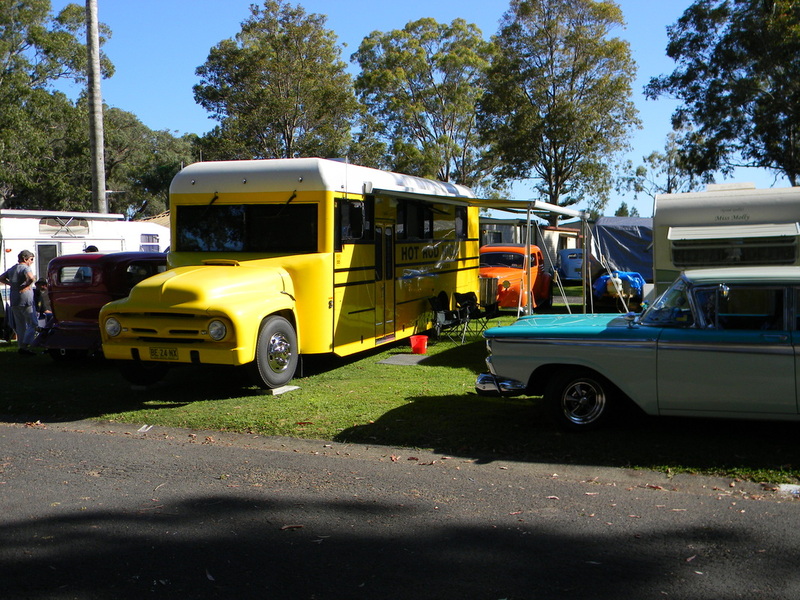 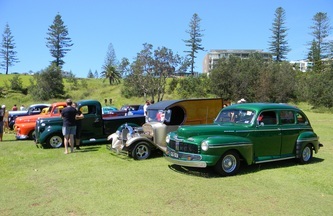 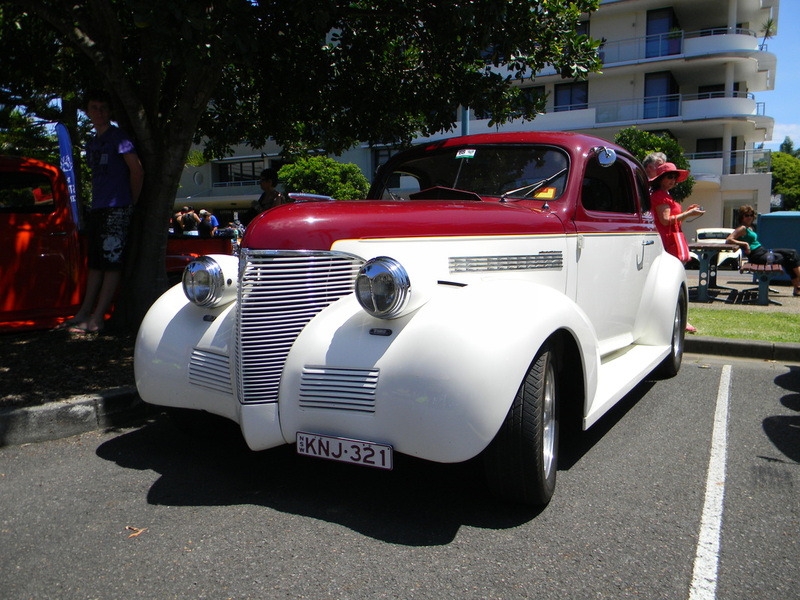 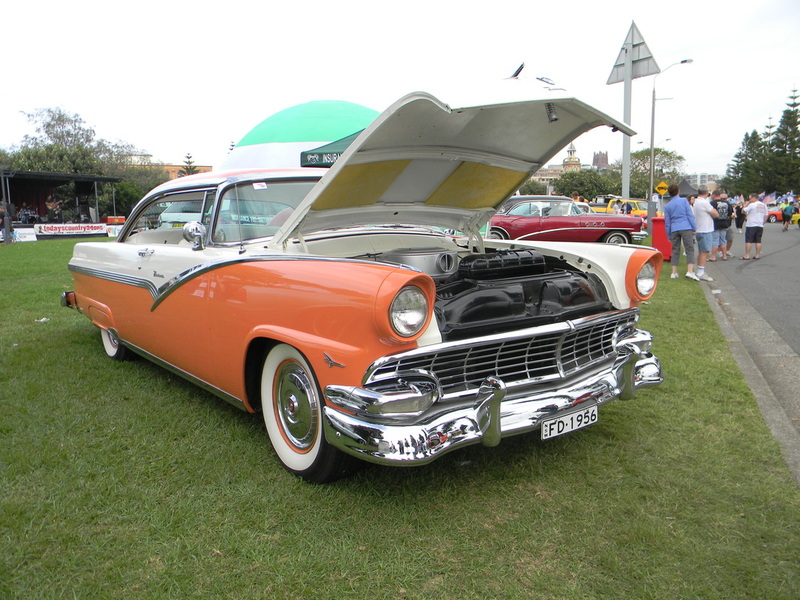 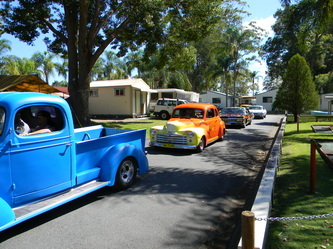 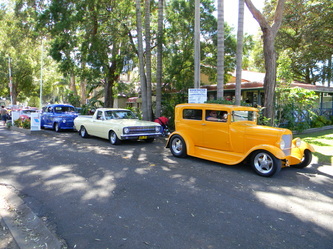 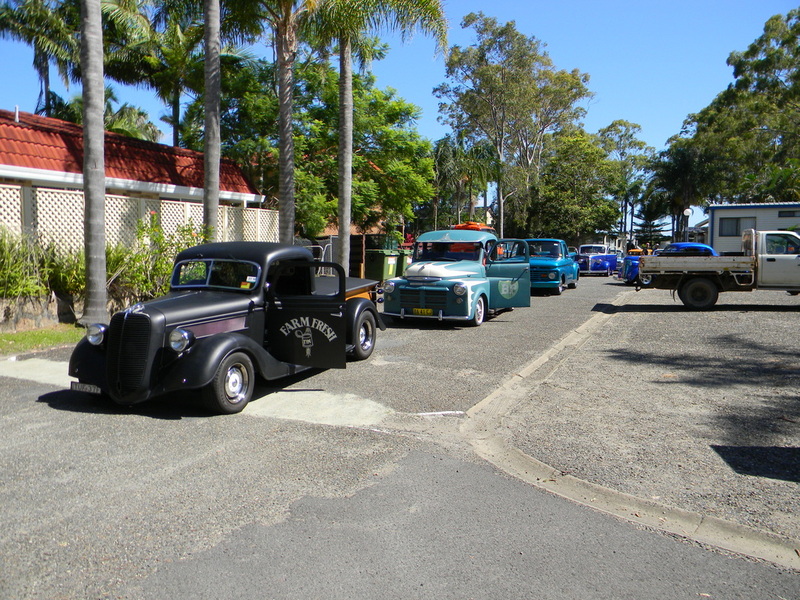 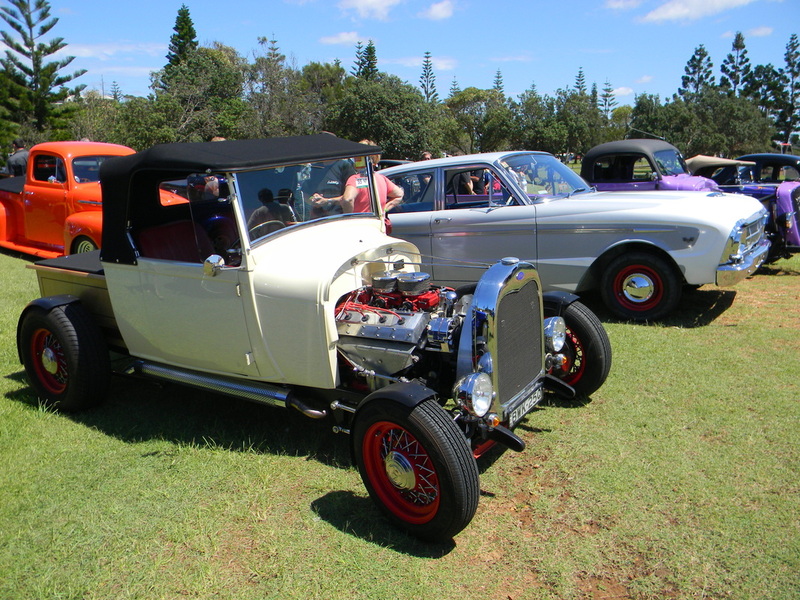 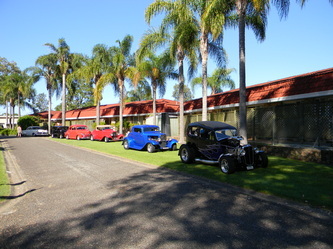 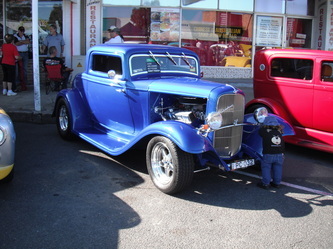 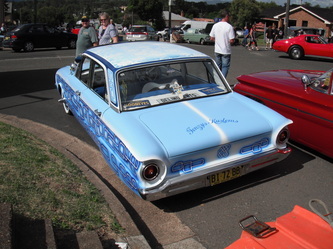 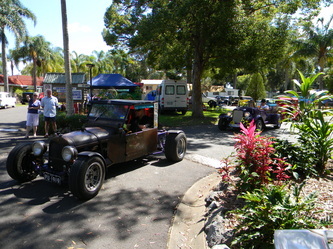 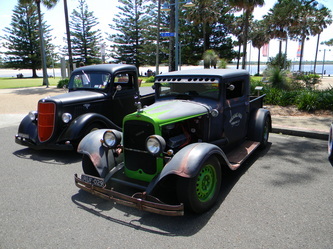 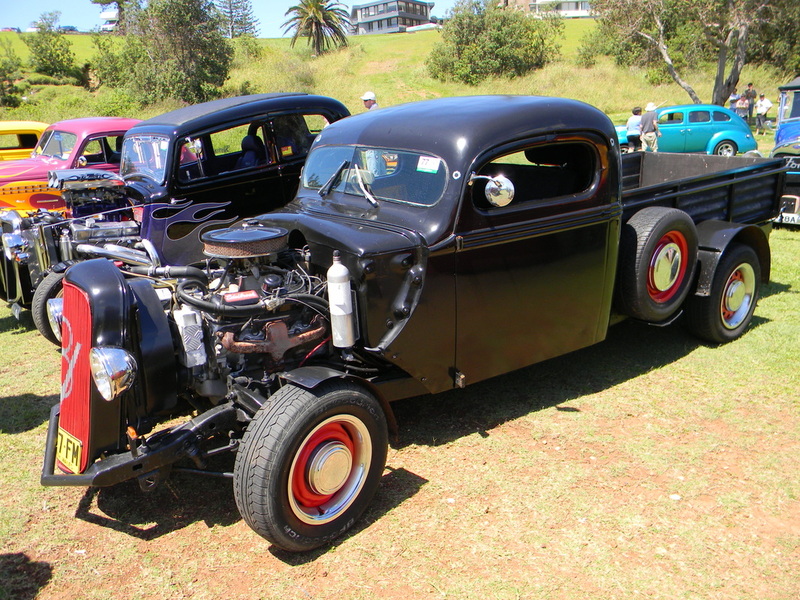 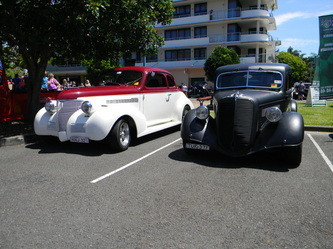 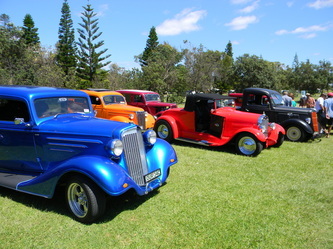 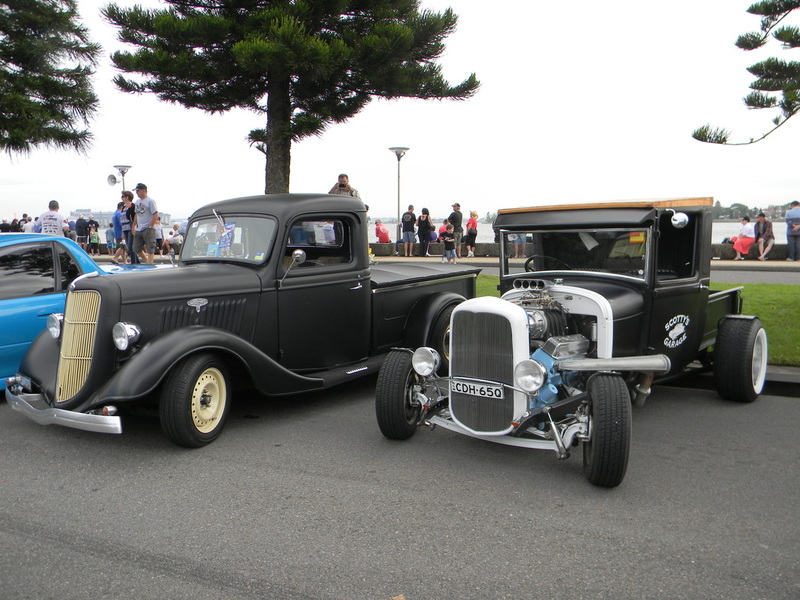 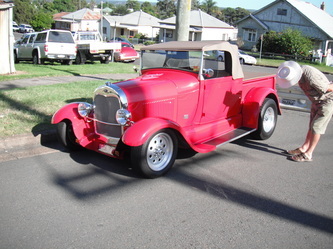 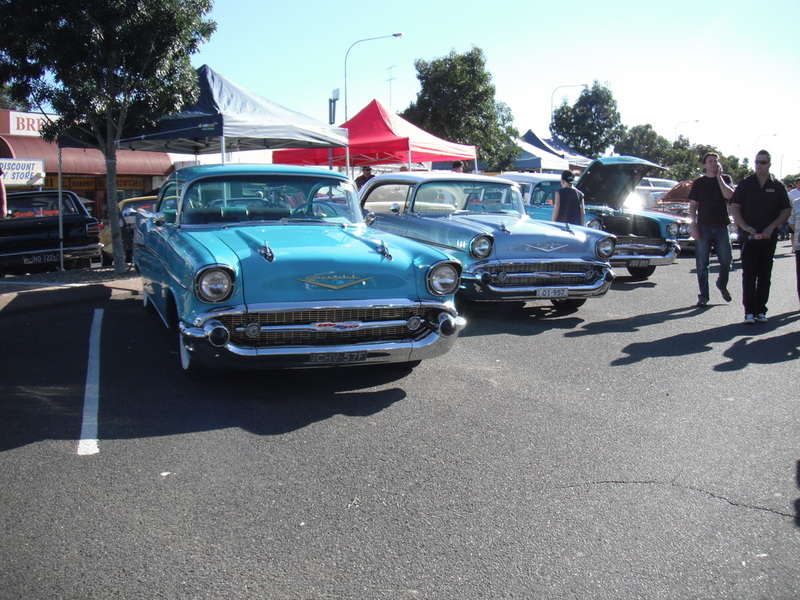 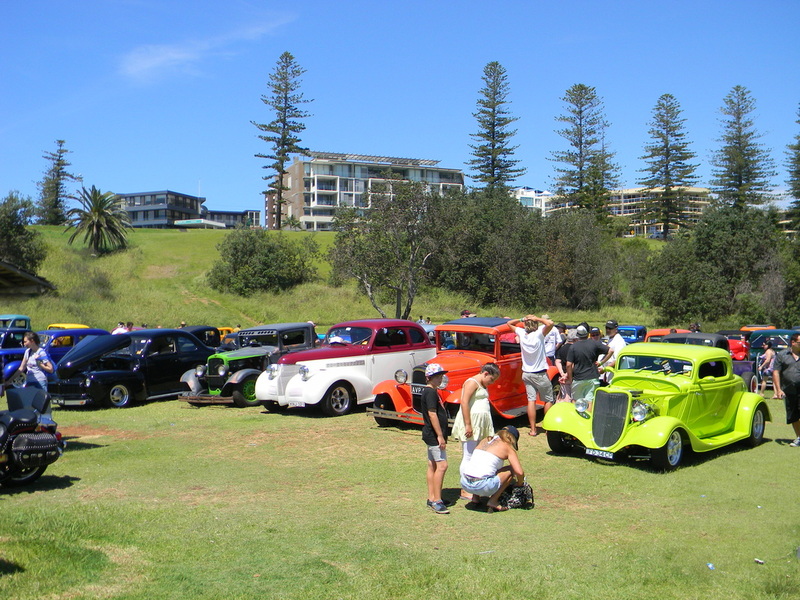 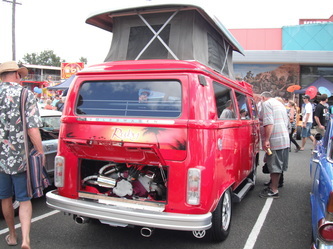 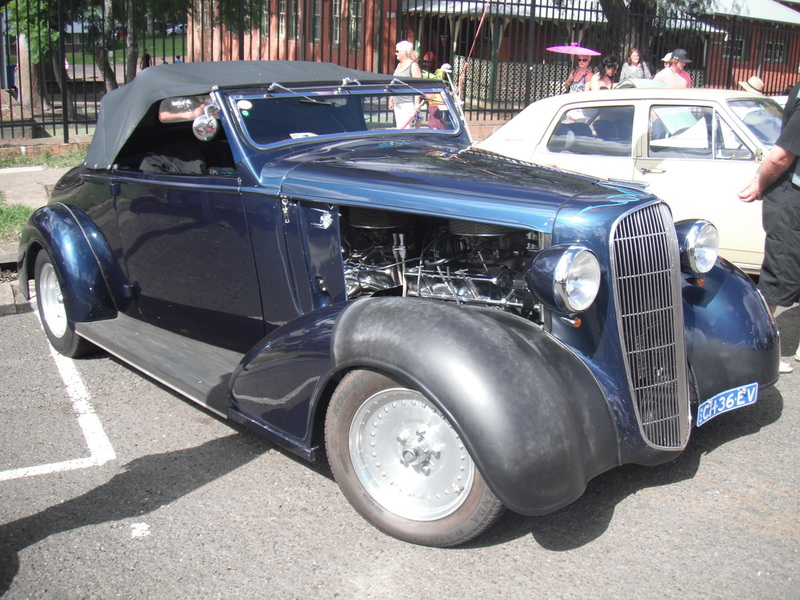 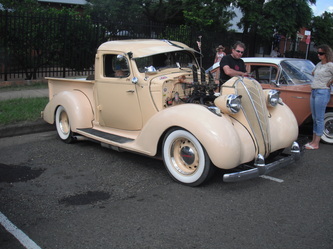 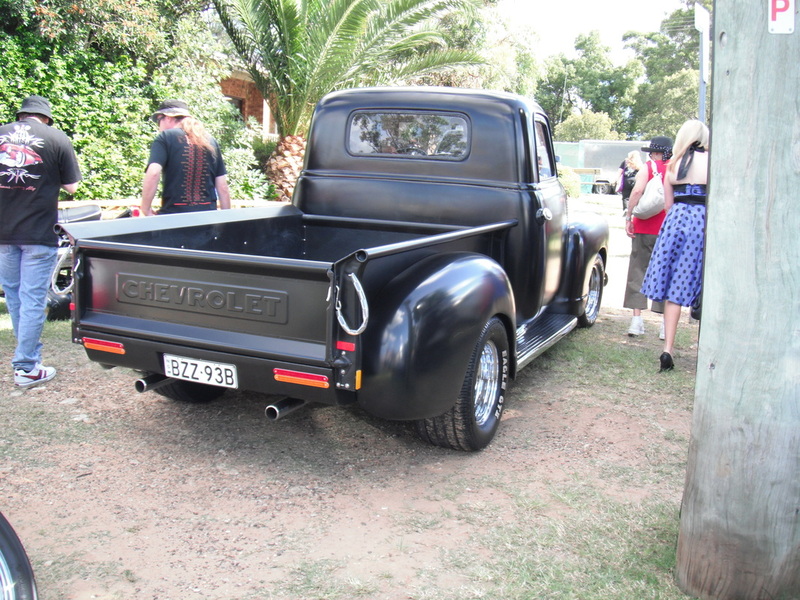 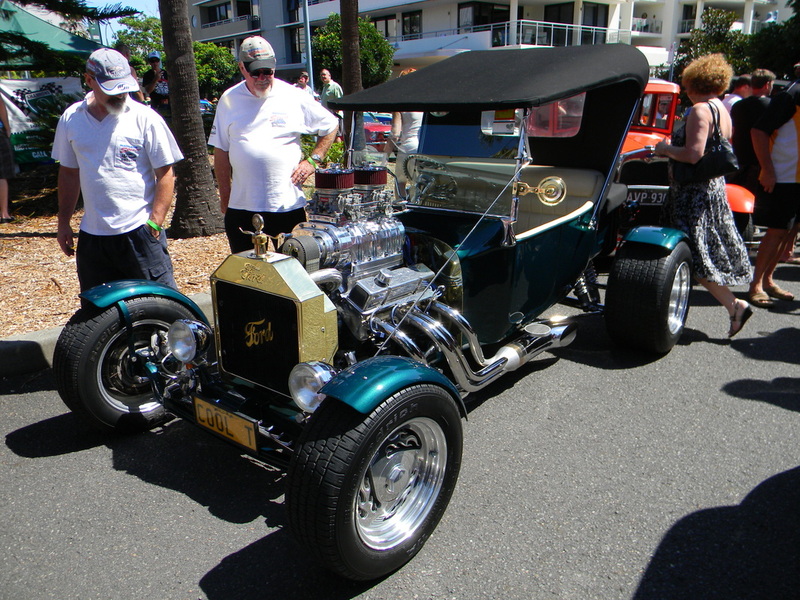 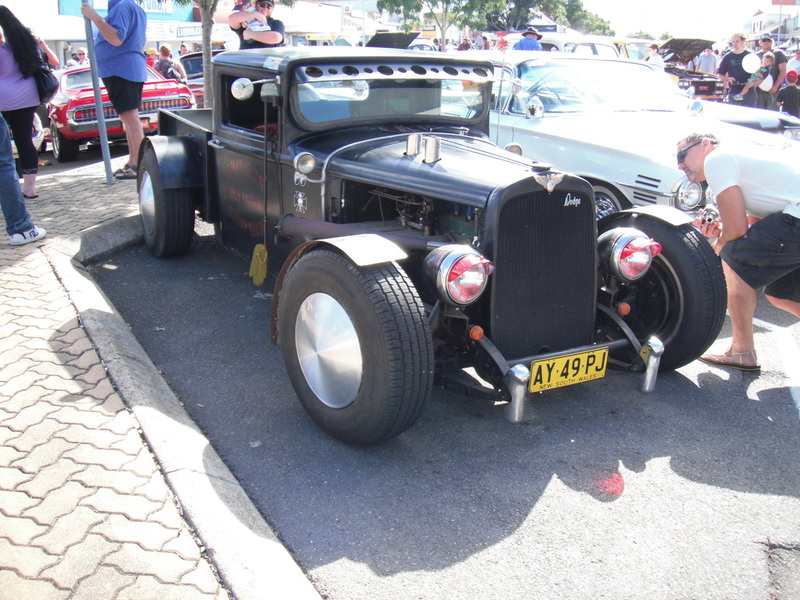 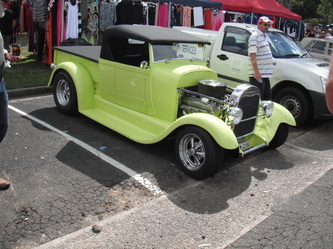 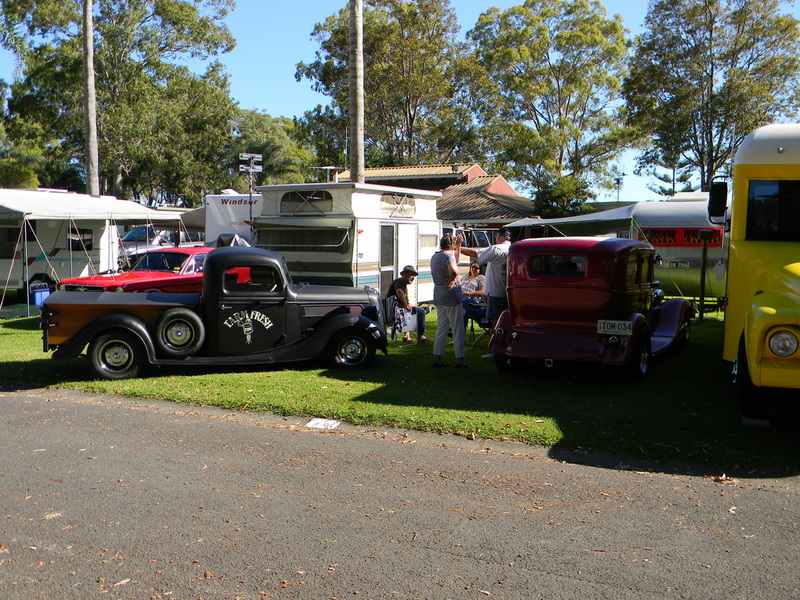 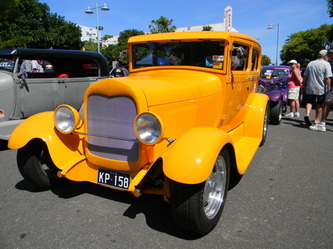 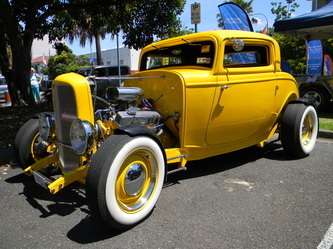 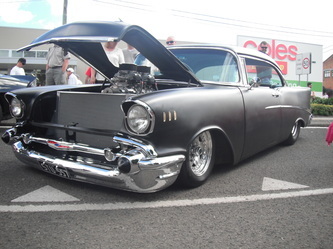 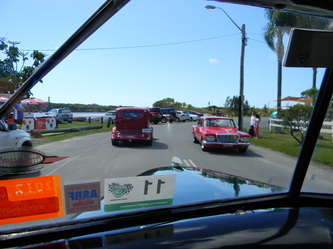 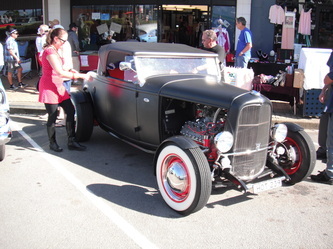 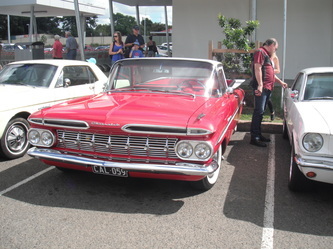 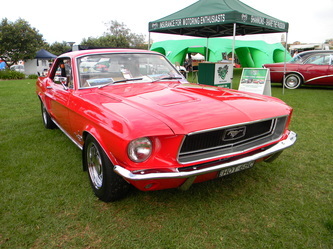 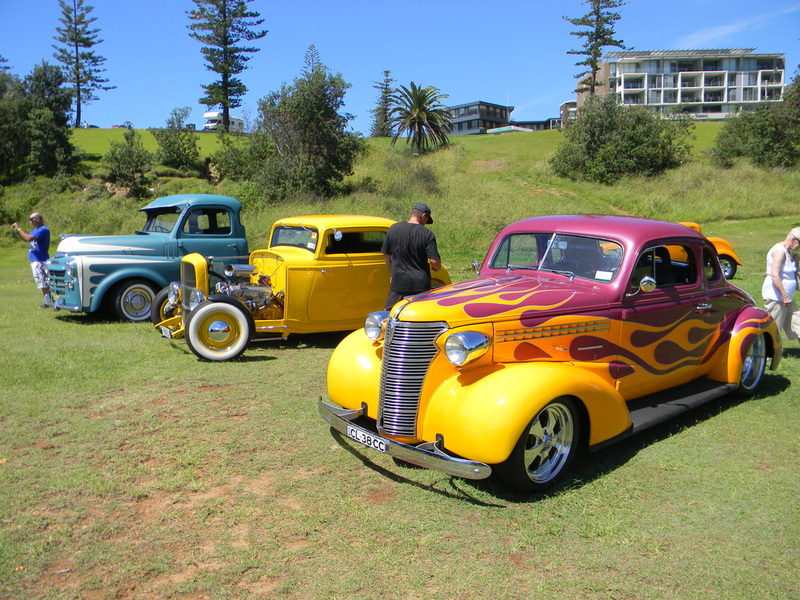 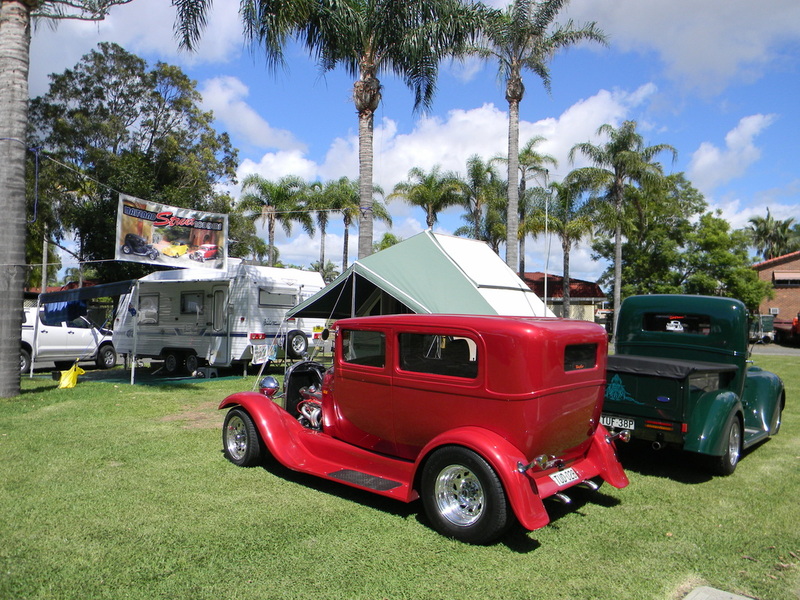 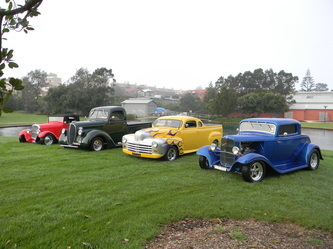 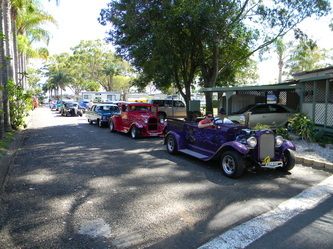 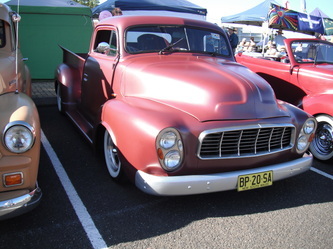 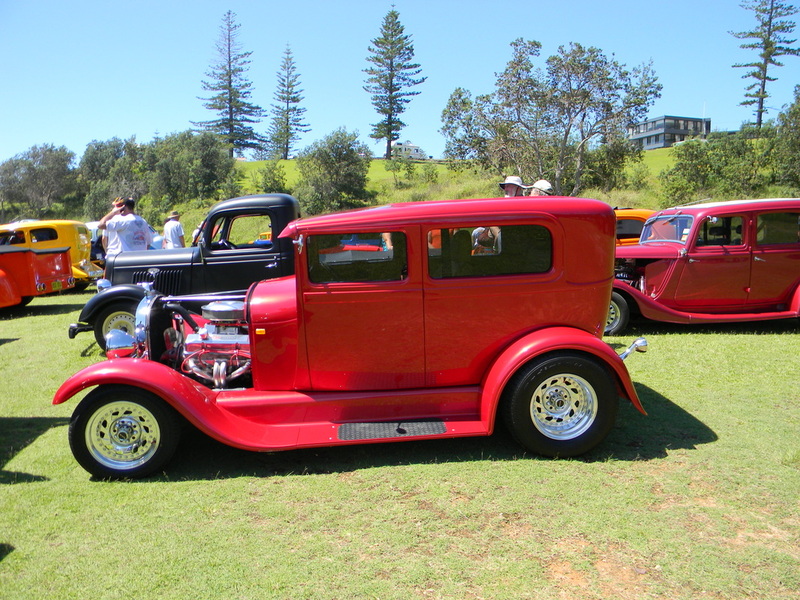 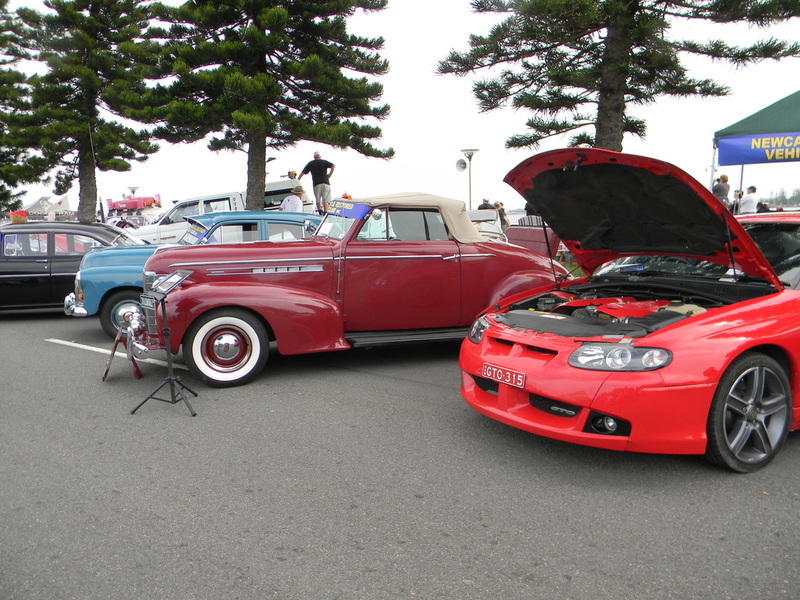 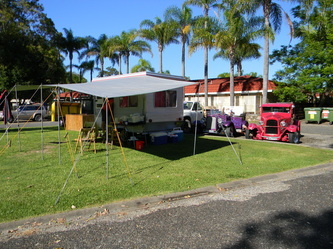 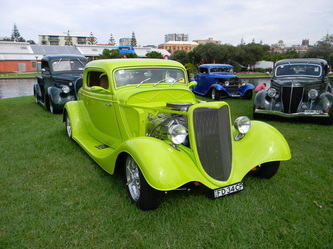 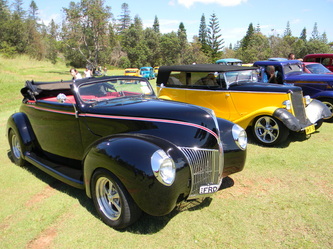 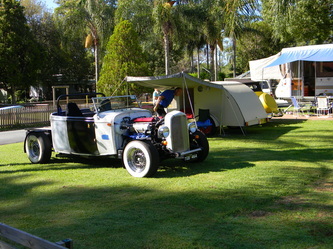 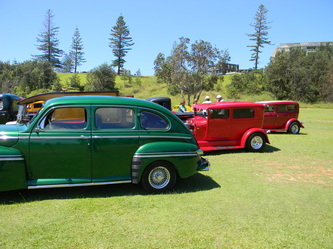 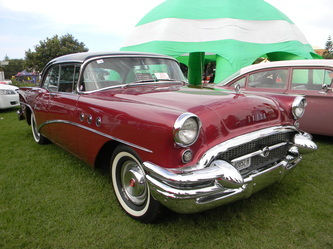 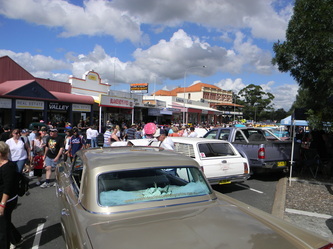 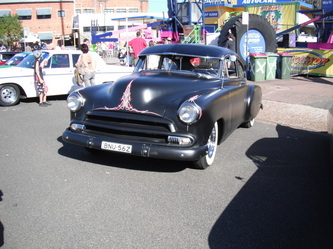 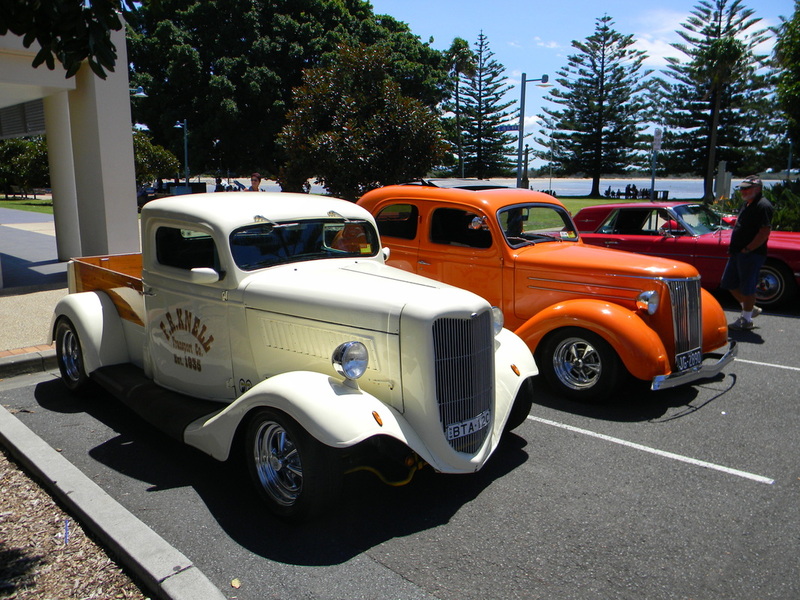 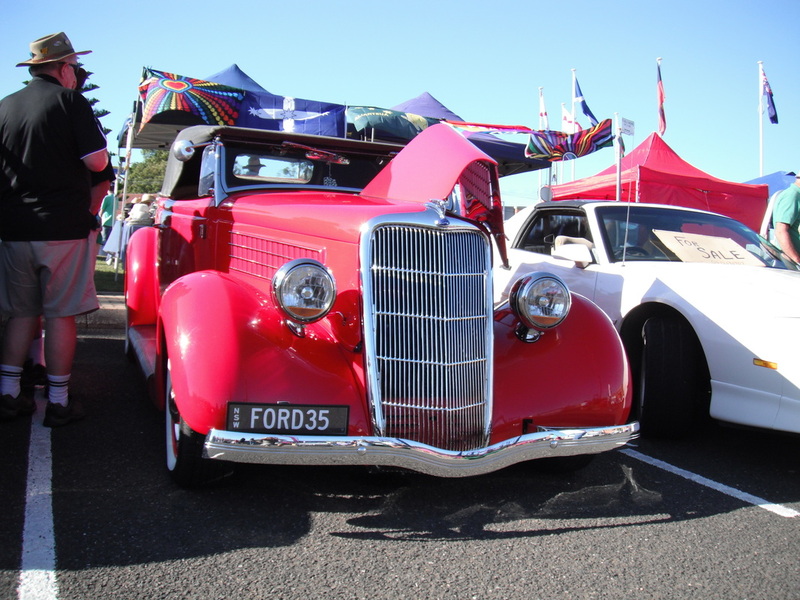 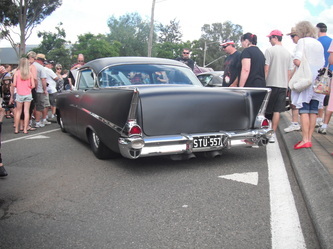 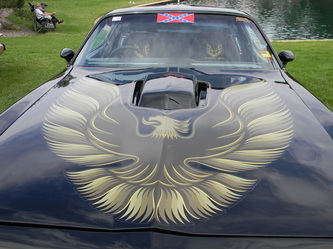 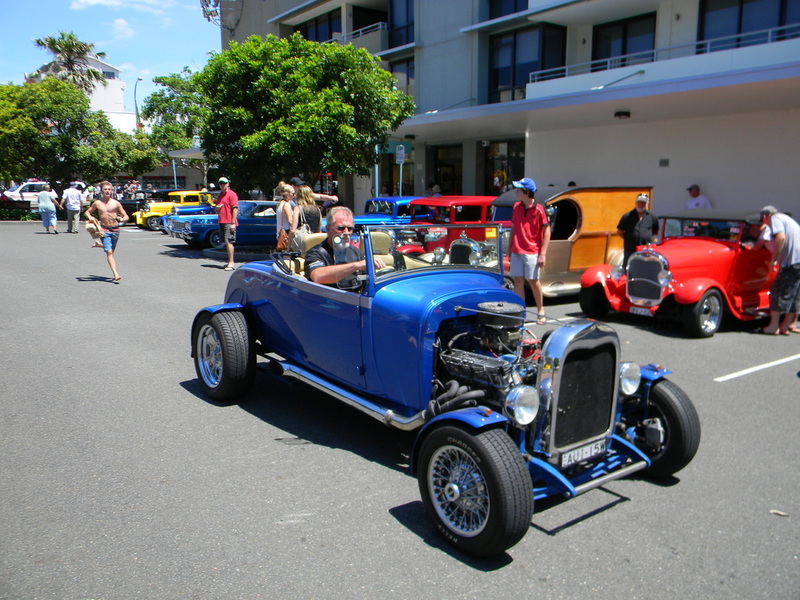 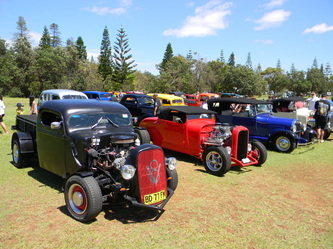 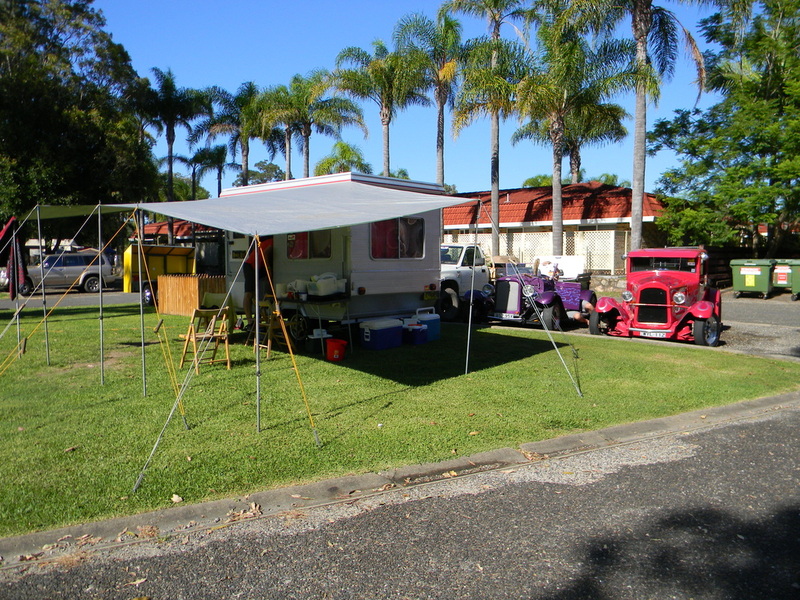 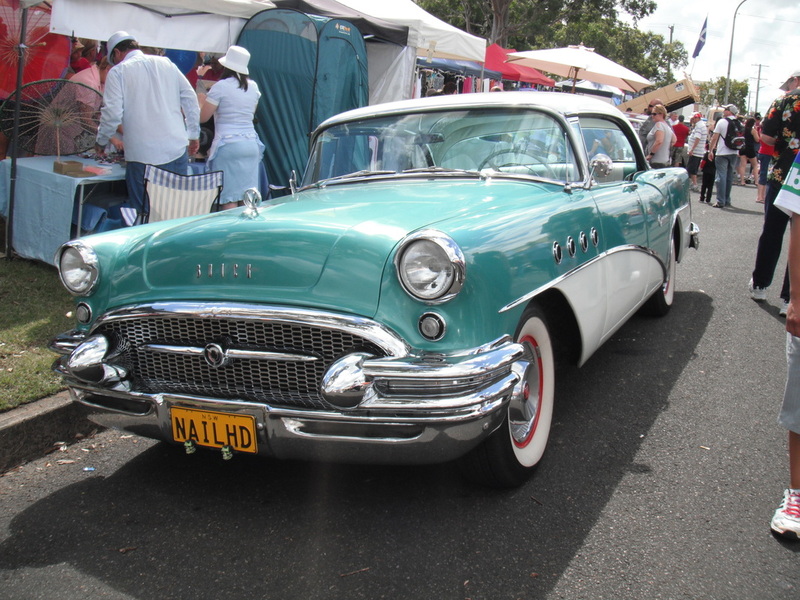 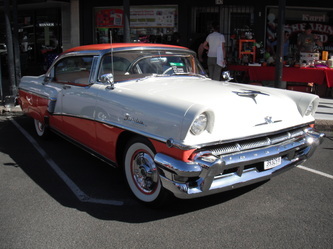 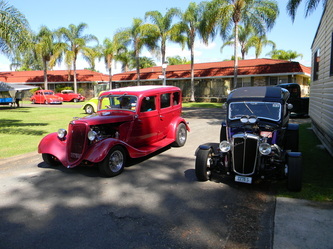 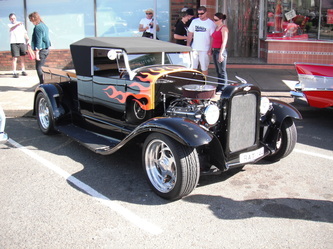 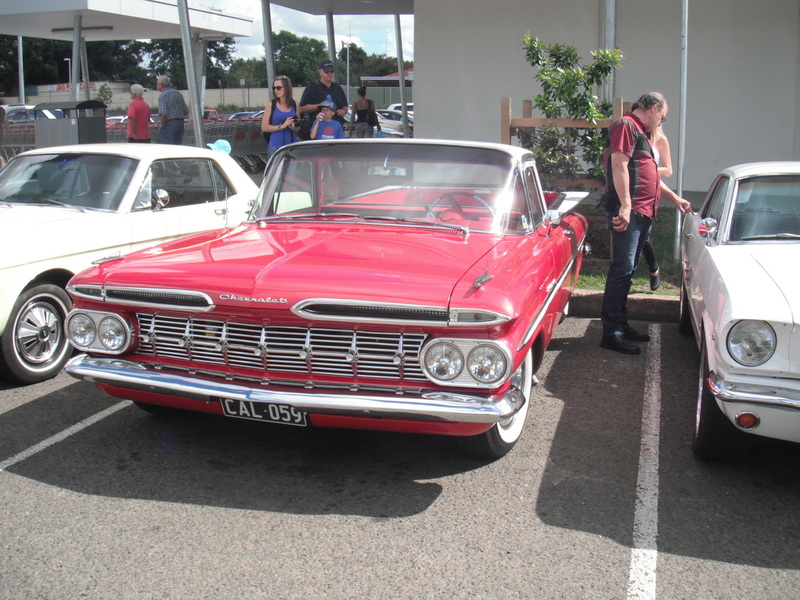 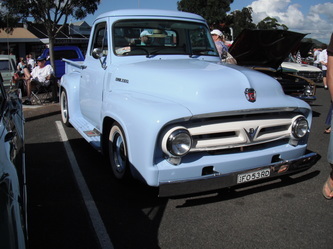 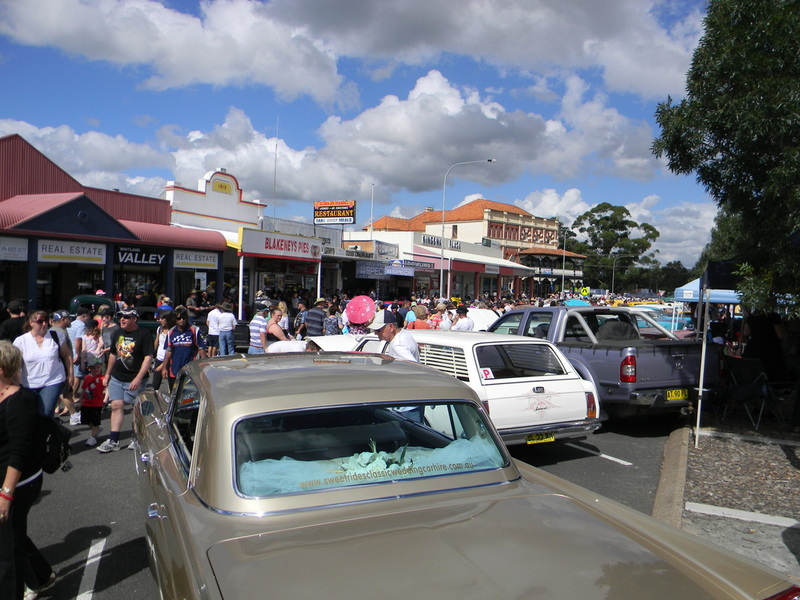 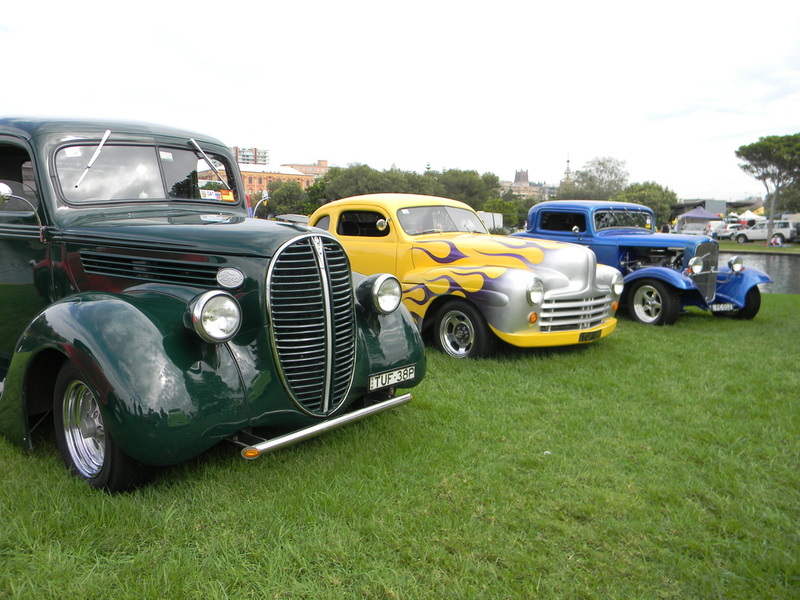 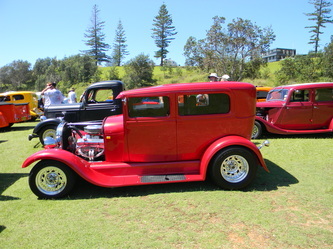 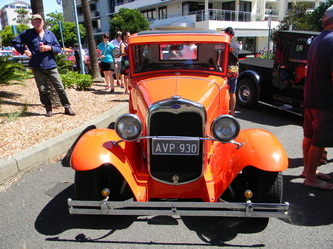 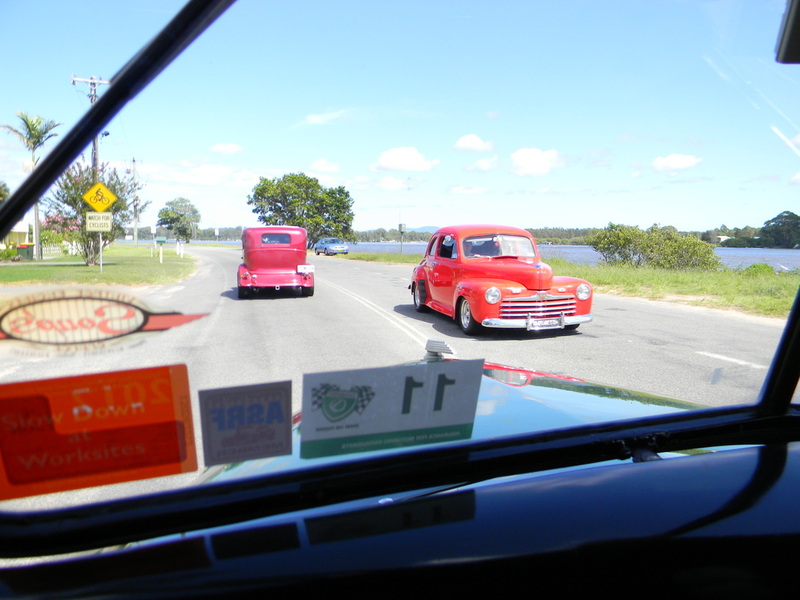 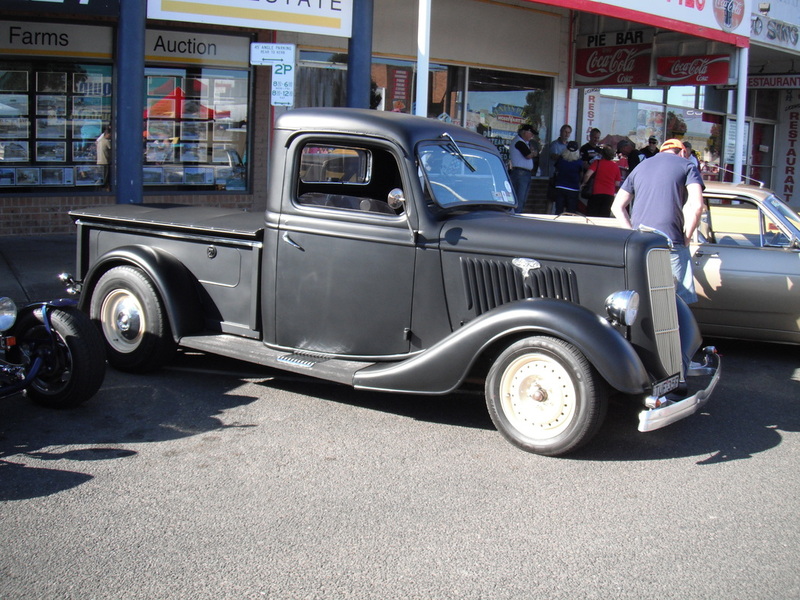 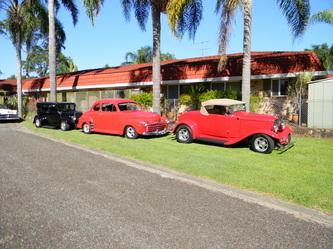 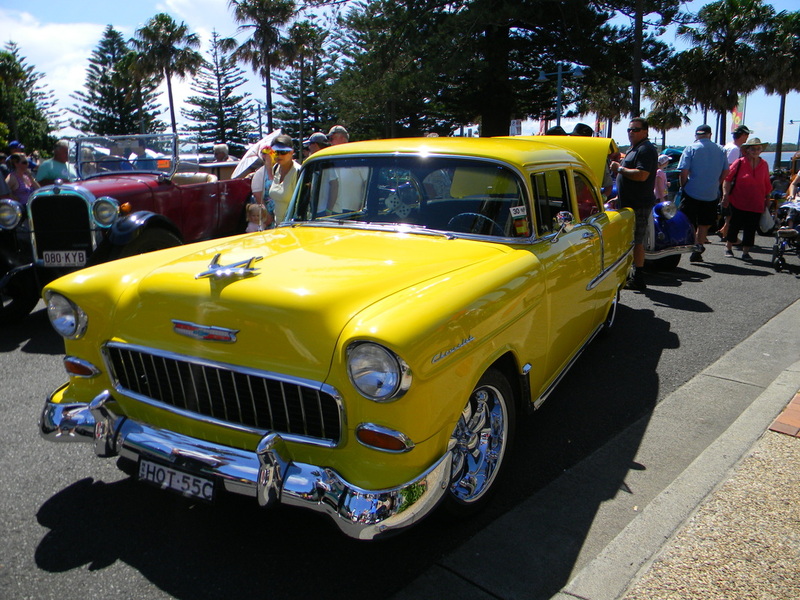 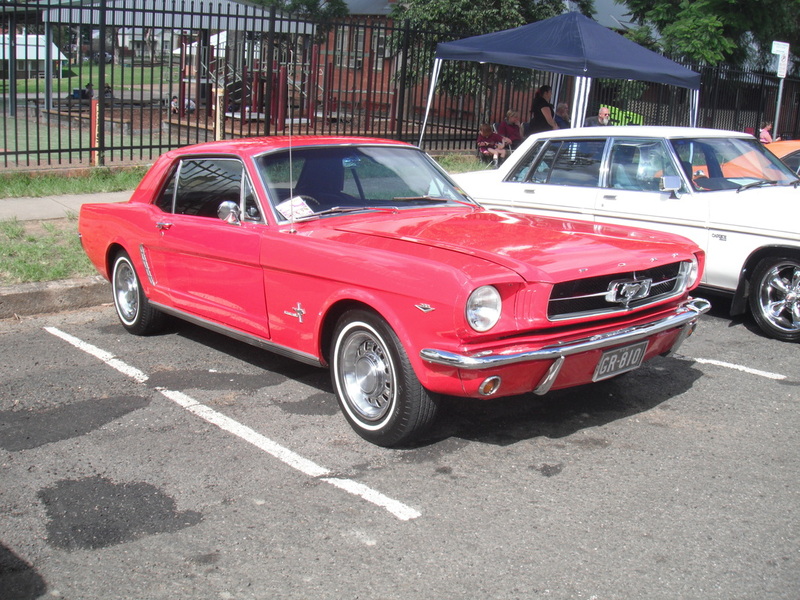 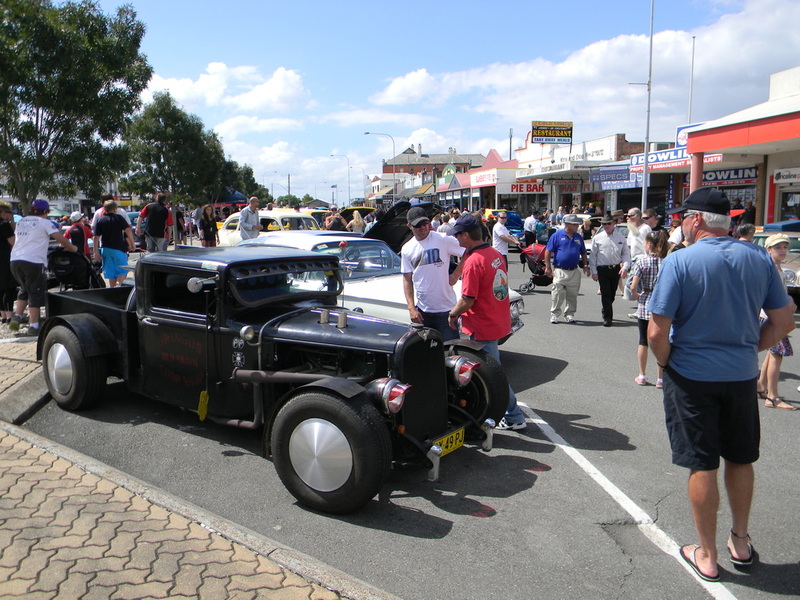 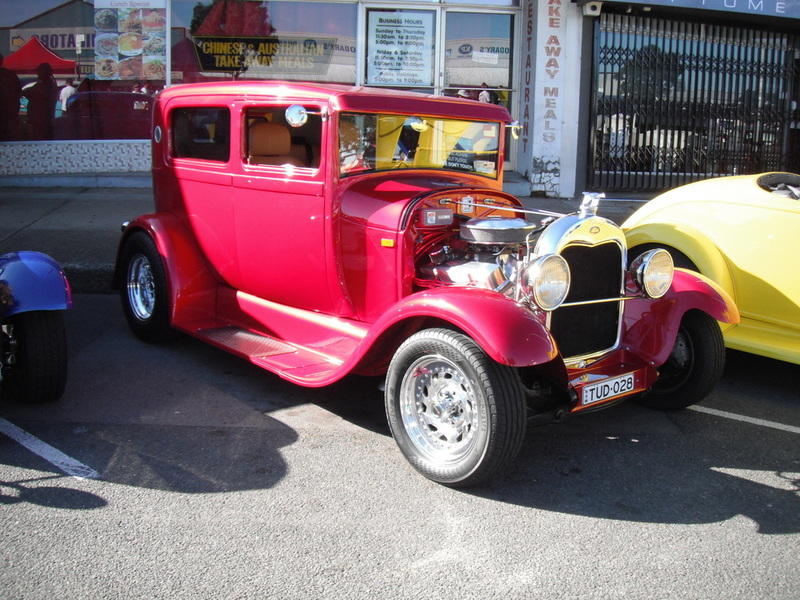 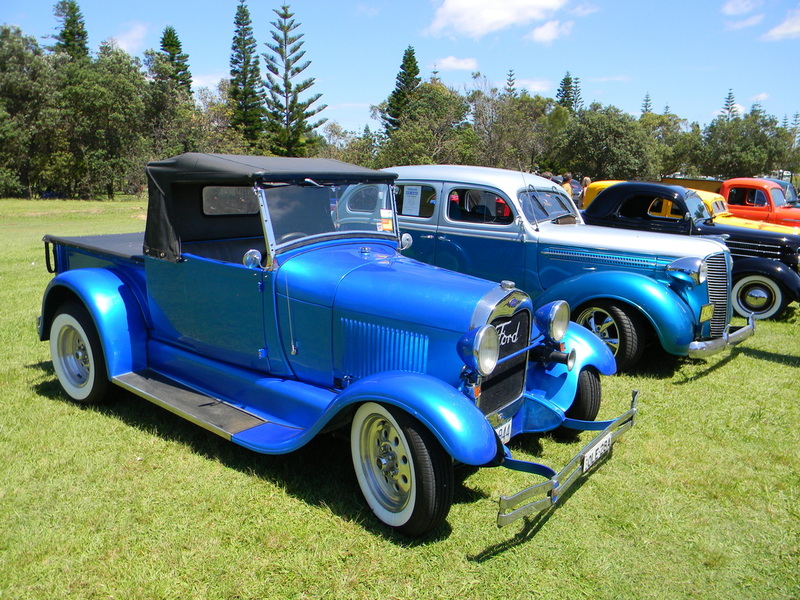 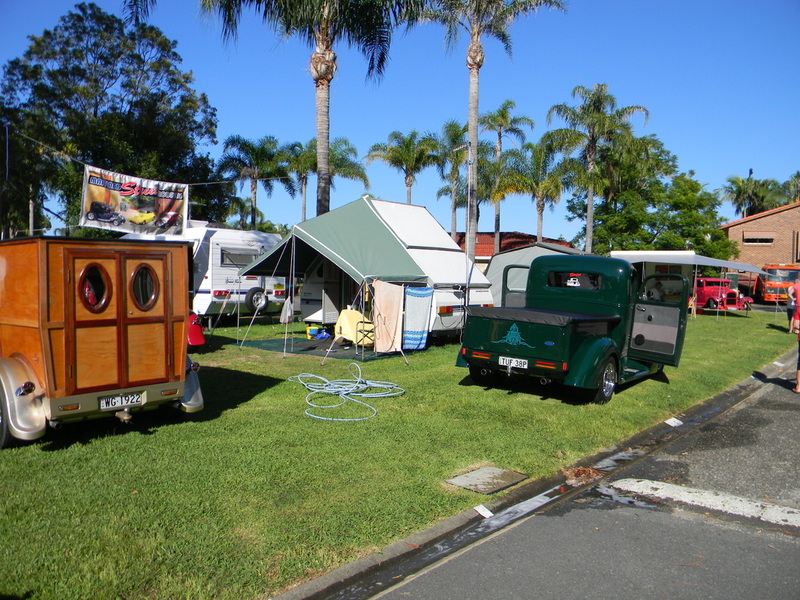 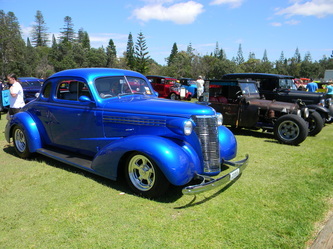 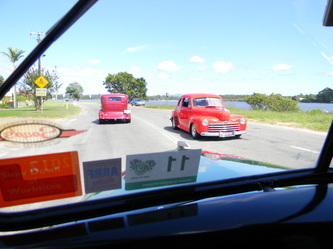 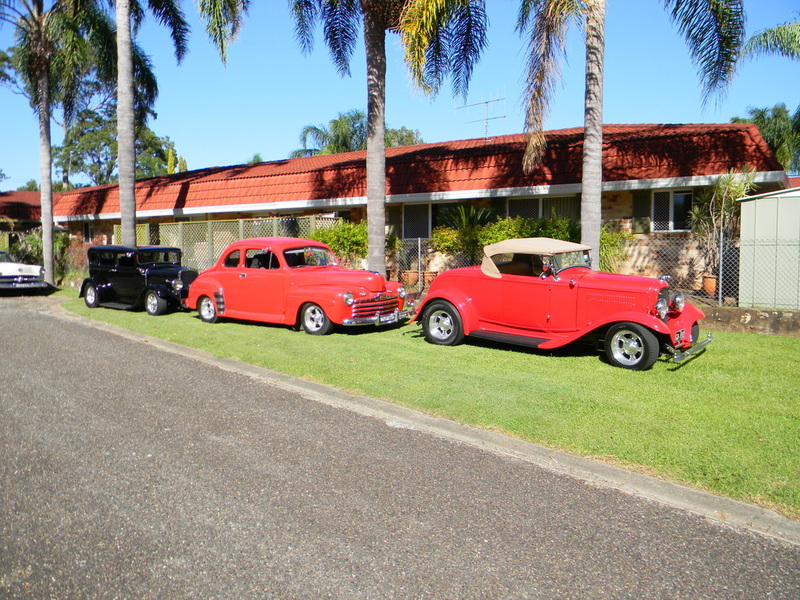 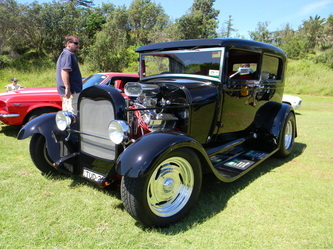 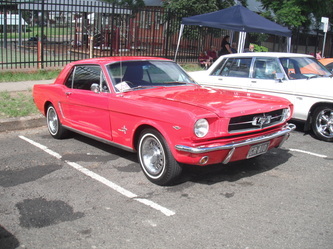 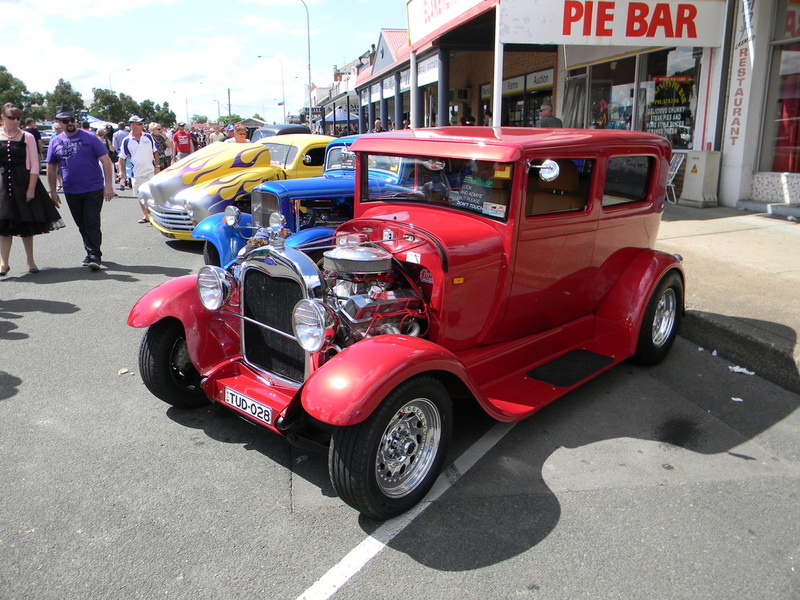 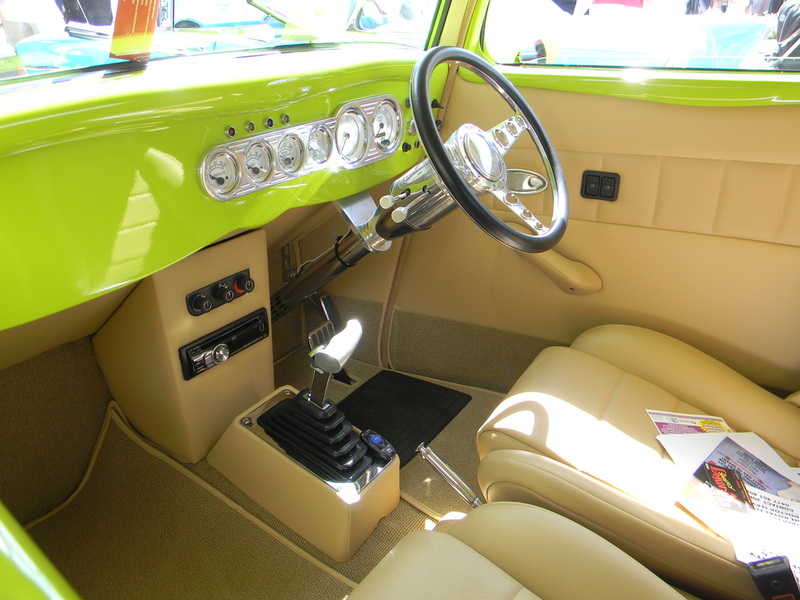 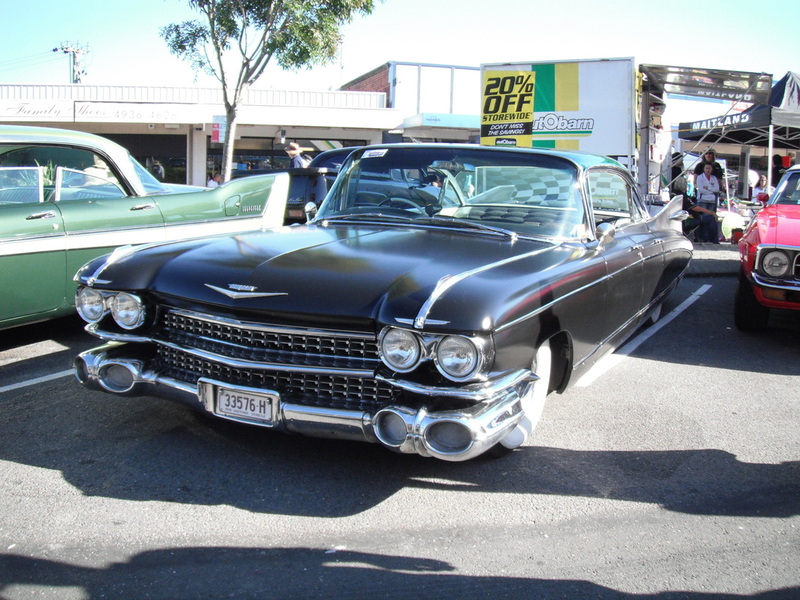 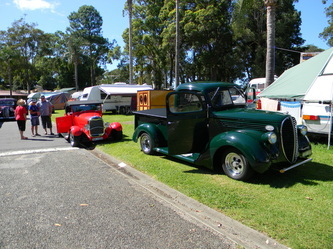 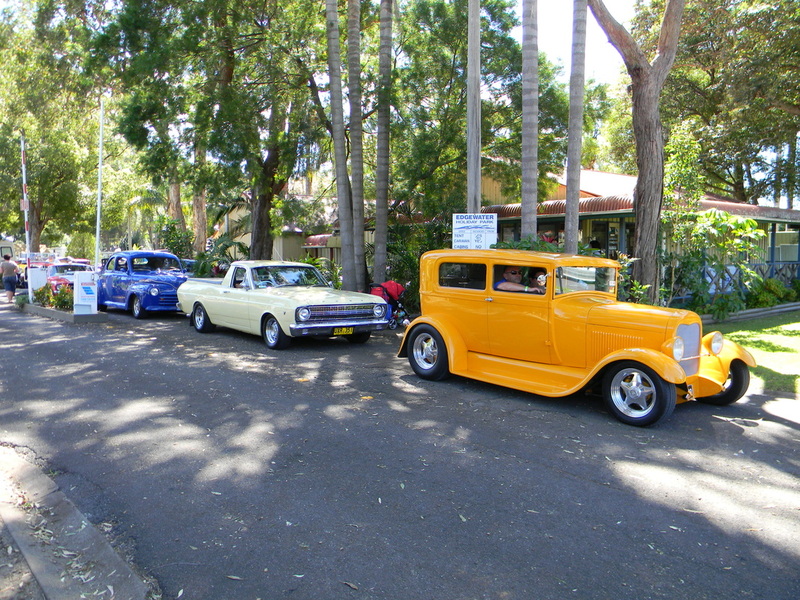 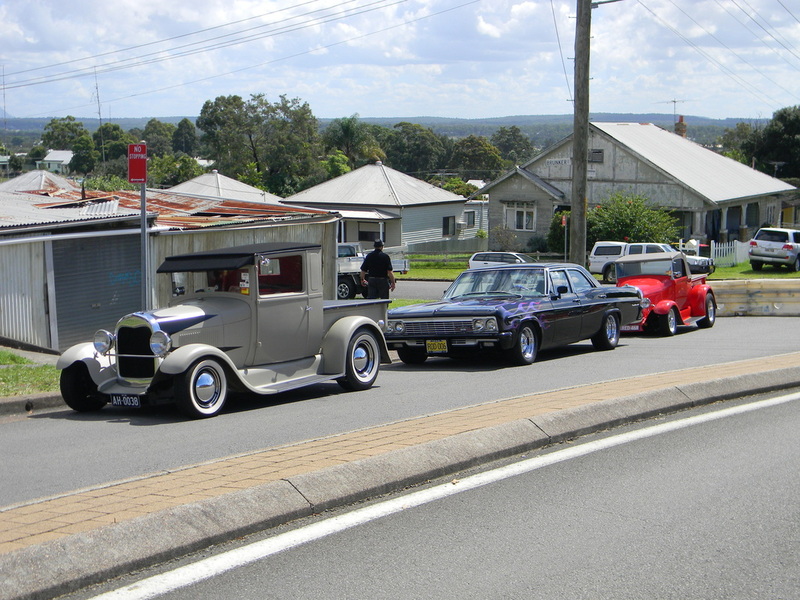 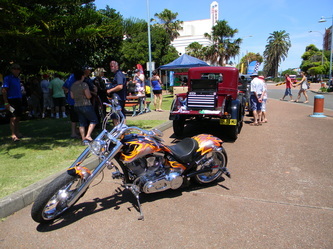 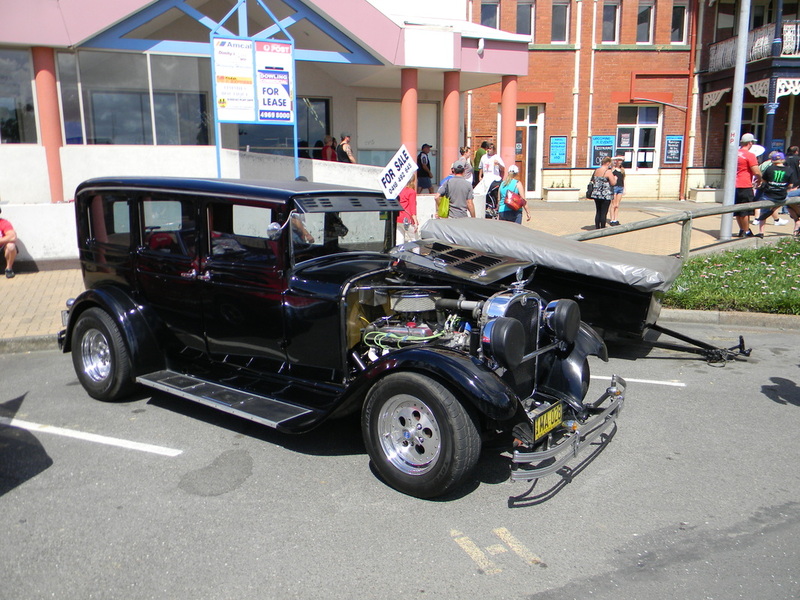 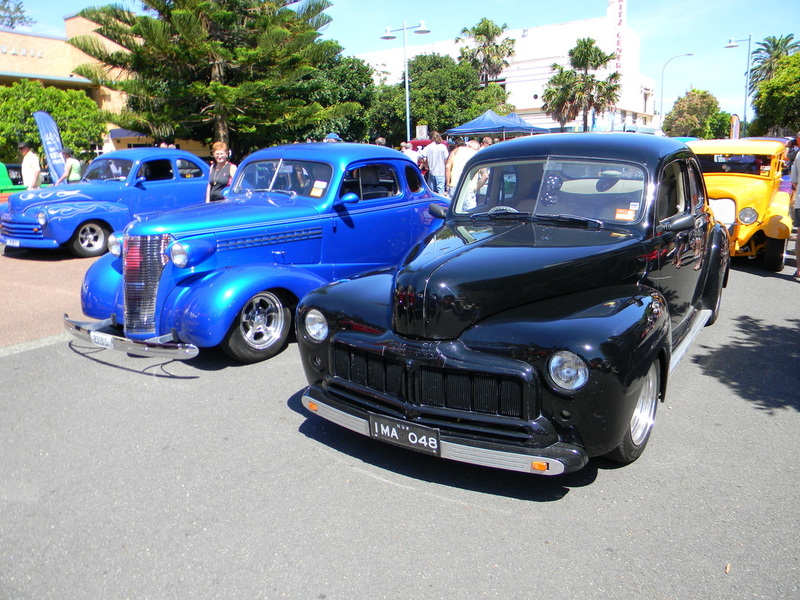 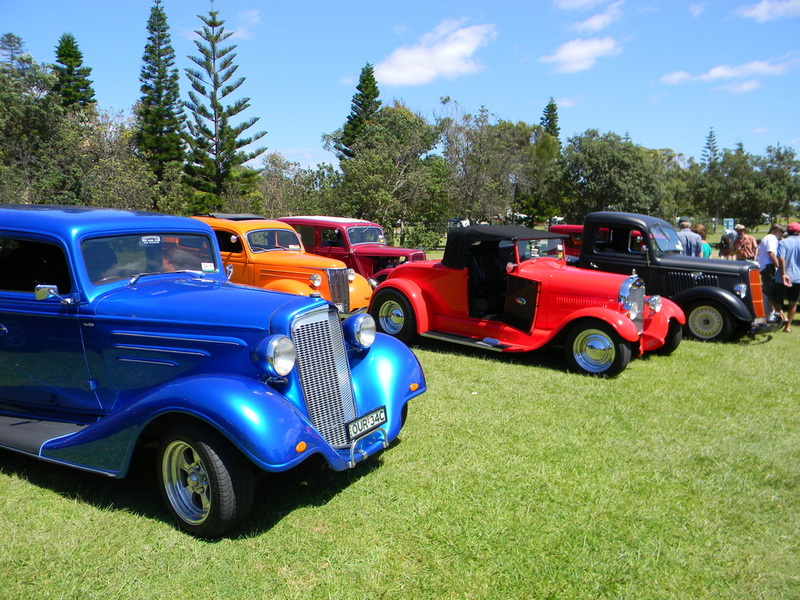 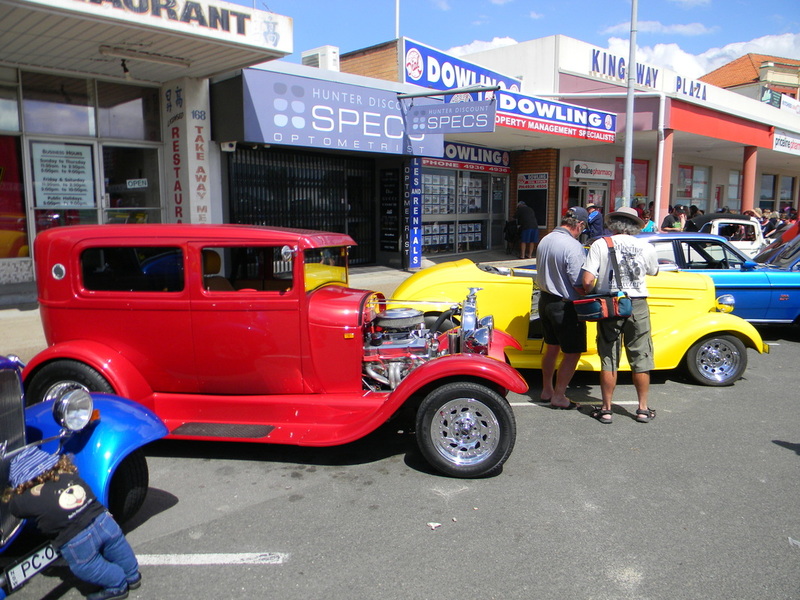 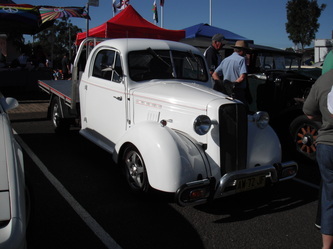 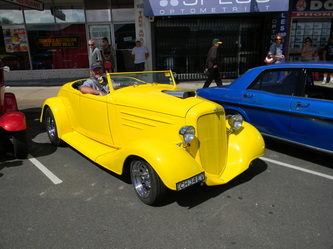 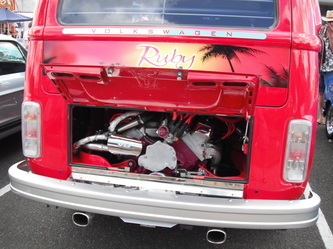 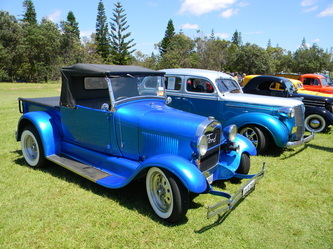 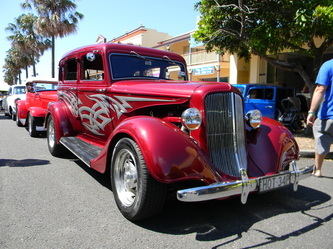 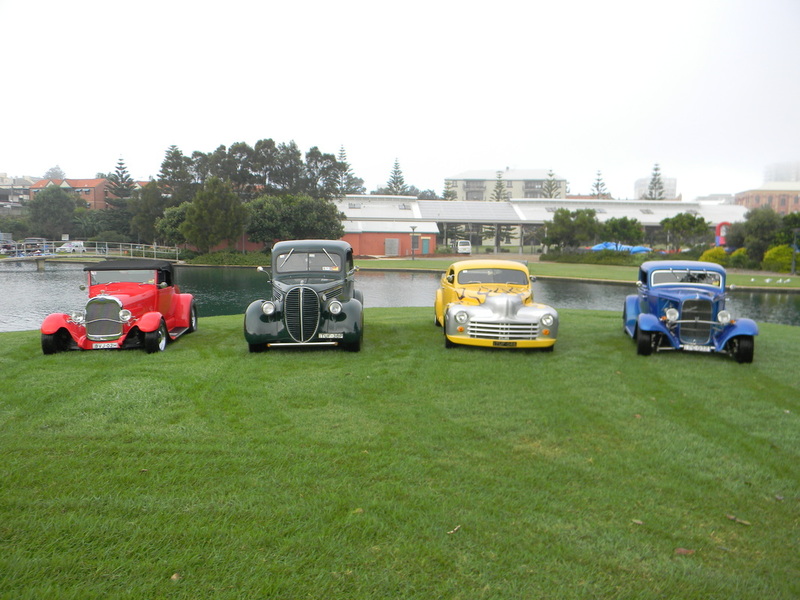 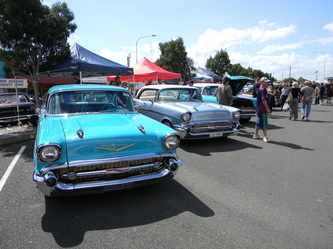 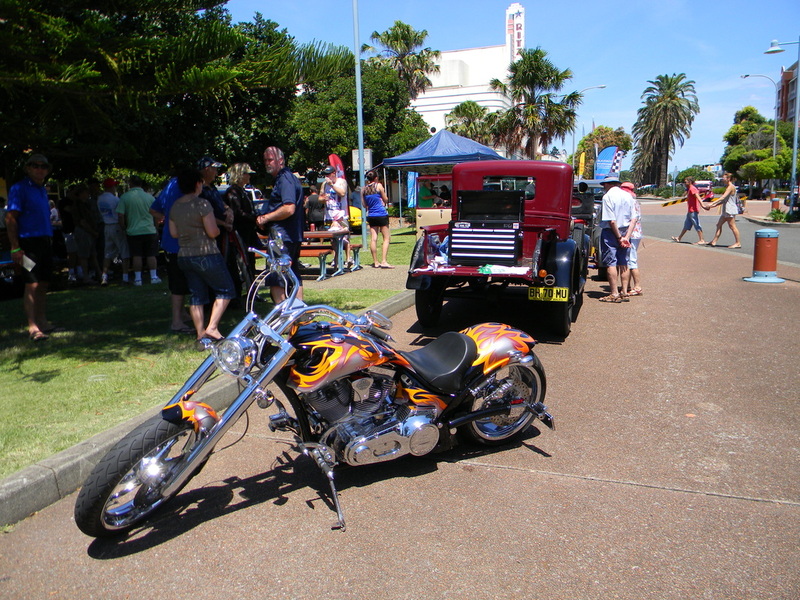 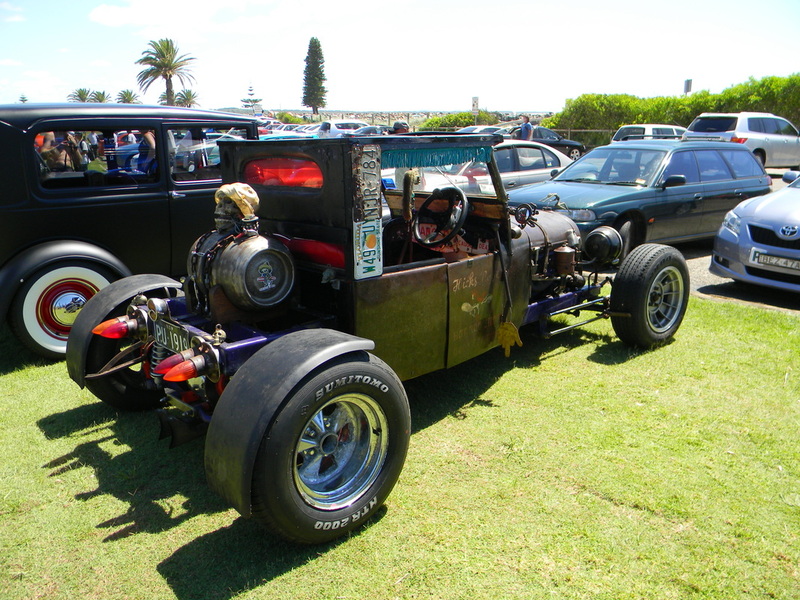 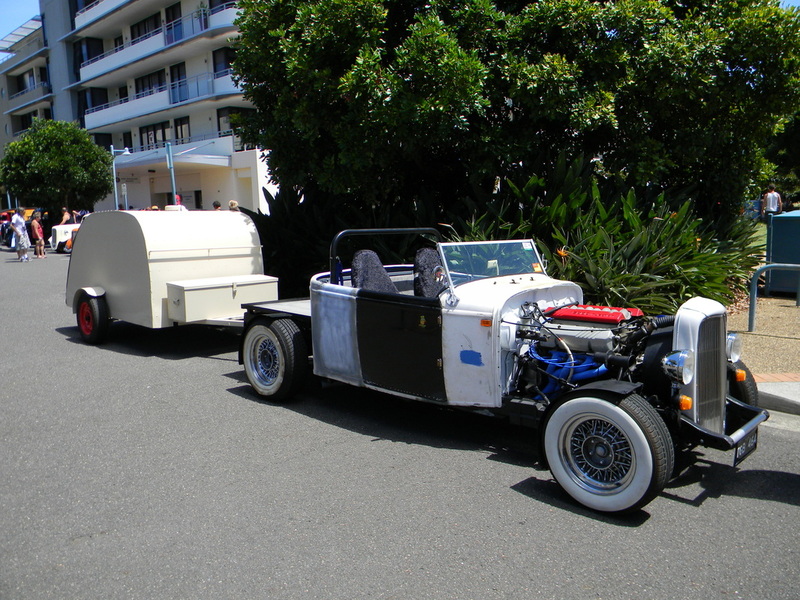 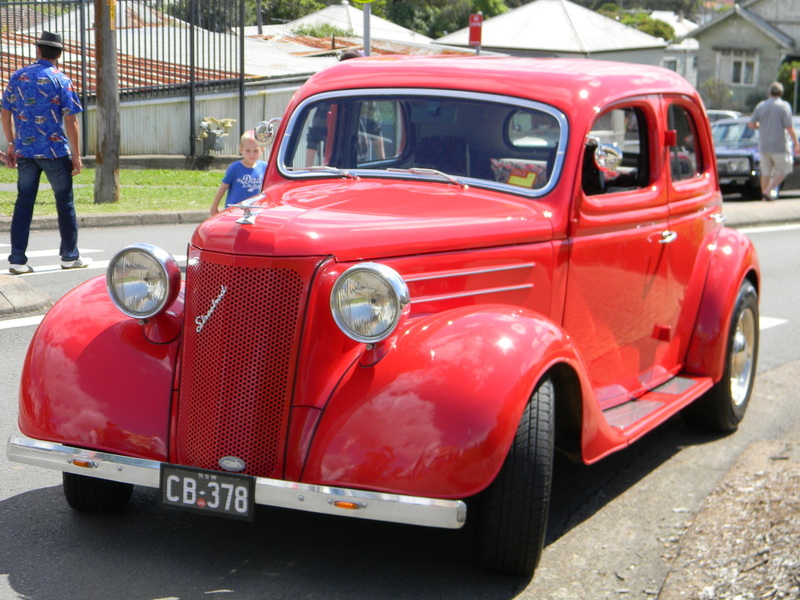 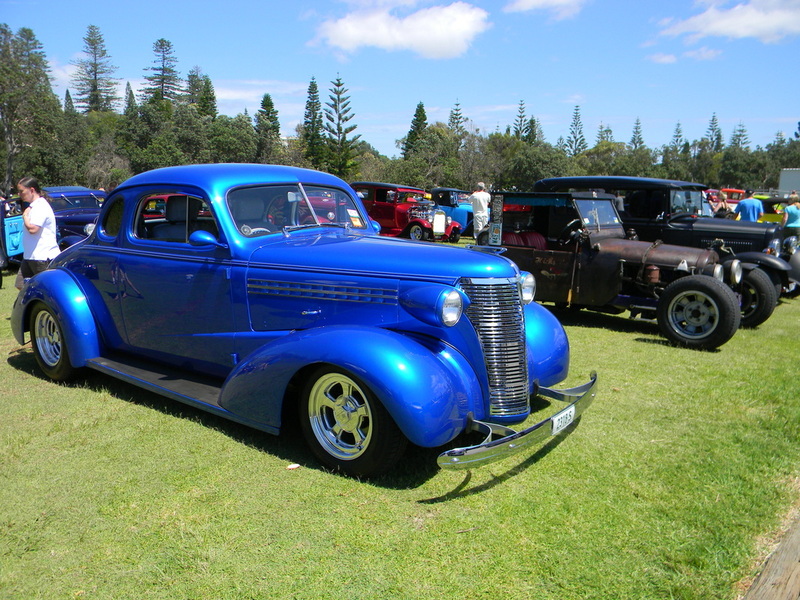 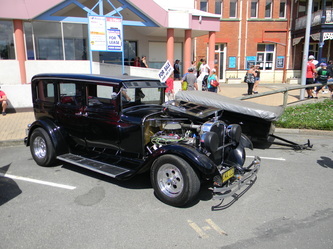 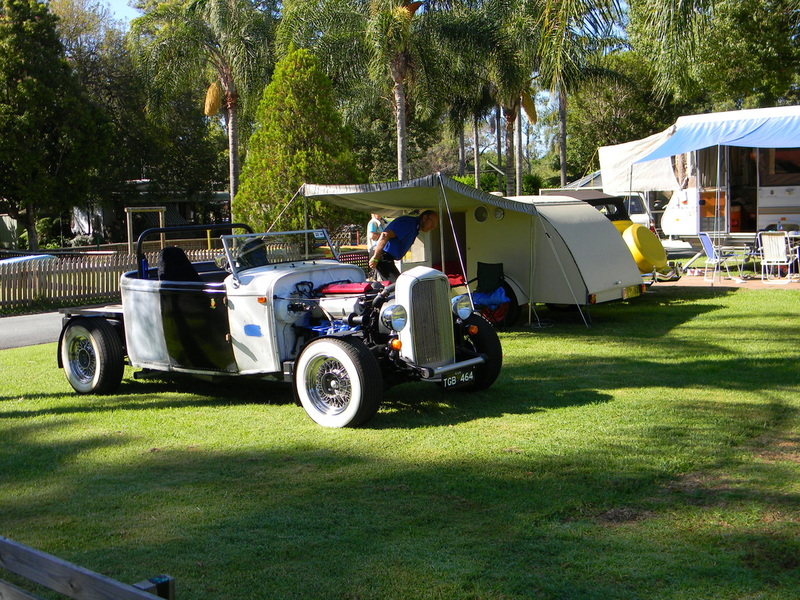 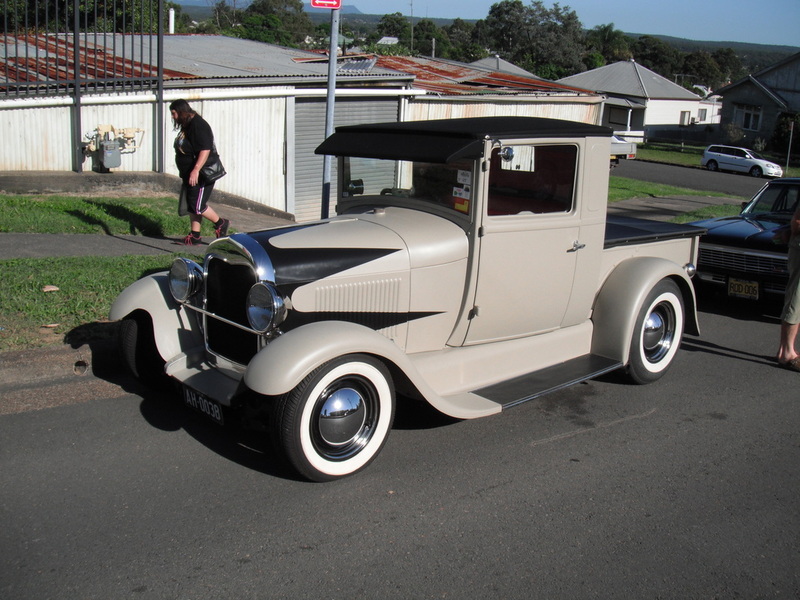 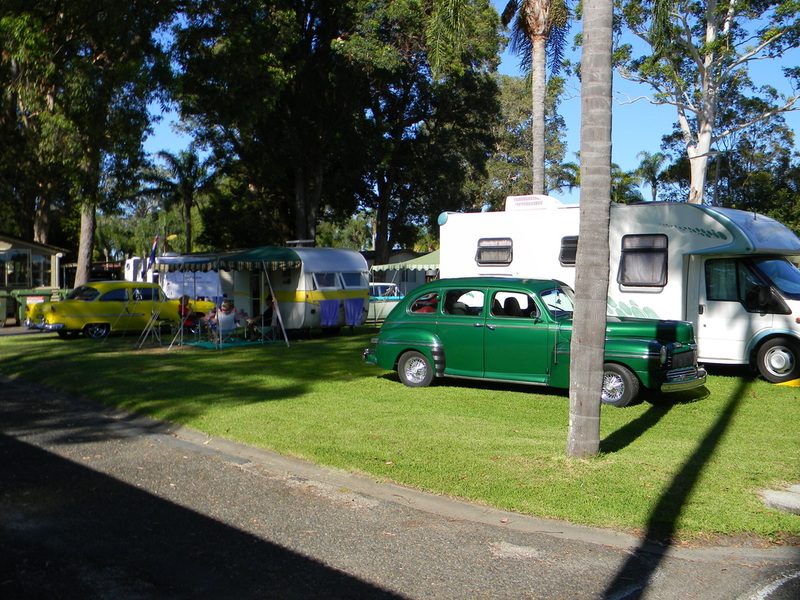 This page contains Coasters Hot Rod Club's 10th Annual Coastal Cruise at Port Macquarie, Kurri Kurri Nostalia Festival and Newcastle Super Boat Show and Shine. 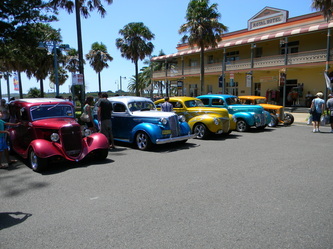 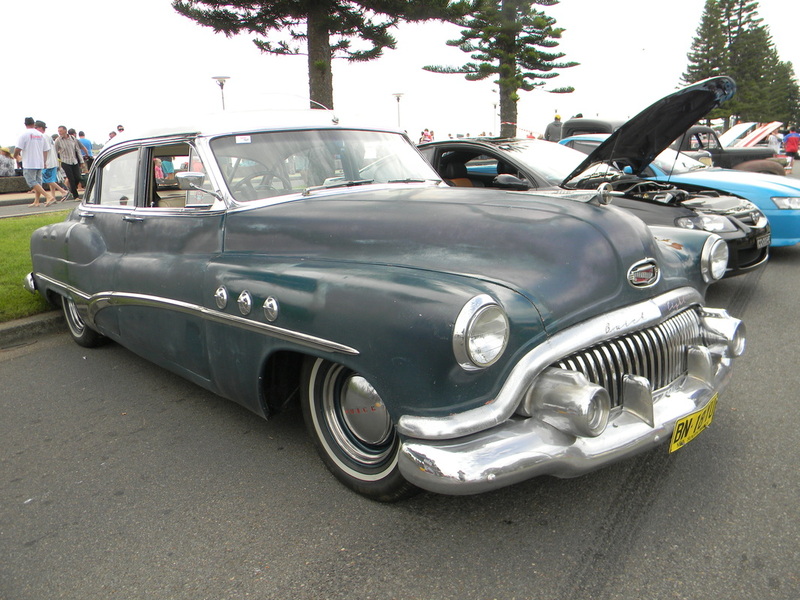 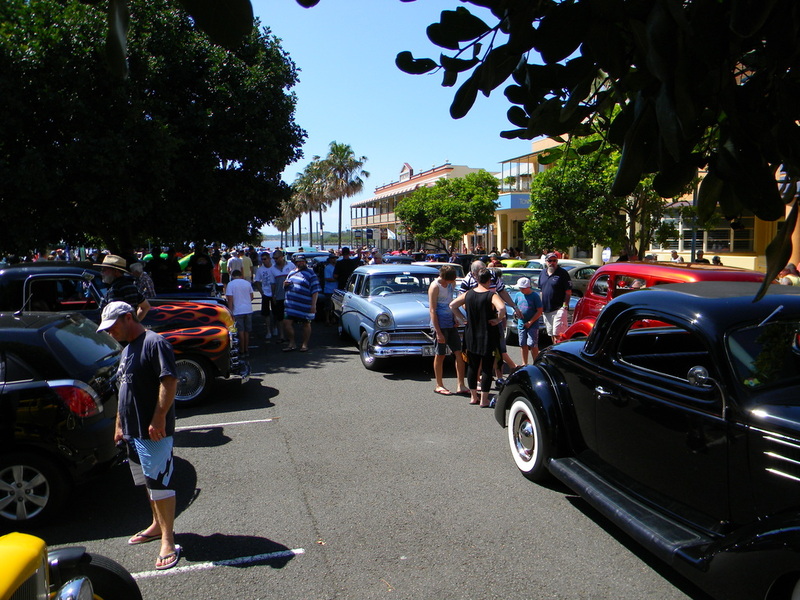 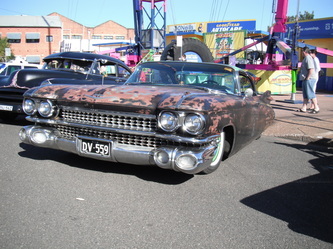 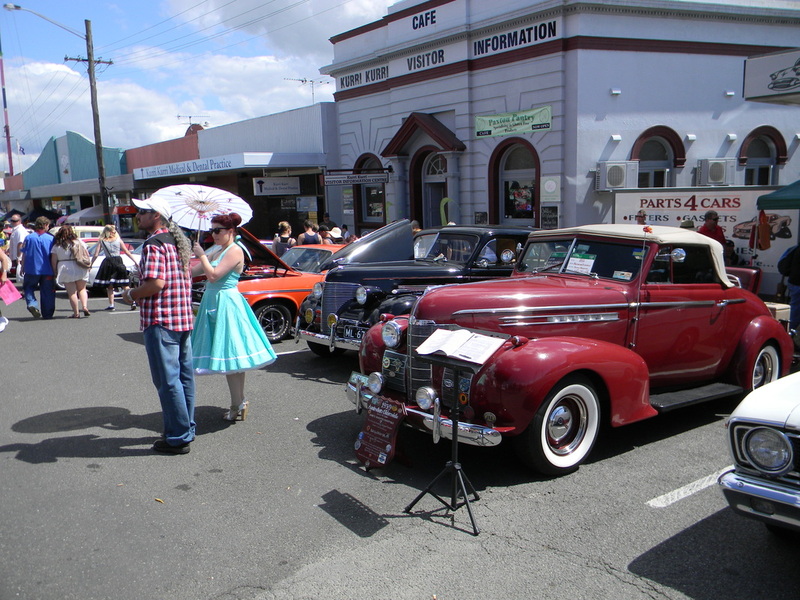 The Coasters 10th Annual Coastal Cruise at Port Macquarie was another very successful event and is growing in numbers every year. 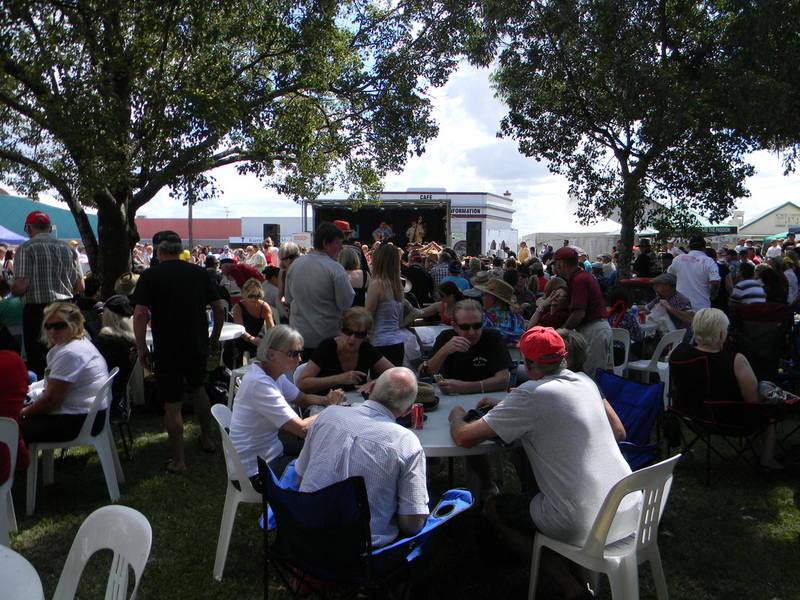 There were 120 registered entrants who enjoyed The Coasters hospitality and this year the weather was perfect for the event as it was much milder than previous years. Some of our members arrived on the Monday before the event and had a great few days cruising, opp shopping and fishing from the wharf. 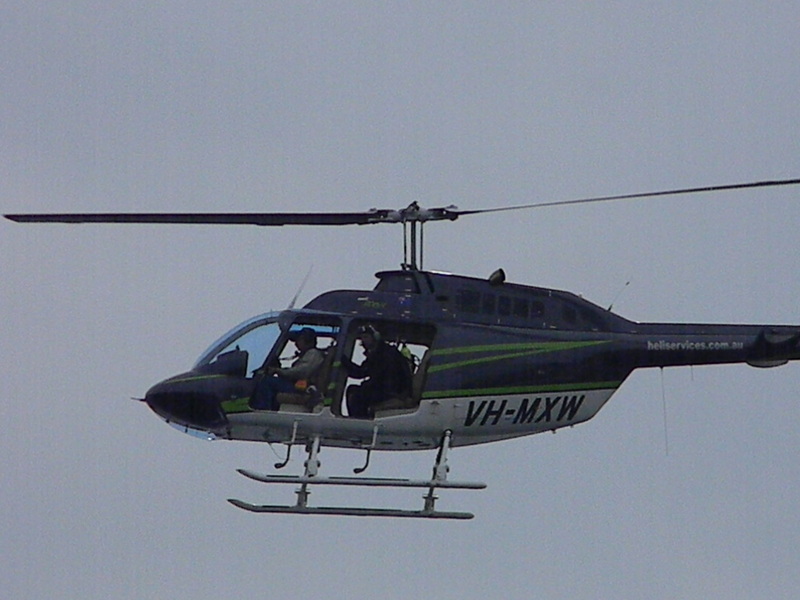 While fishing one day Col through out his line only for the end to come off the spool and for him to loose all his gear. Ron while fishing got caught in a line and wound in just managing to grab the last foot of this way wood line. He decided he had better get this way wood line out of the water and as he pulled it in this great bream ( 37 cm ) was on the end. 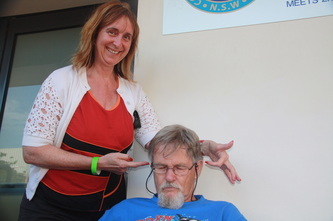 Well you would not believe it but when the hook was removed from the fishes gut it was Col's hook. 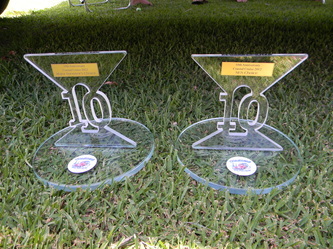 This on top of disturbing a camper when he arrived on the Monday evening, catching anchors and oyster leases after hiring a boat to catch more fish all added to an unforgettable week for Col.
We had 9 of our members rods registered in the event which was not enough to beat Easy Street for the best represented club this year. 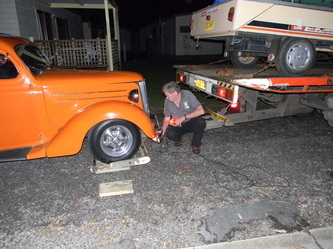 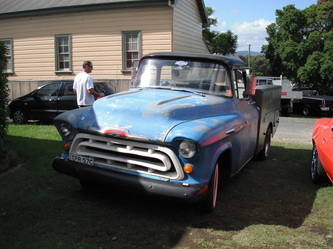 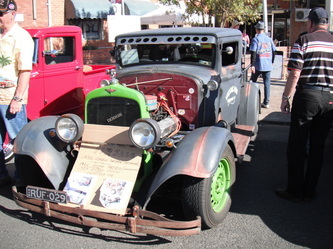 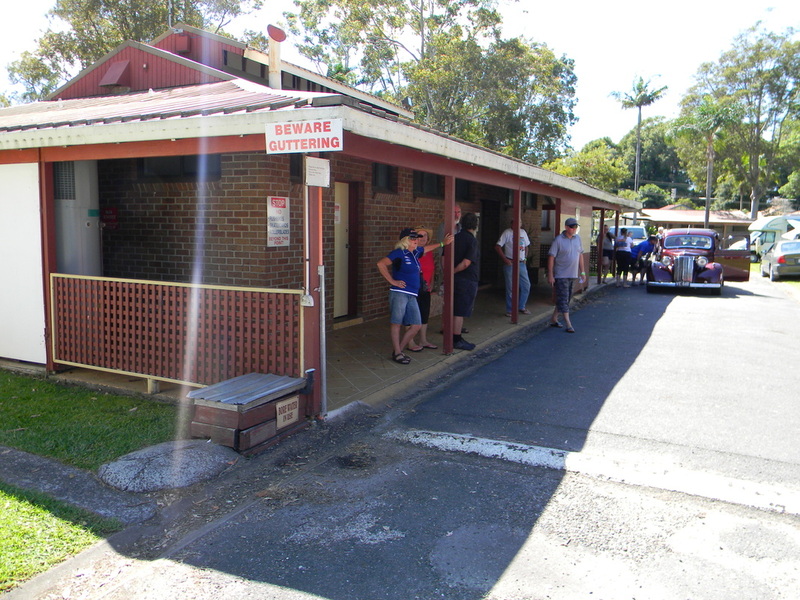 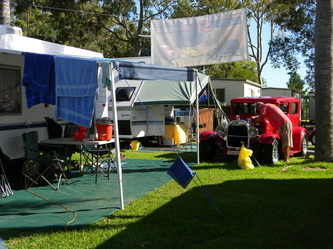 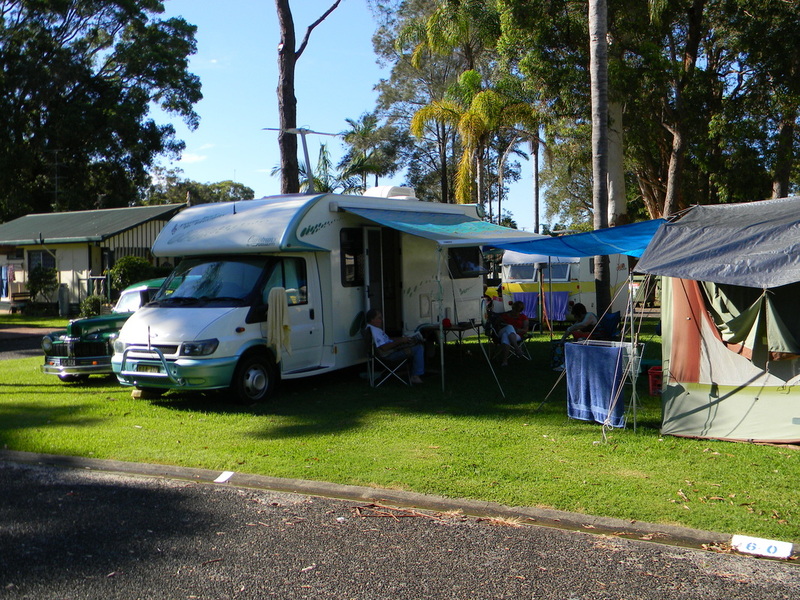 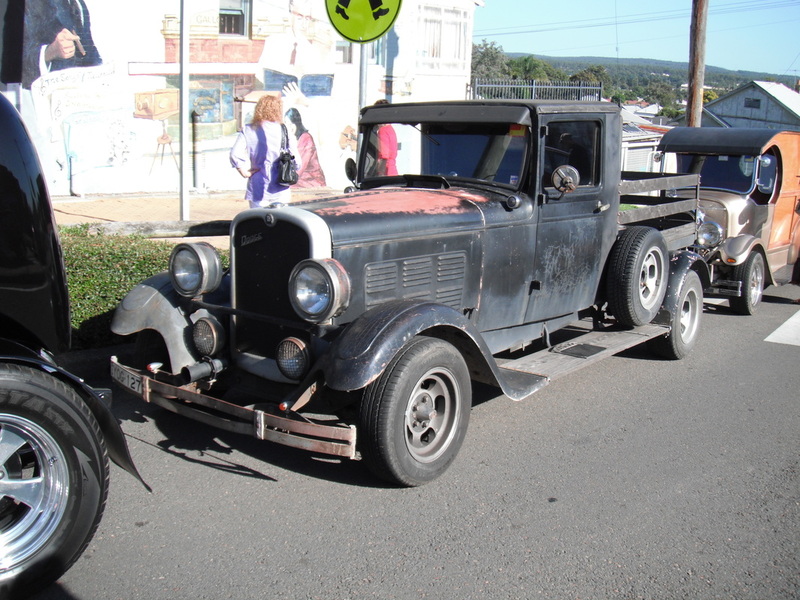 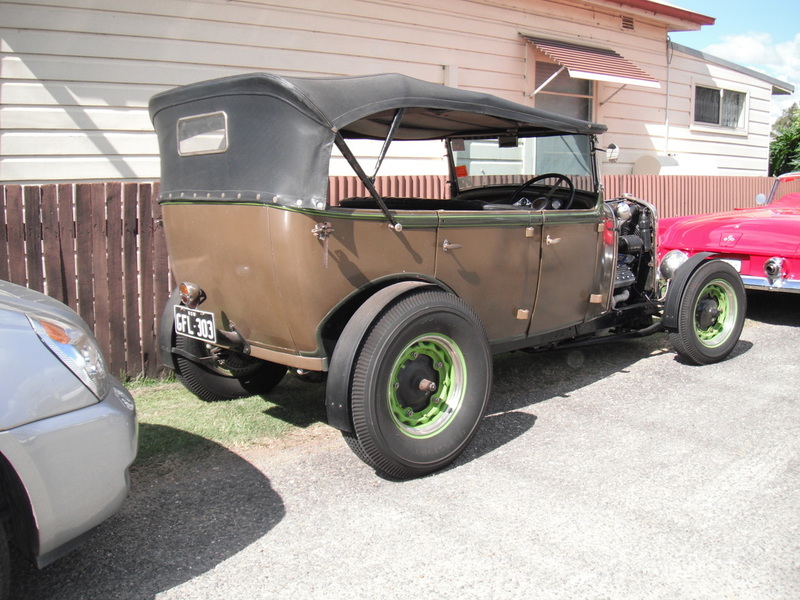 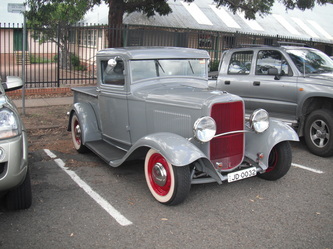 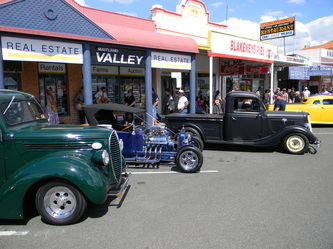 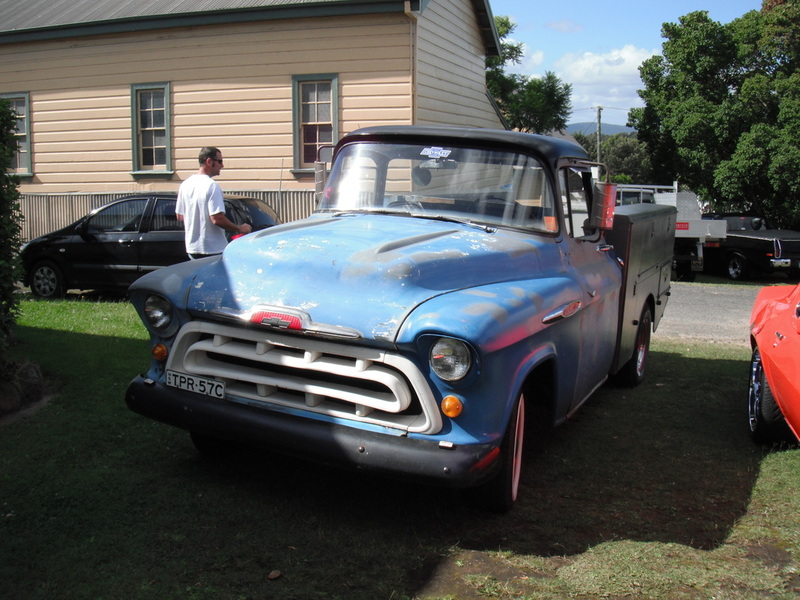 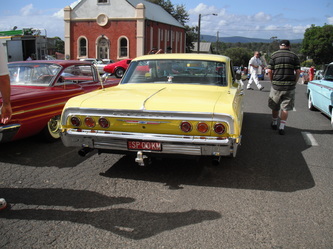 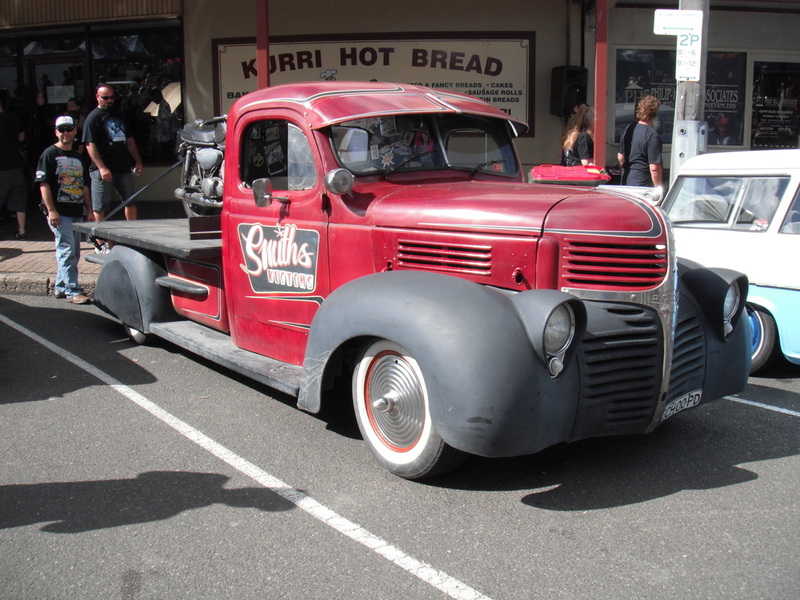 The hard luck story should have gone to Pete whose fuel pump decided to die at Bulahdelah. 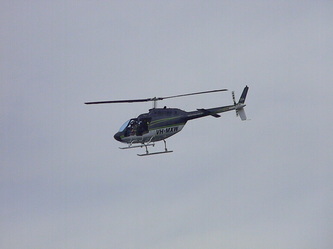 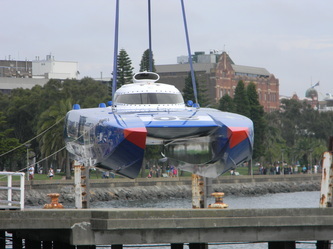 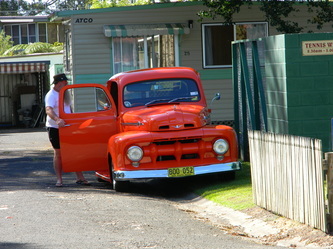 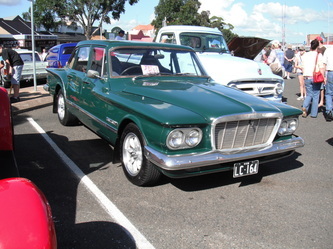 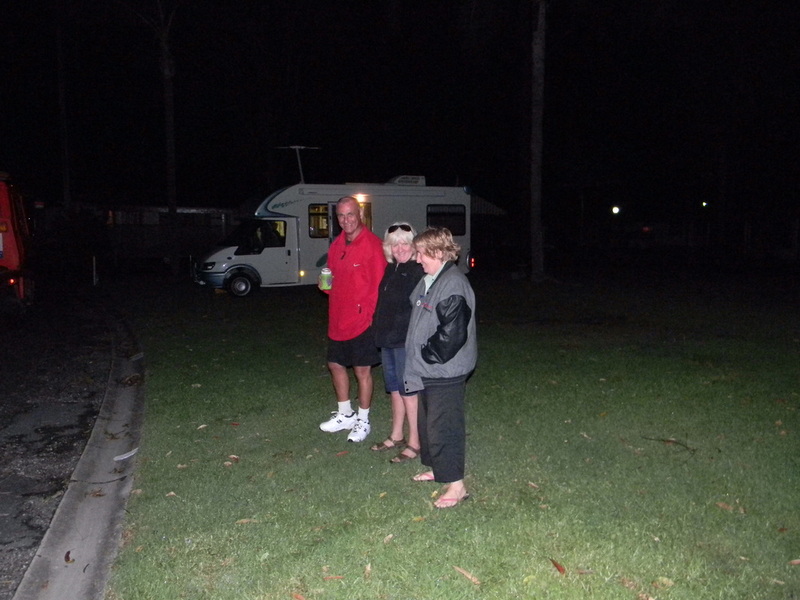 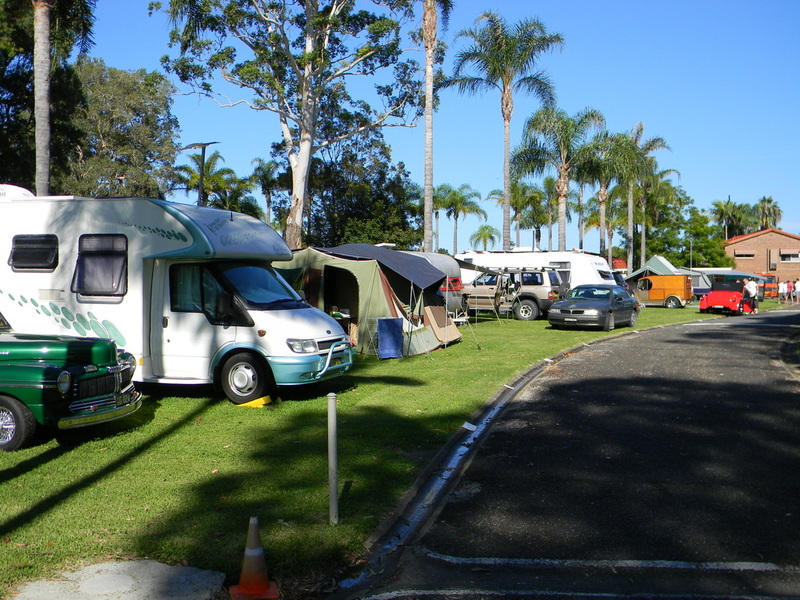 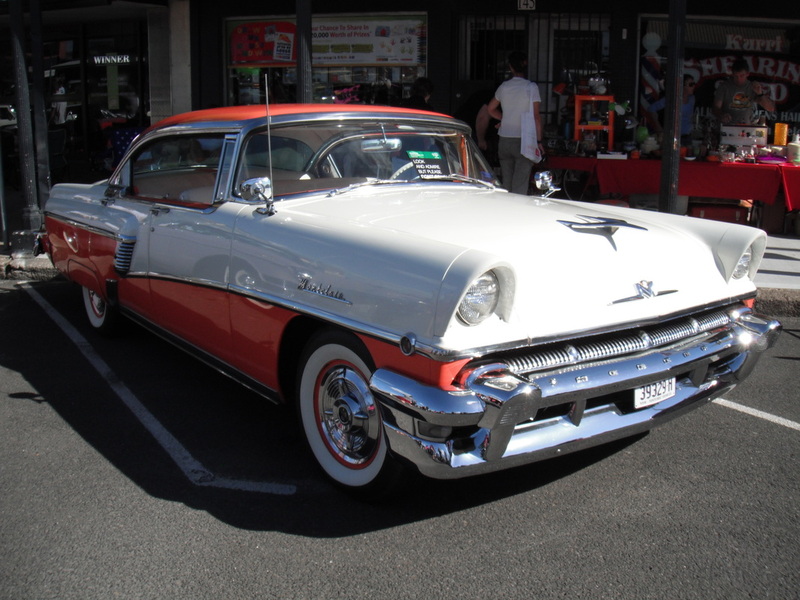 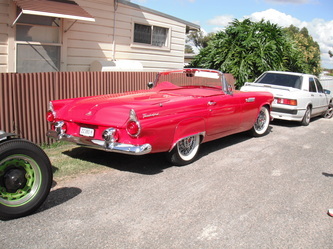 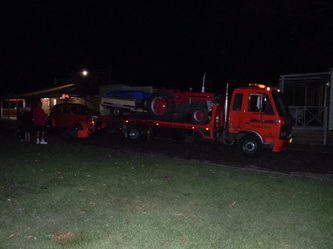 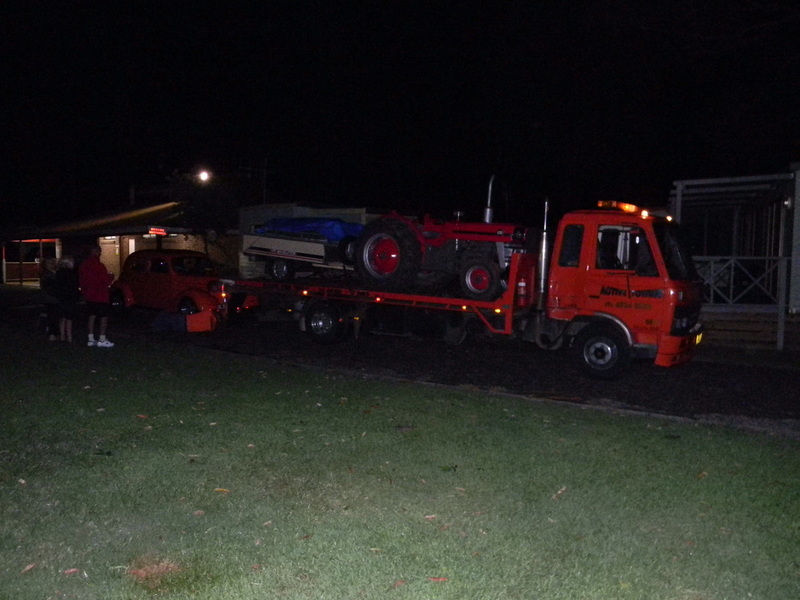 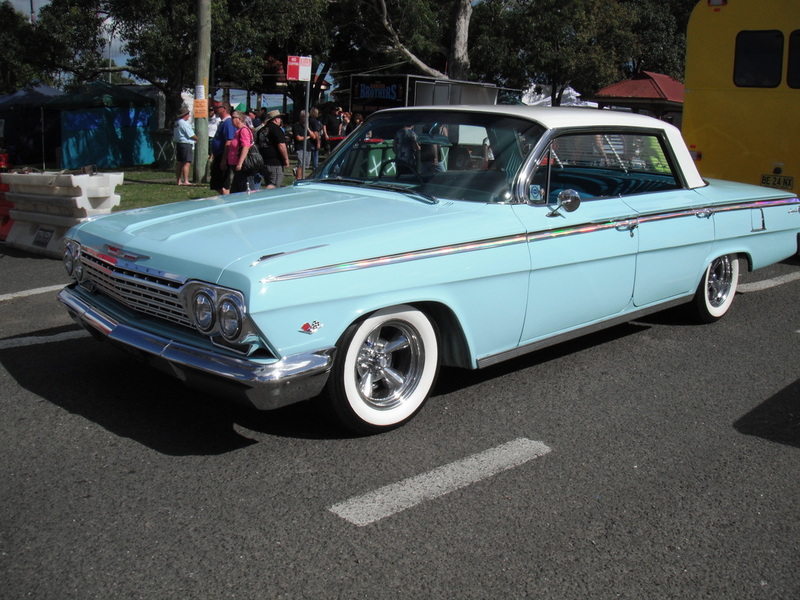 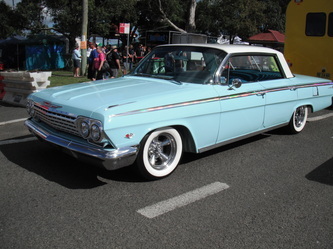 He managed to limp home buy a new fuel pump, have it installed and finally made Port Macquarie at 9:30pm that night. We must not forget that Bob did not make it to Port unscathed as he went through a ditch a bit fast at the Taree Service Centre only to shear off 4 of the 6 bolts that hold the tow bar to the chassis. One of our members, Ron, for the second year in a row, was caught sleeping in his chair in the middle of the afternoon. 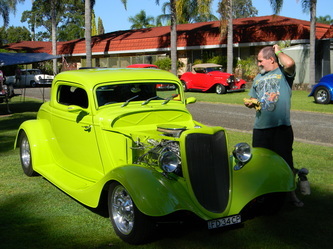 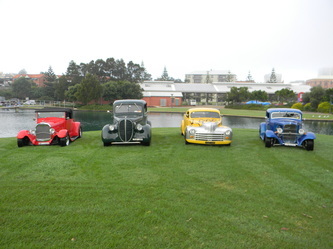 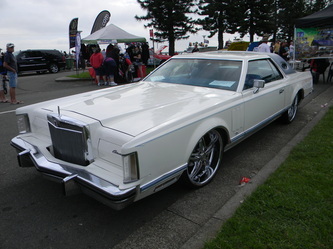 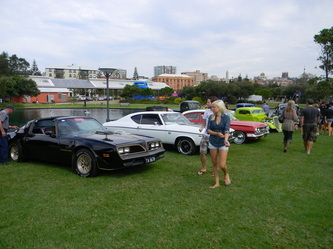 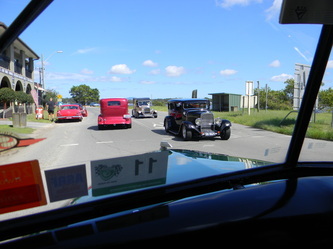 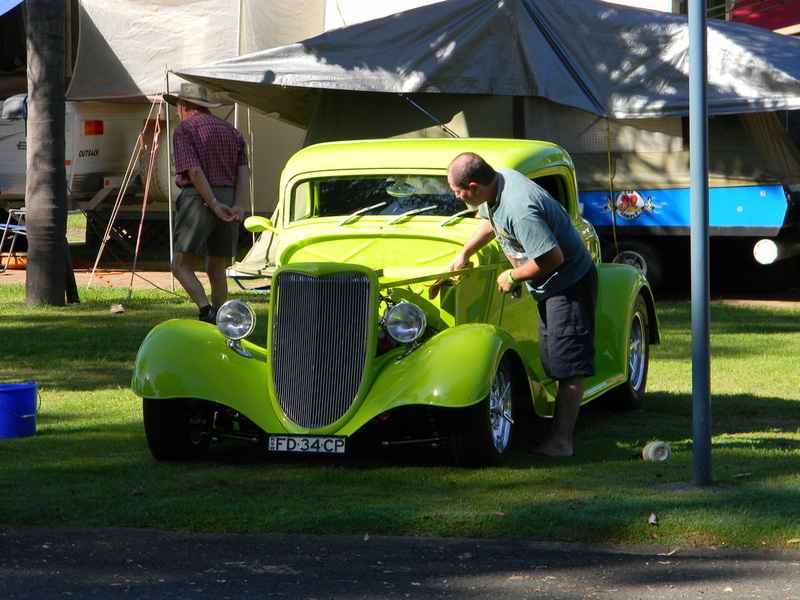 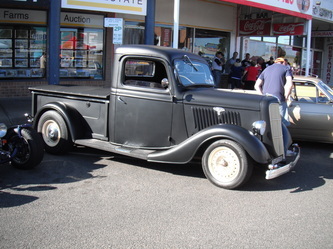 This time it was at the show and shine with spectators everywhere and unkind photographers having fun. 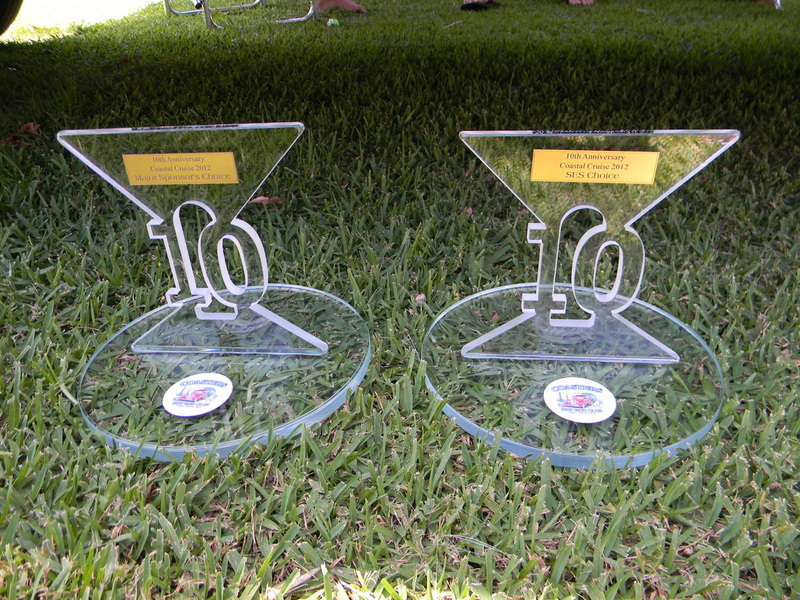 On presentation day the Alexanders cleaned up with Bob winning SES choice and Glenda winning major sponsors choice which topped off another terrific week at Port Macquarie. All our members that went have rebooked for next year, so it shows this is a great an event. 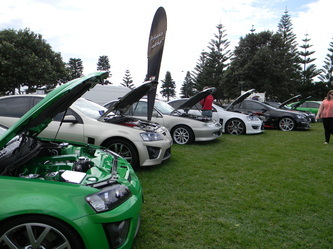 This years Show and Shine on the Sunday saw so many cars attend that not all vehicles were able to fit into the allocated area. Therefore all the side streets ended up having show cars parked and this added to the whole atmosphere. 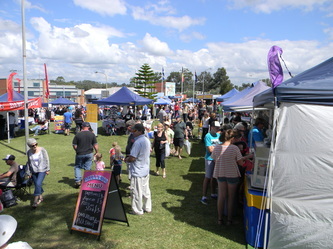 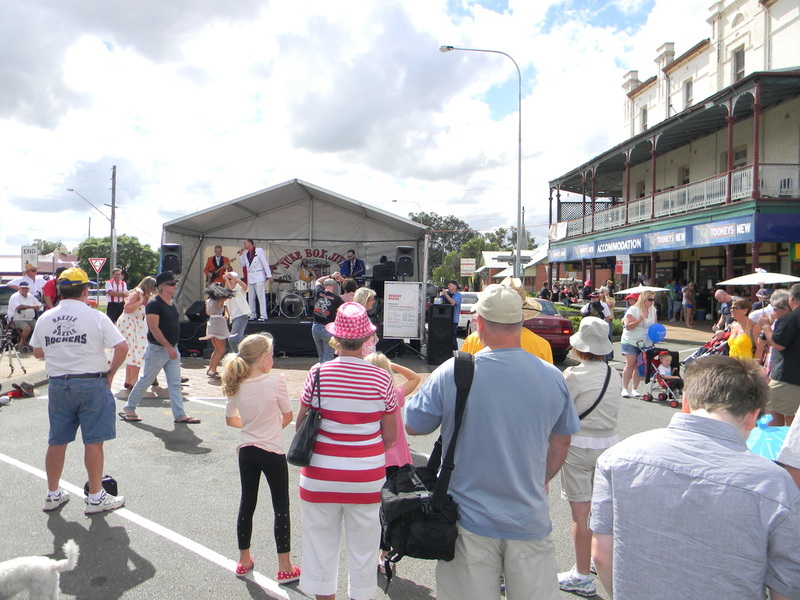 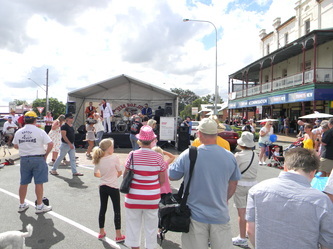 On the day the weather was perfect the crowd was large and everyone who attended the event thought it was the best Kurri Kurri Festival to date. 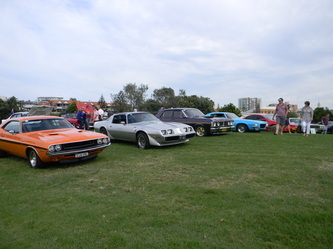 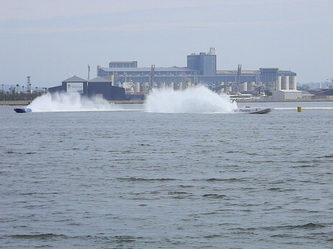 We had 20 of our members turn up on the day and 13 of our club rods, two of which were in the top 10. Congratulations Claude and P2. 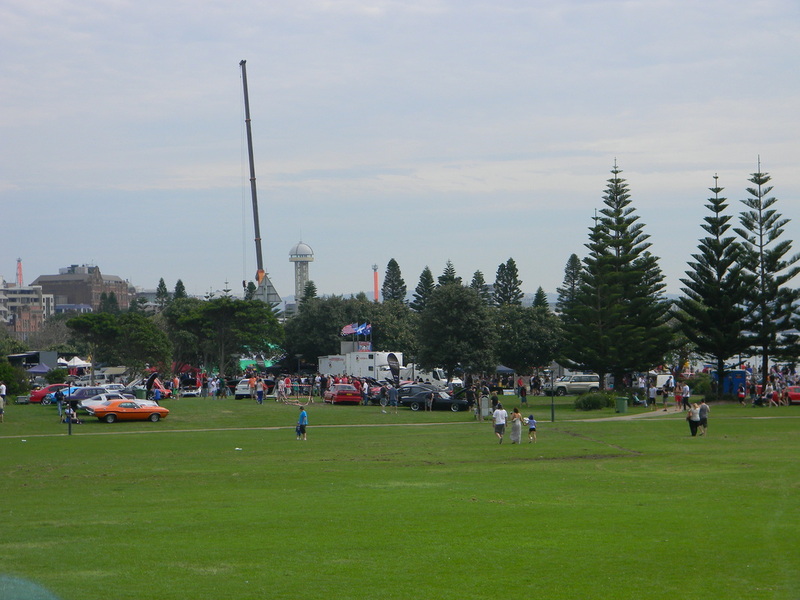 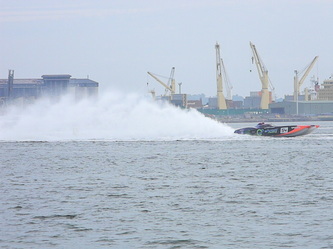 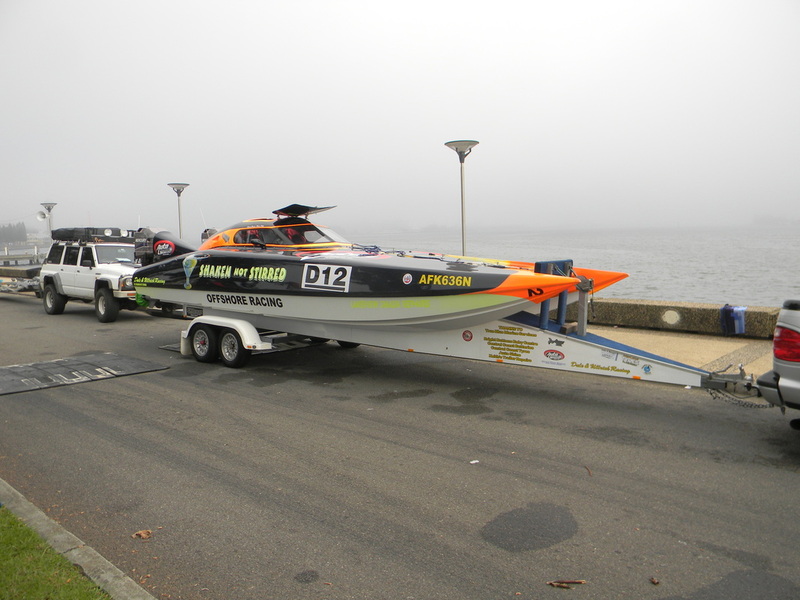 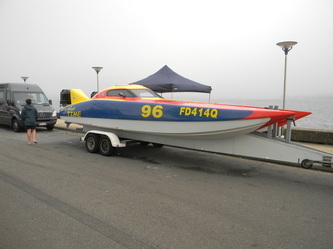 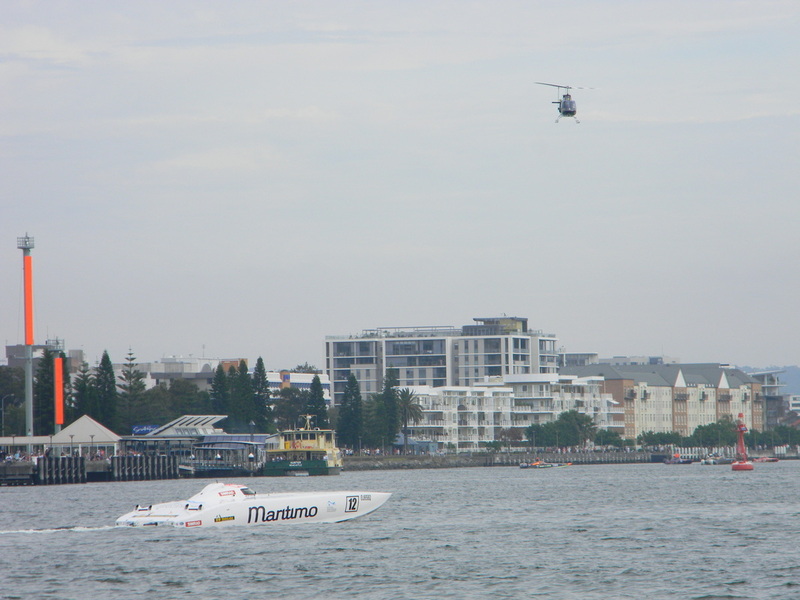 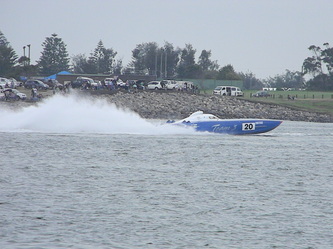 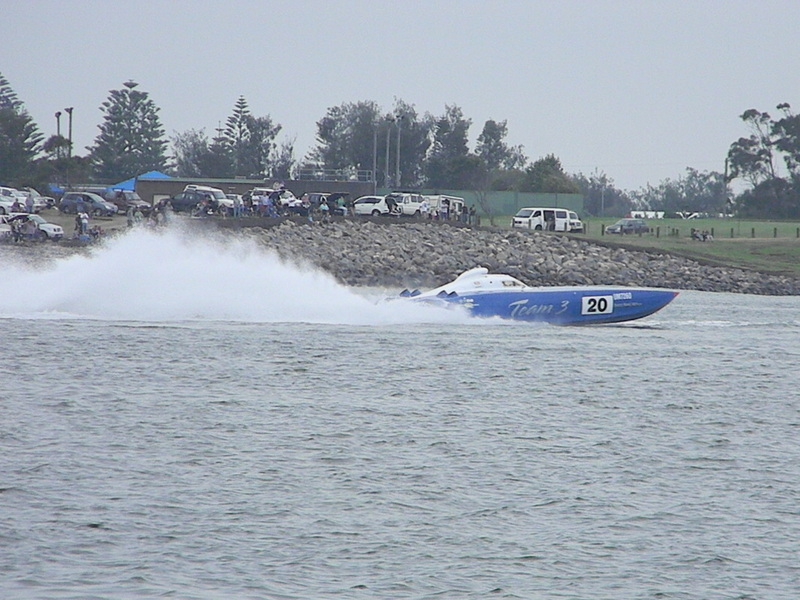 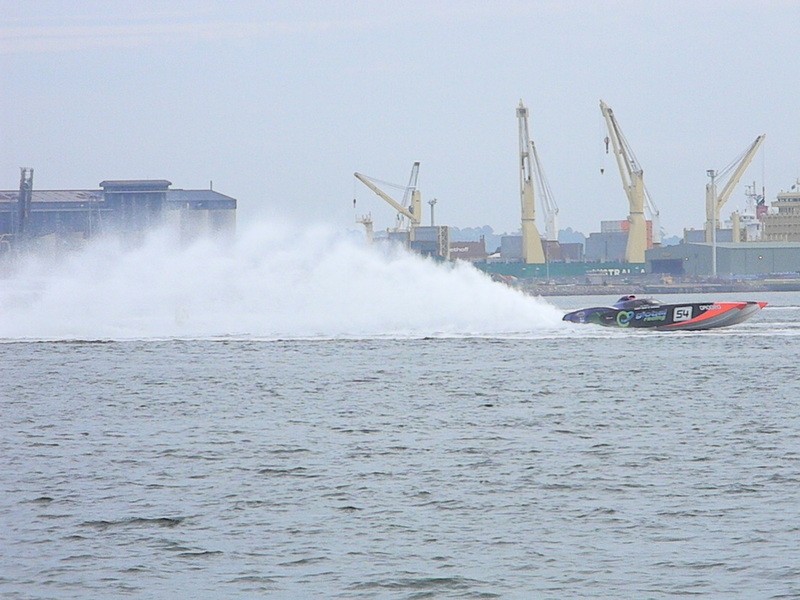 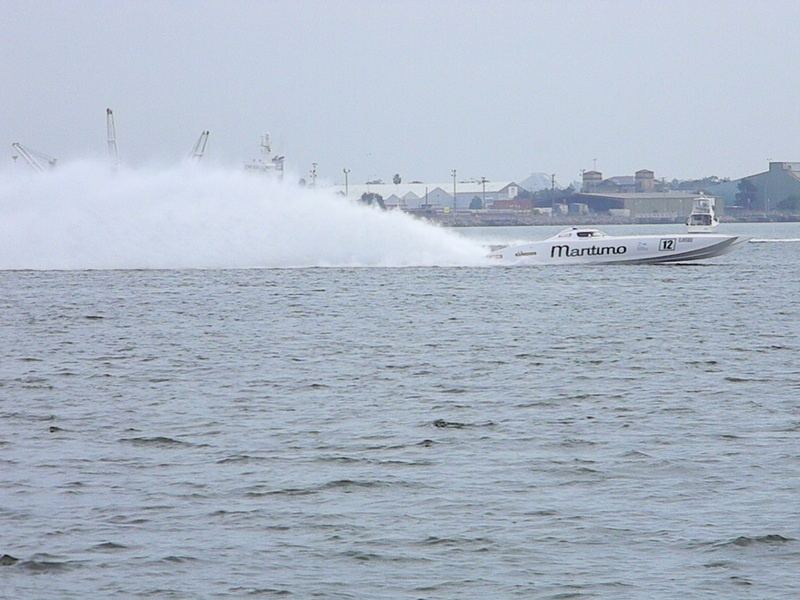 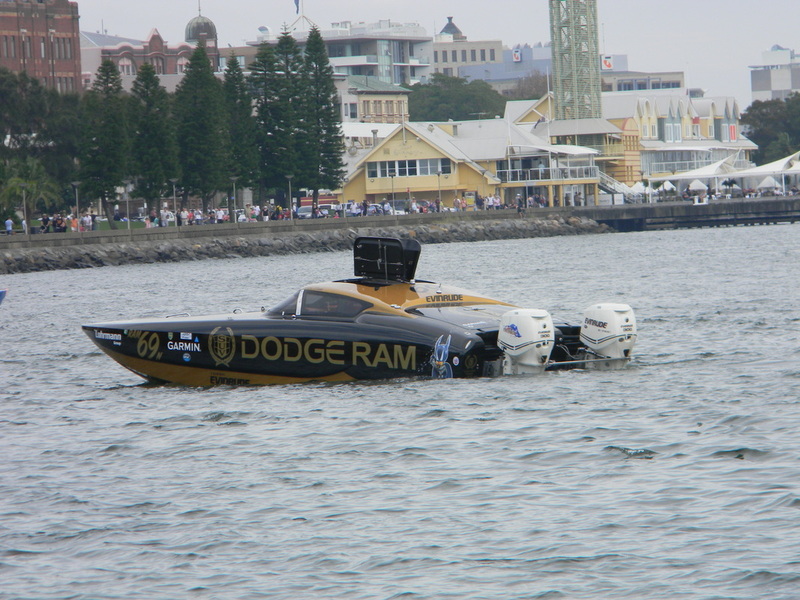 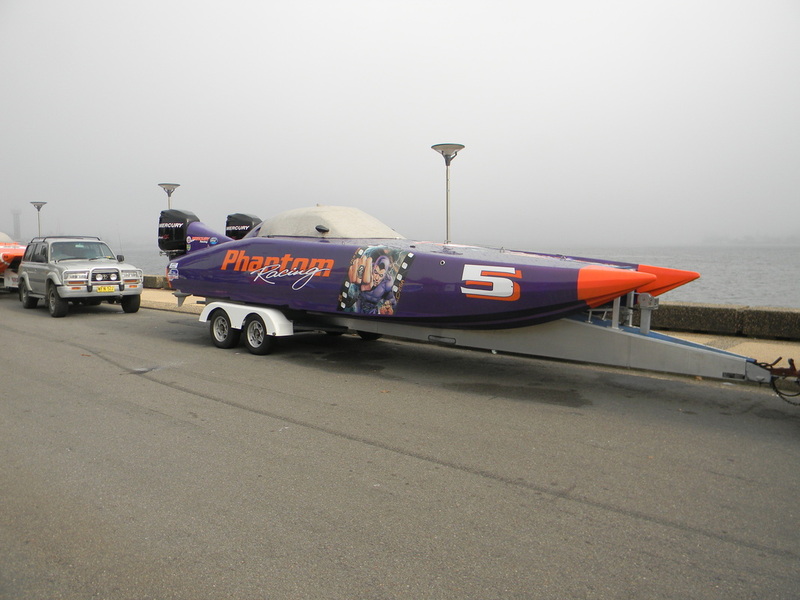 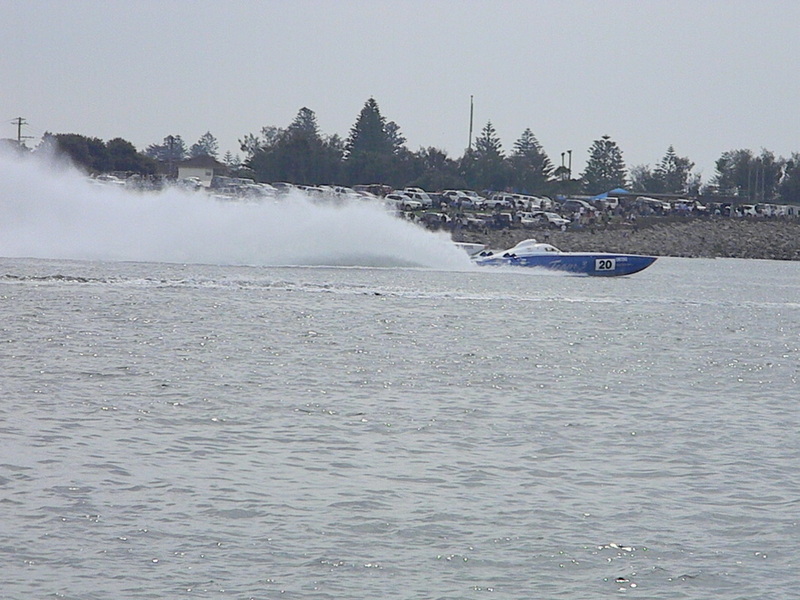 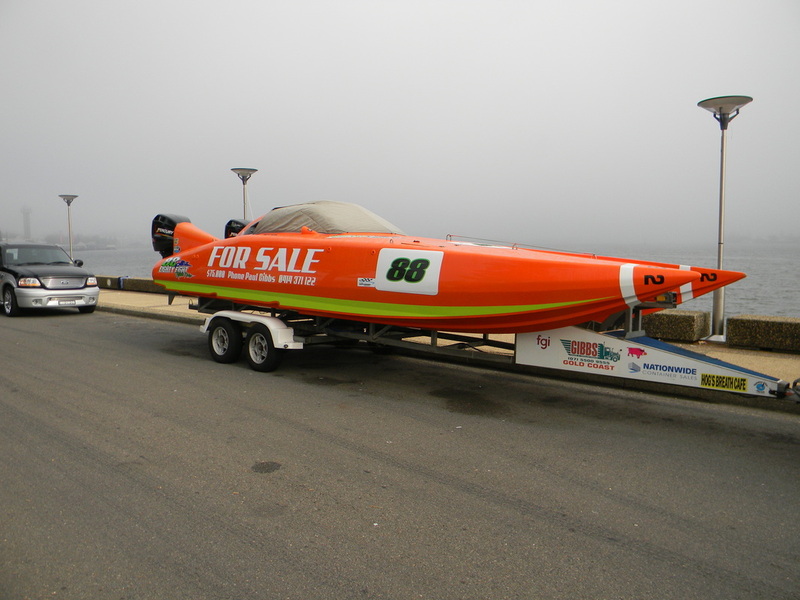 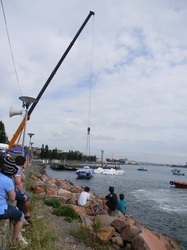 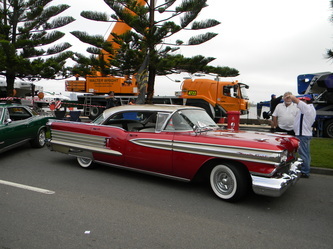 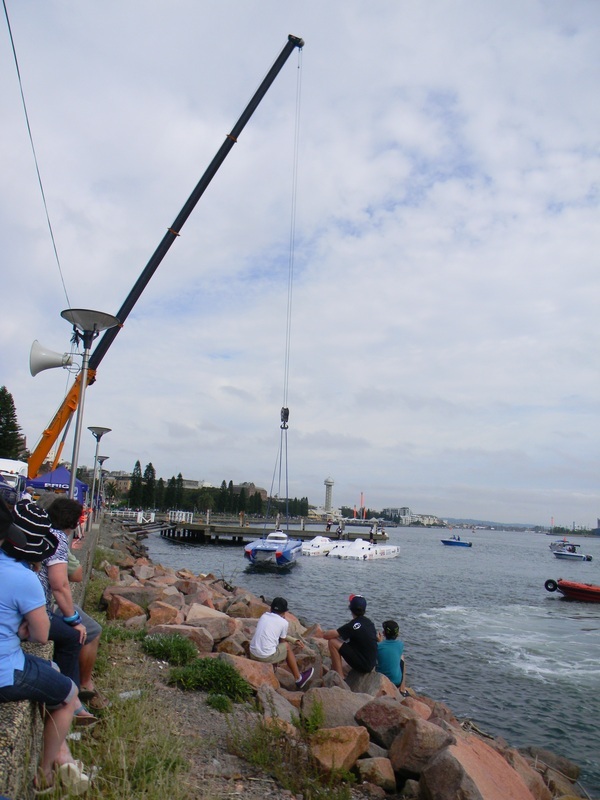 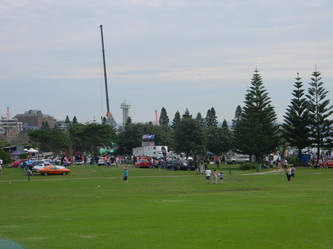 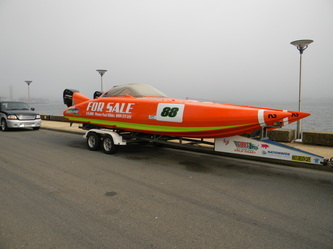 A foggy start to the day did not stop a good crowd coming to Newcastle foreshore to see the Super Boat race and to look at the cars attending the show and shine. Five of our members went to the event and enjoyed the sunshine when it come out. 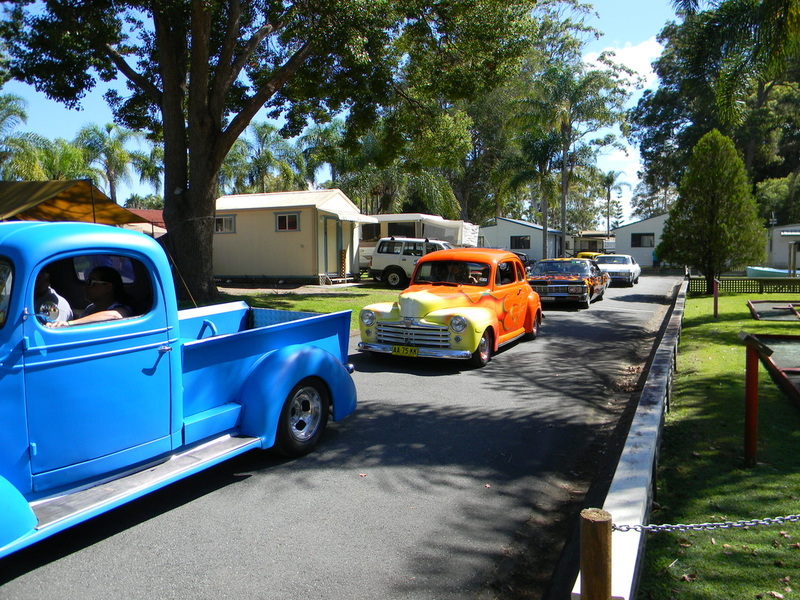 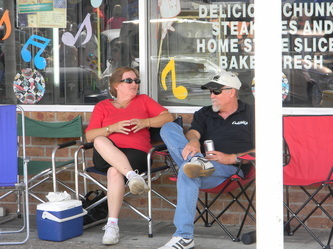 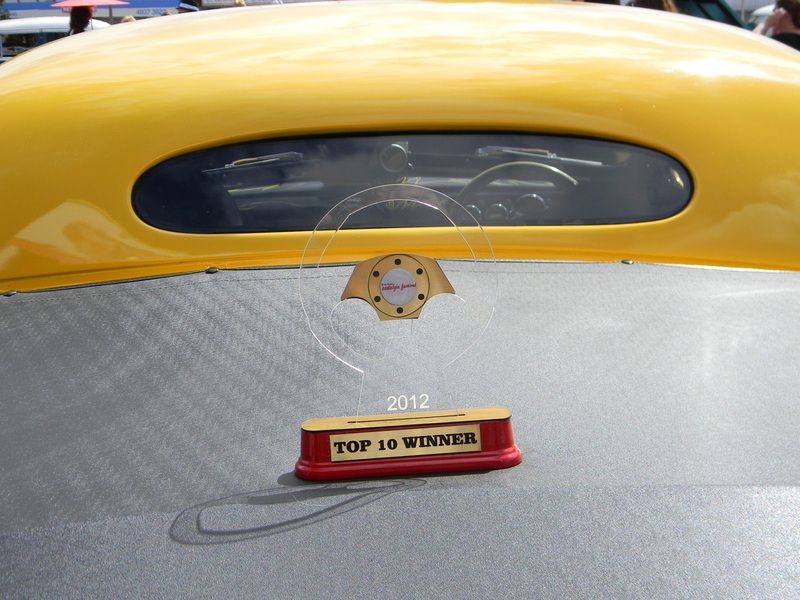 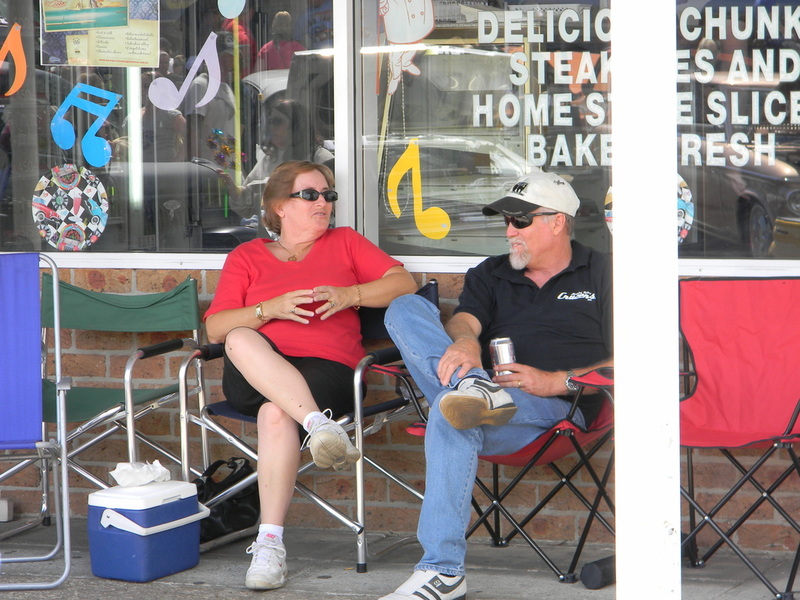 The day turned out to be very relaxing and those attending had a good time which was even made better when Claude won best Hot Rod.